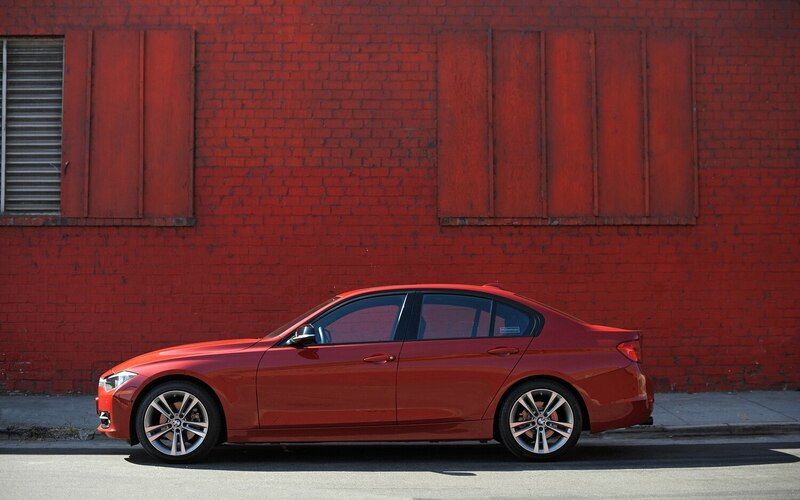 I wish I hadn’t driven this 335i. 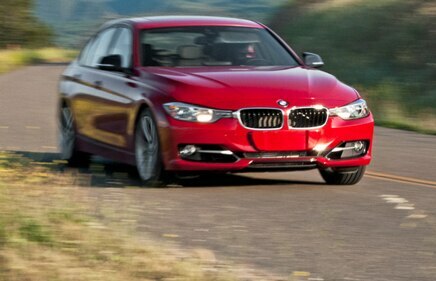 I was fine, happy even, with our choice of a 328i as our Four Seasons test car. 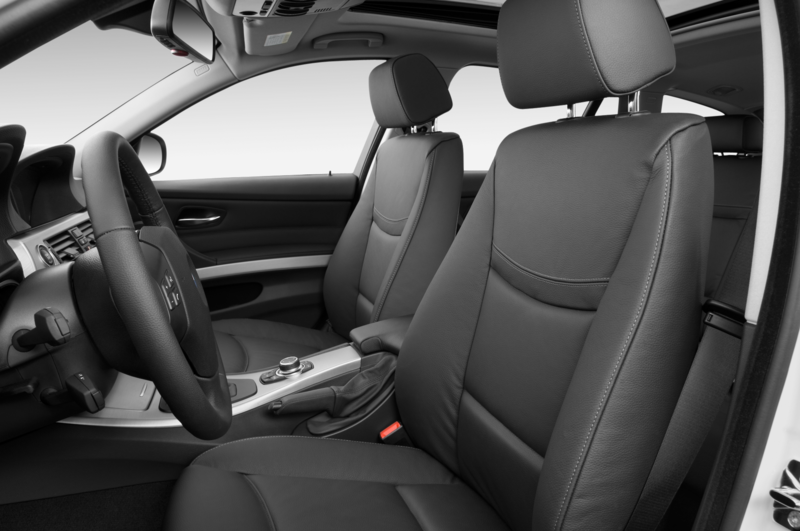 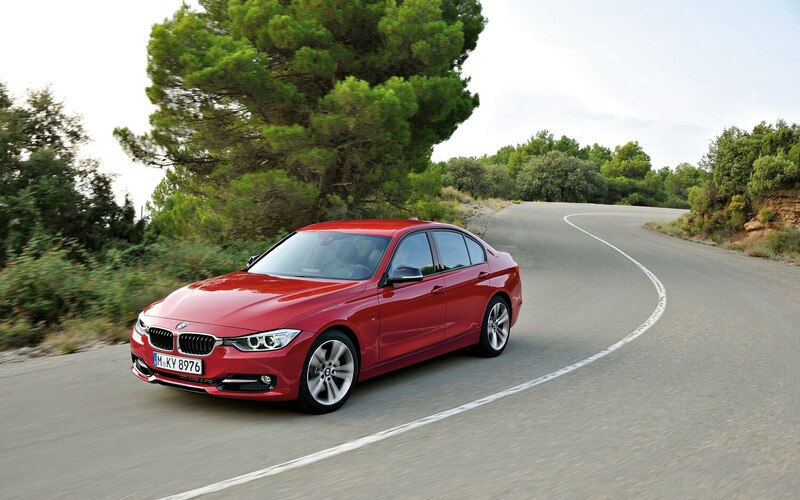 The new four-cylinder is plenty powerful, and its excellent fuel efficiency is oh so au curant. 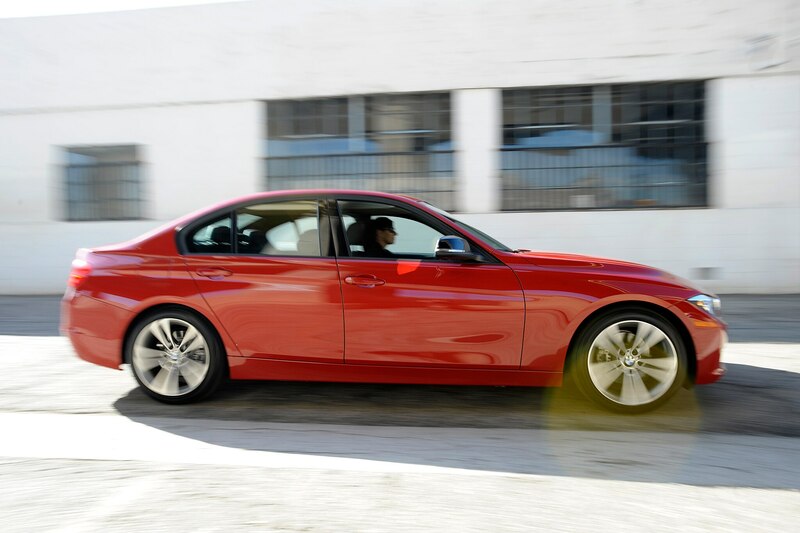 But a quick spin in the 335i has me longing for the sweet cry of BMW’s in-line six. 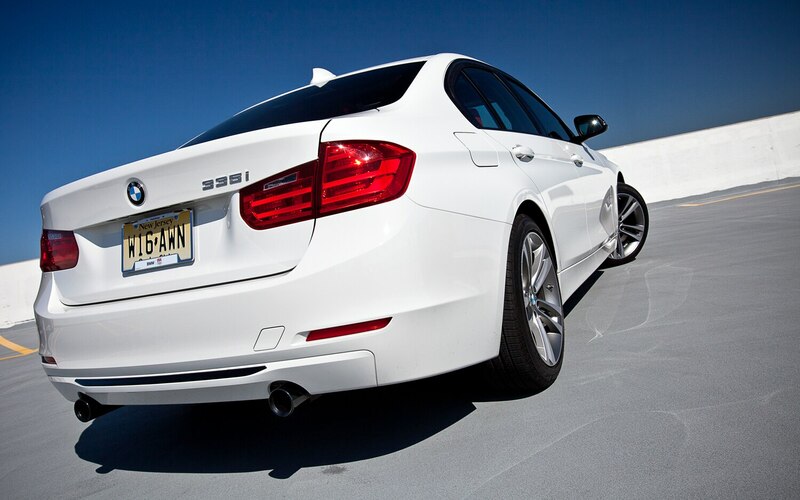 It’s not the extra muscle, although 300 hp certainly has the ability to charm. 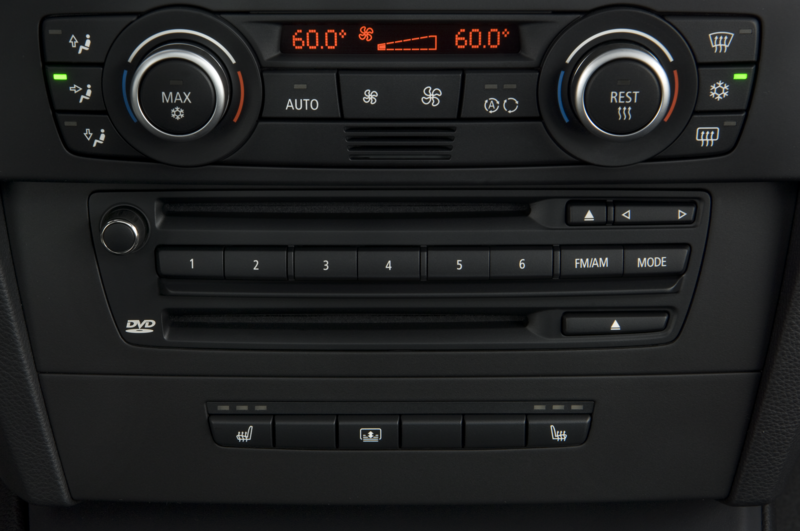 Rather, the appeal of the six has everything to do with sound and feel. 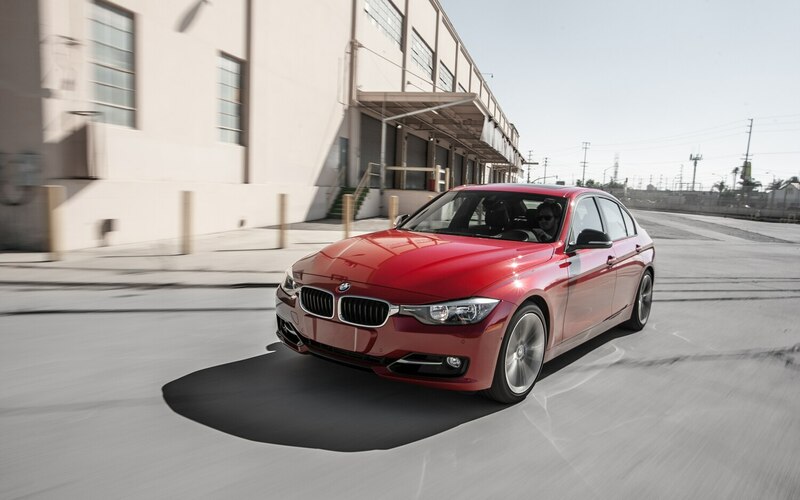 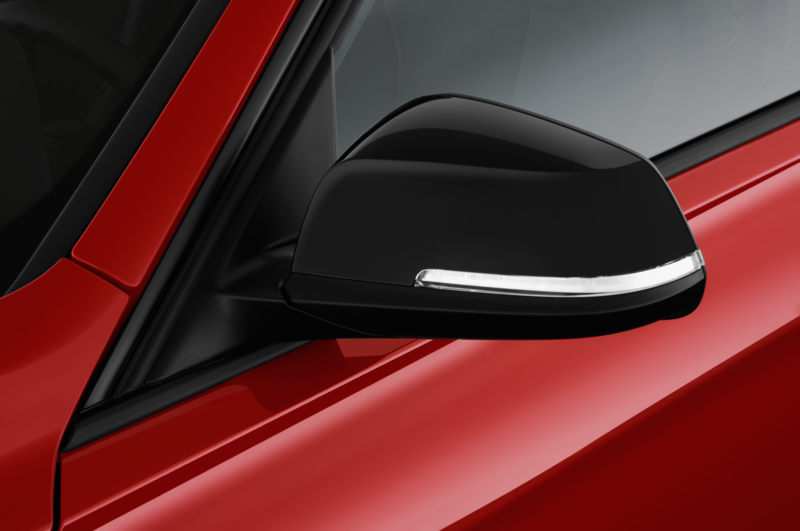 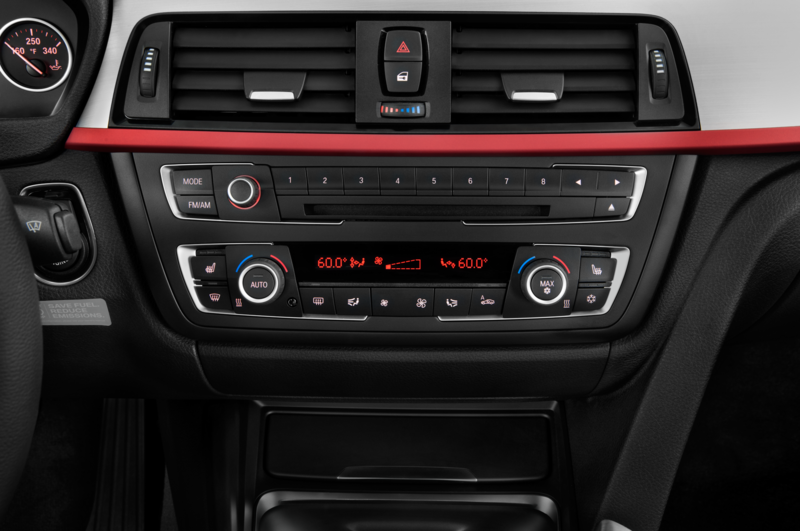 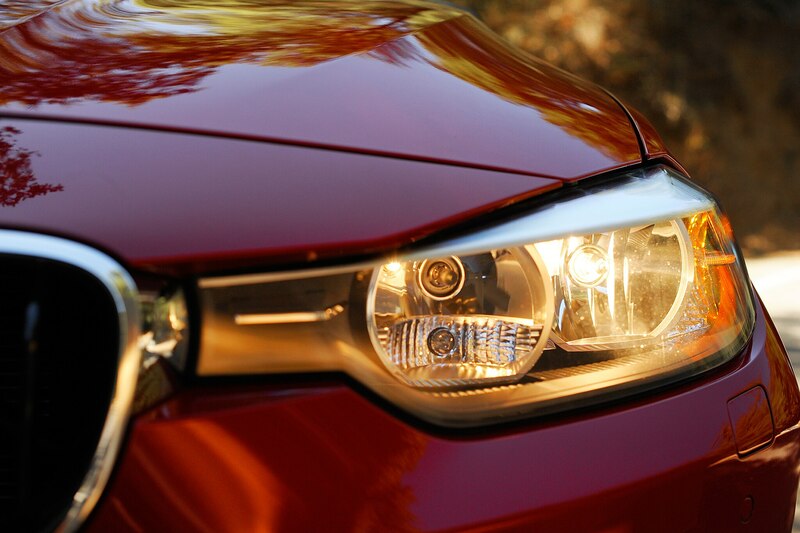 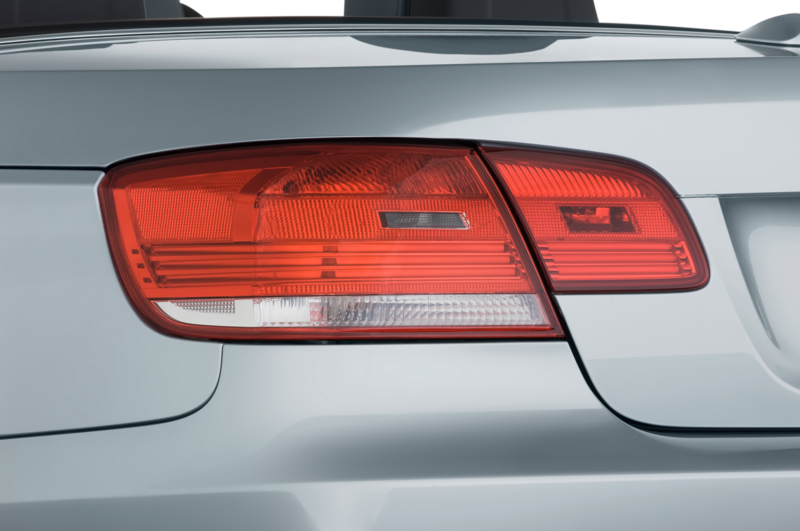 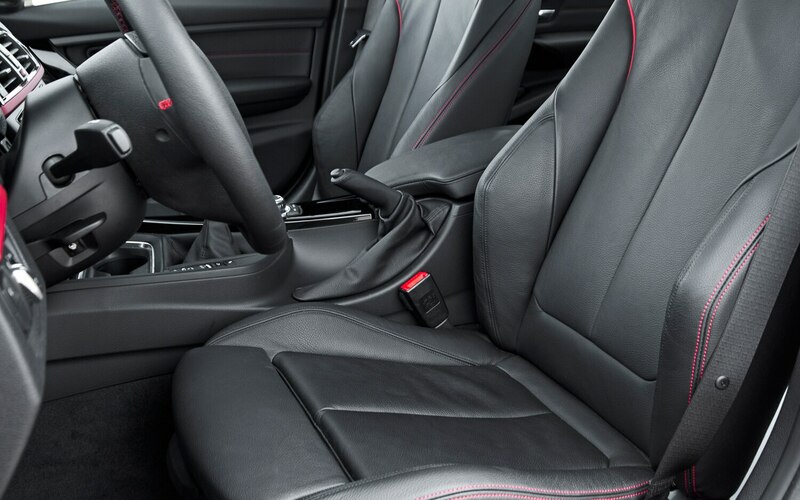 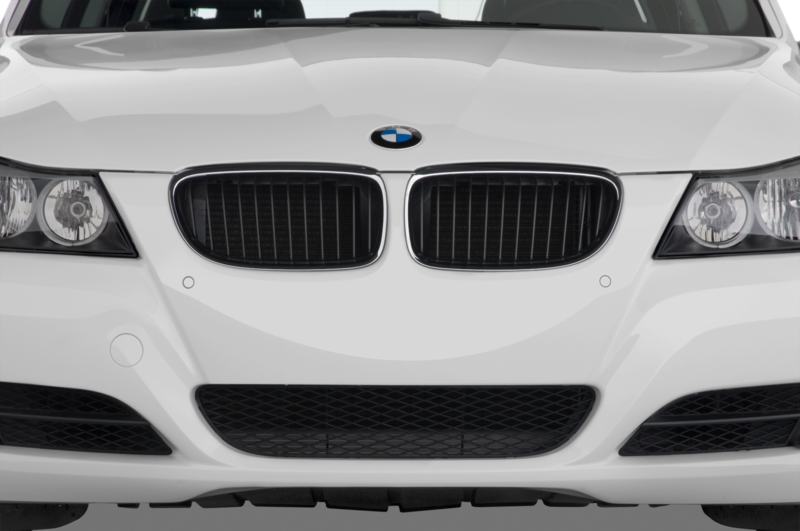 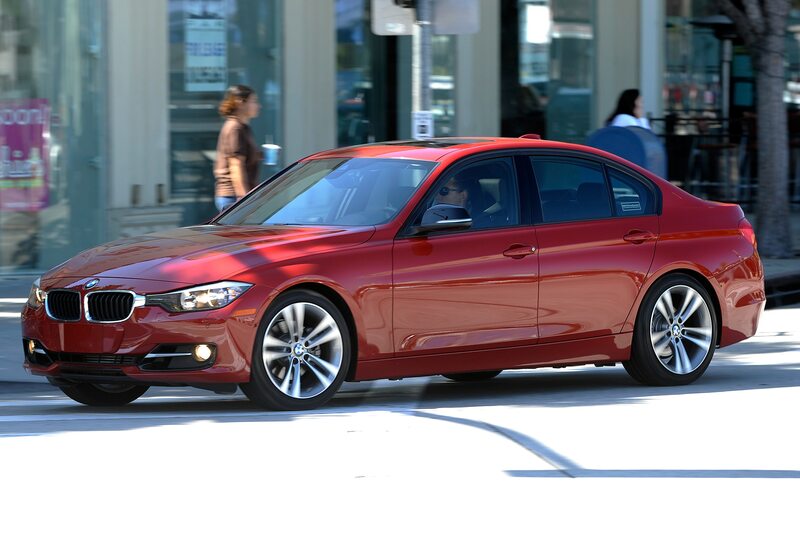 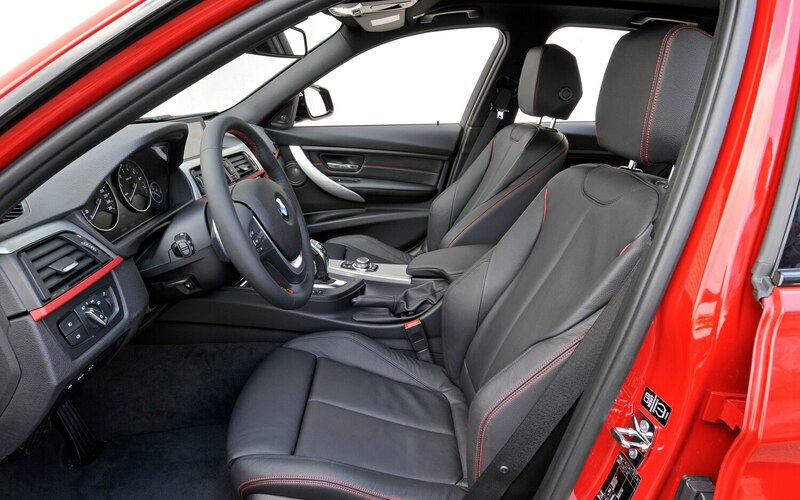 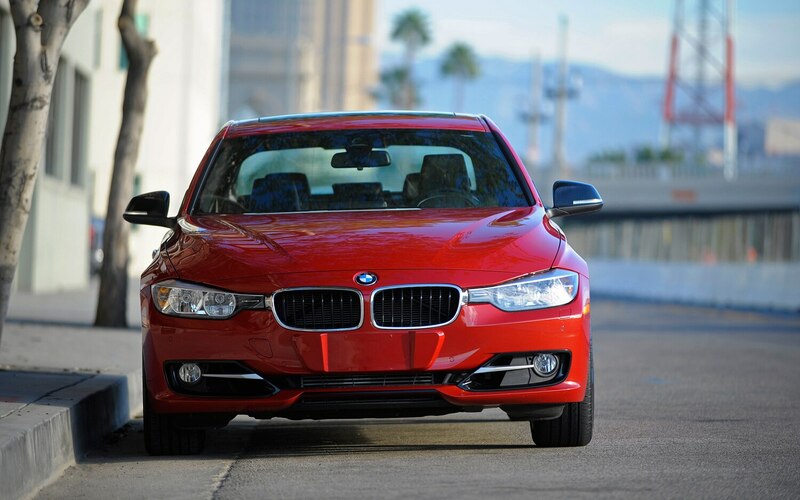 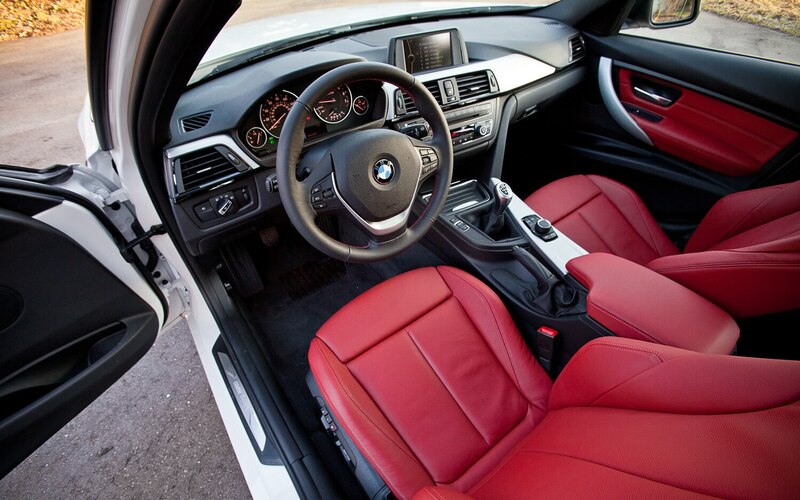 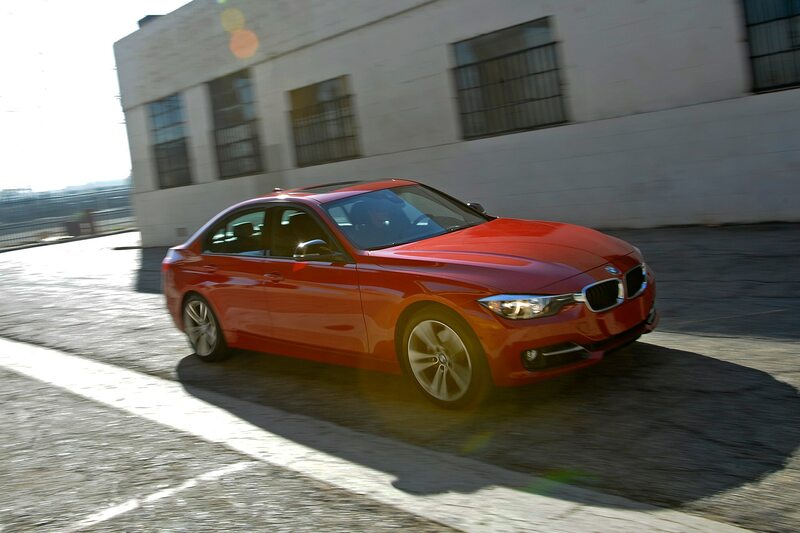 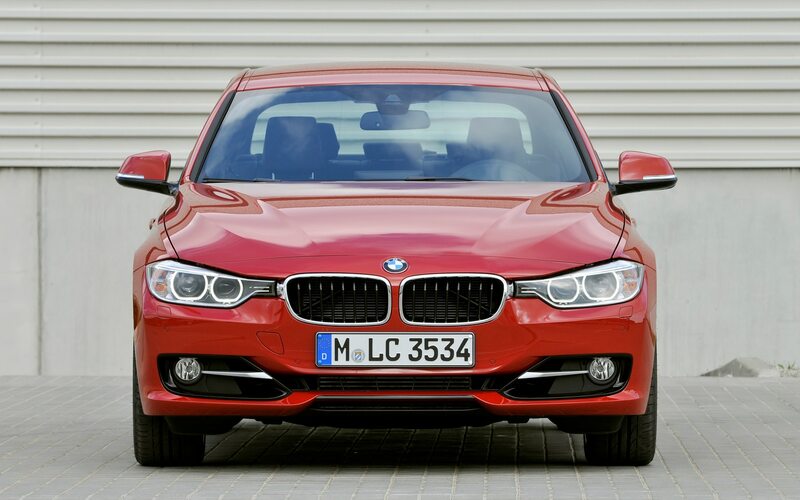 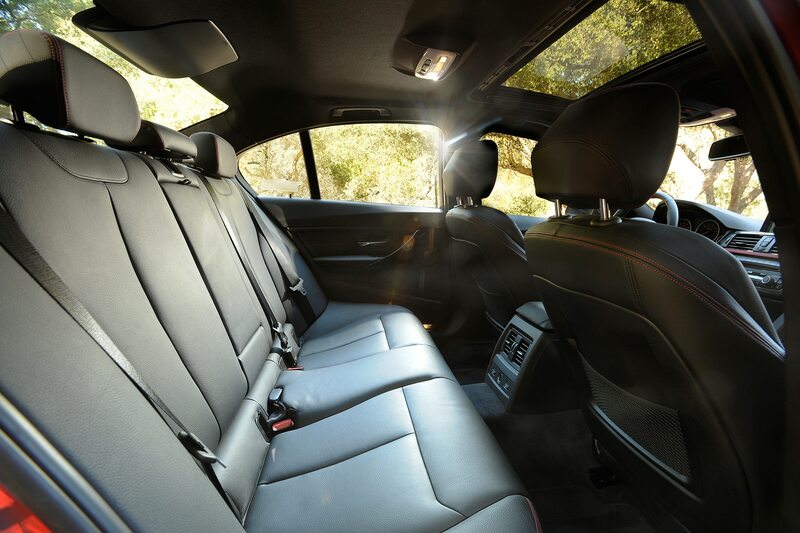 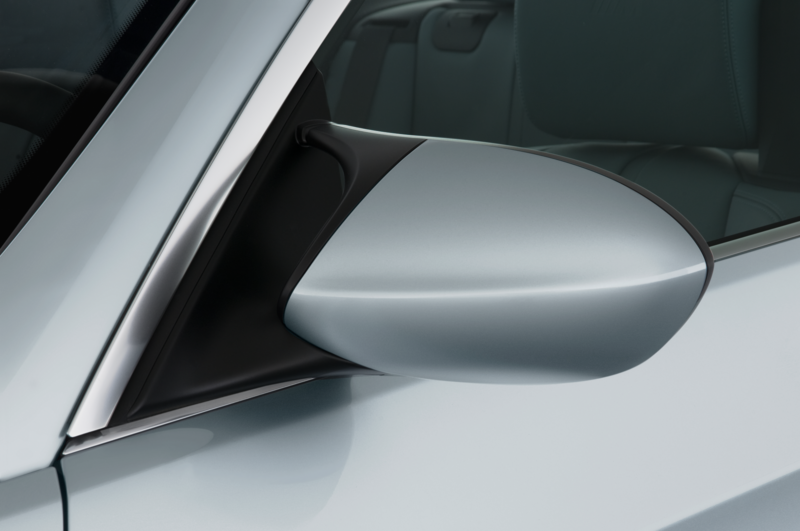 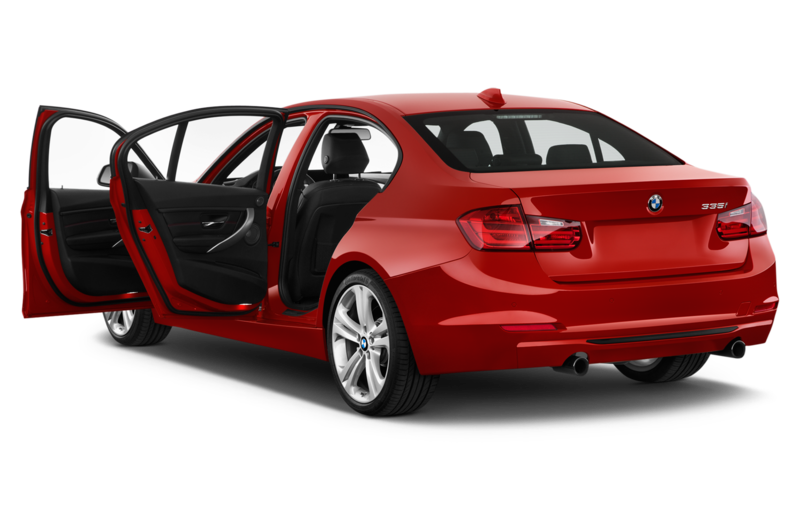 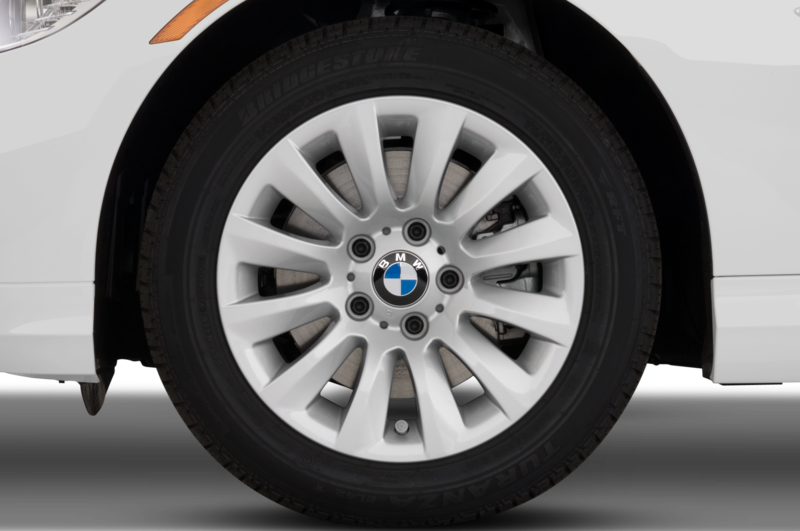 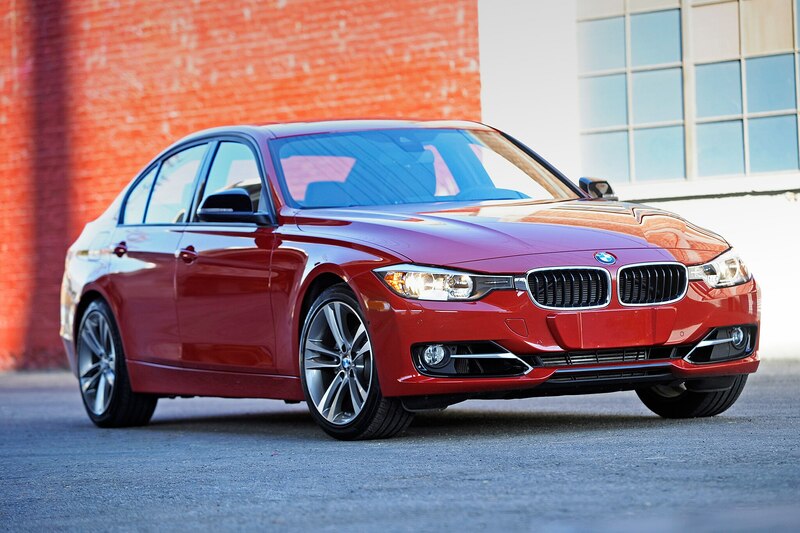 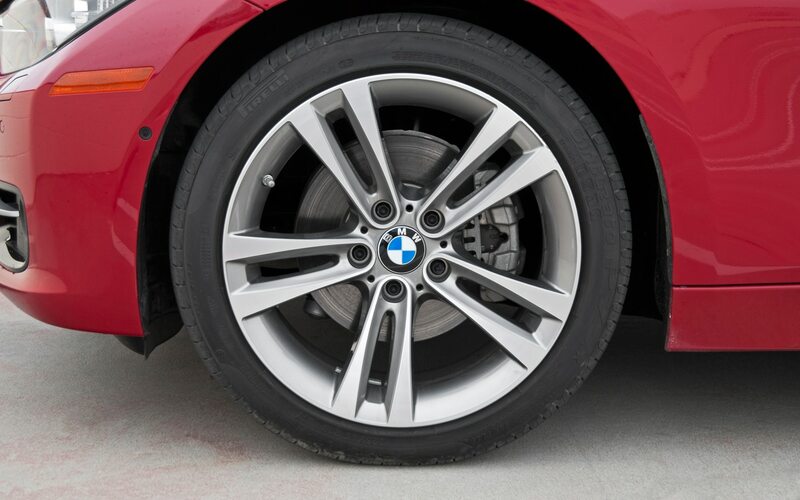 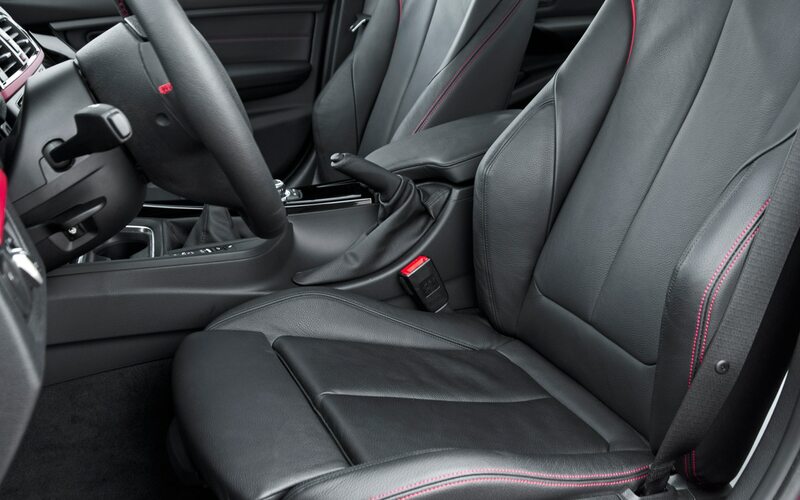 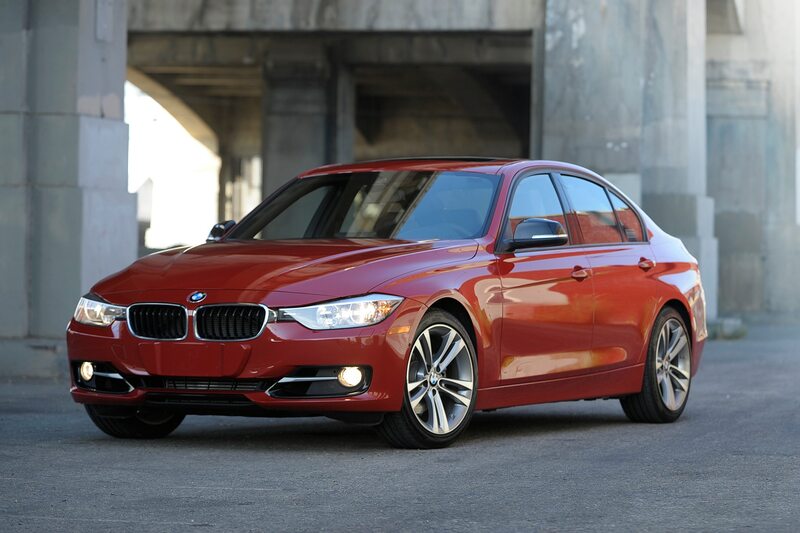 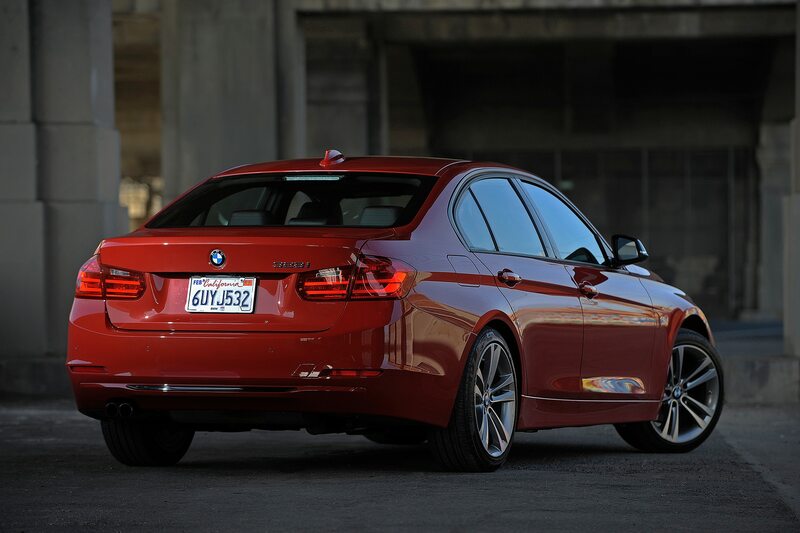 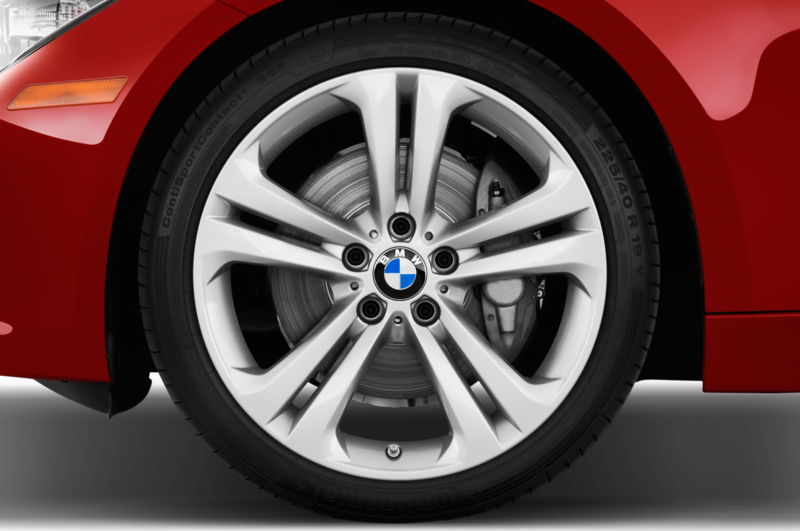 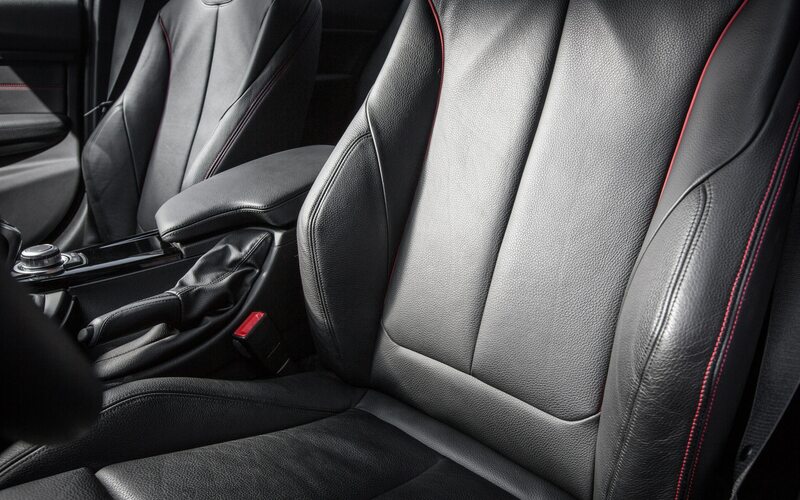 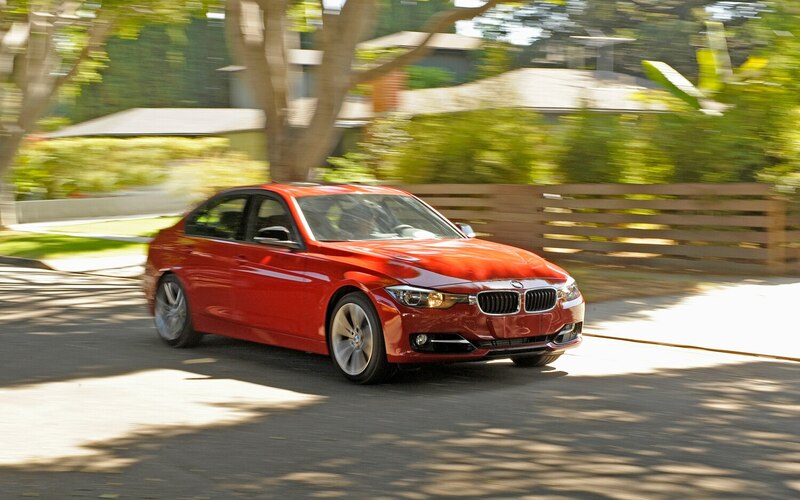 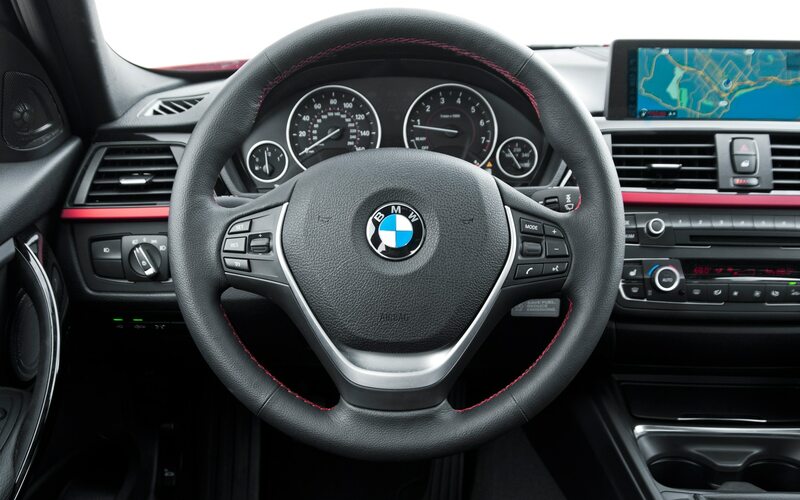 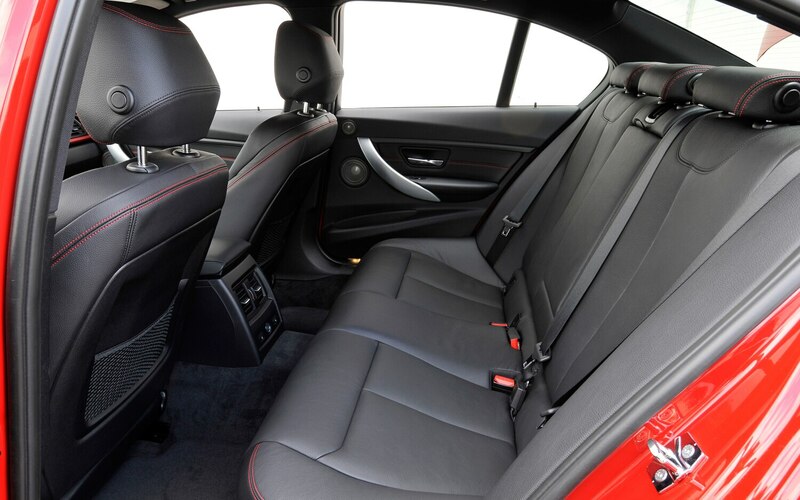 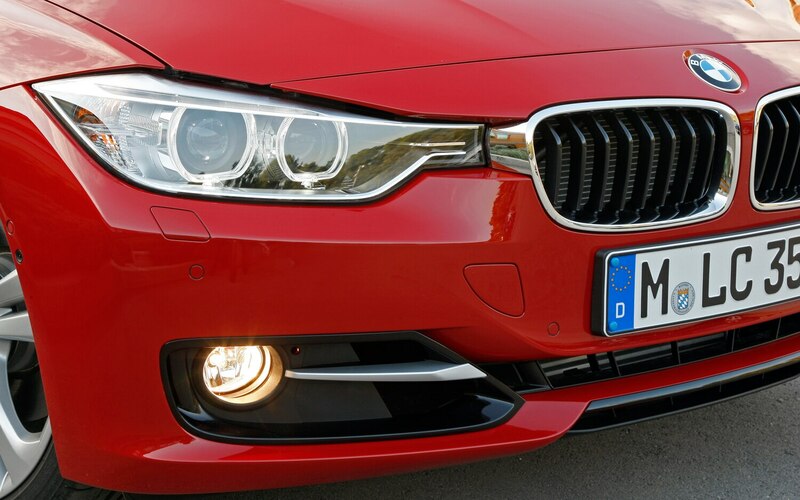 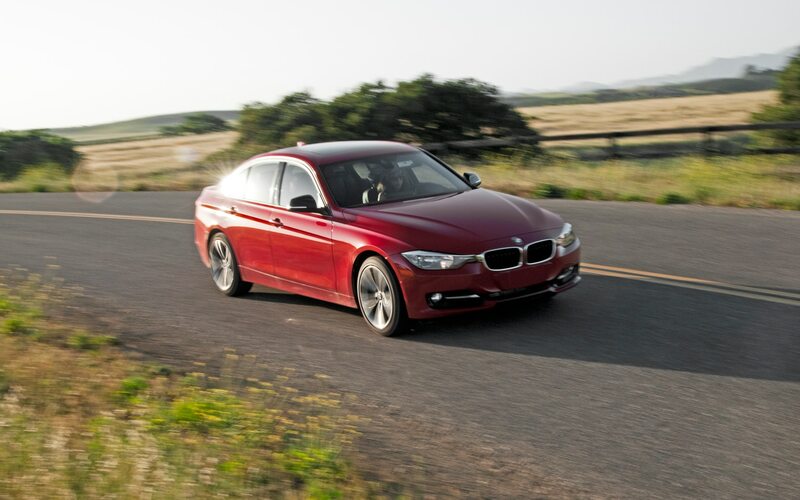 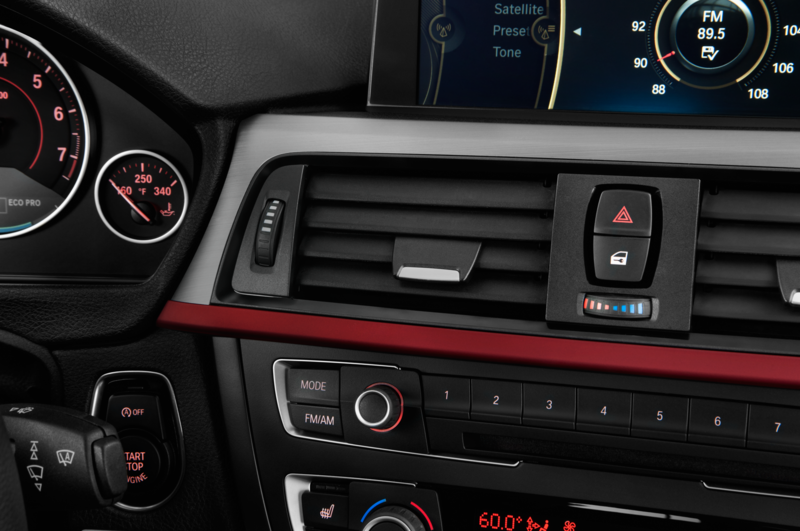 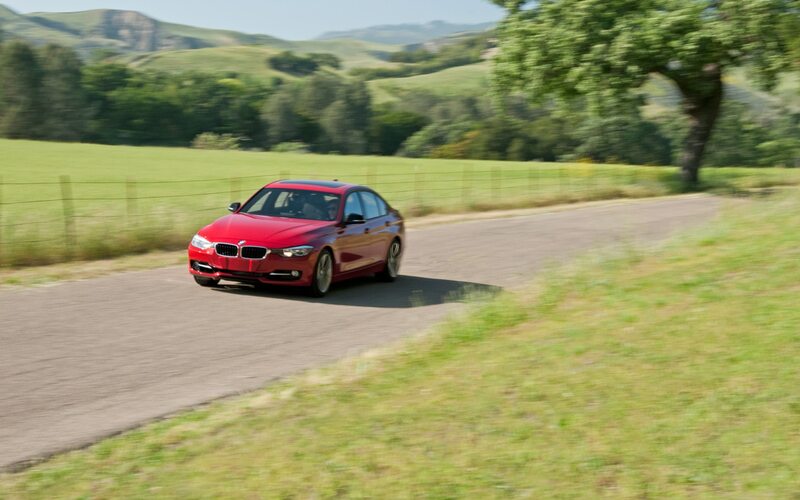 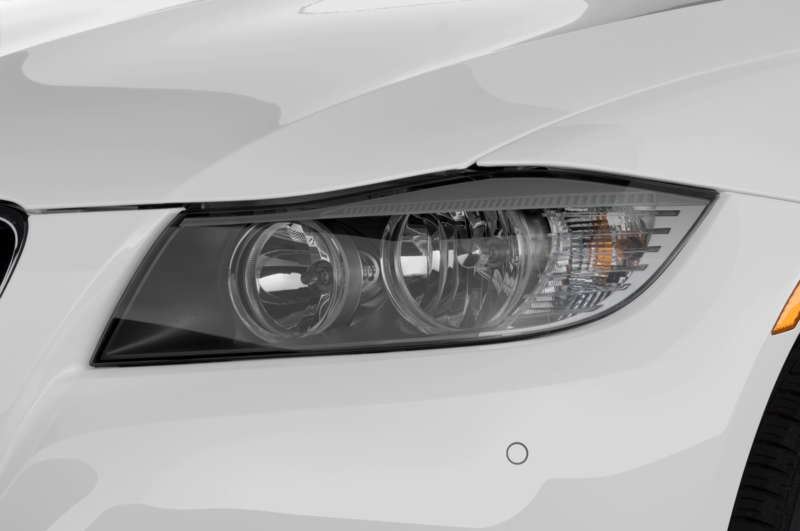 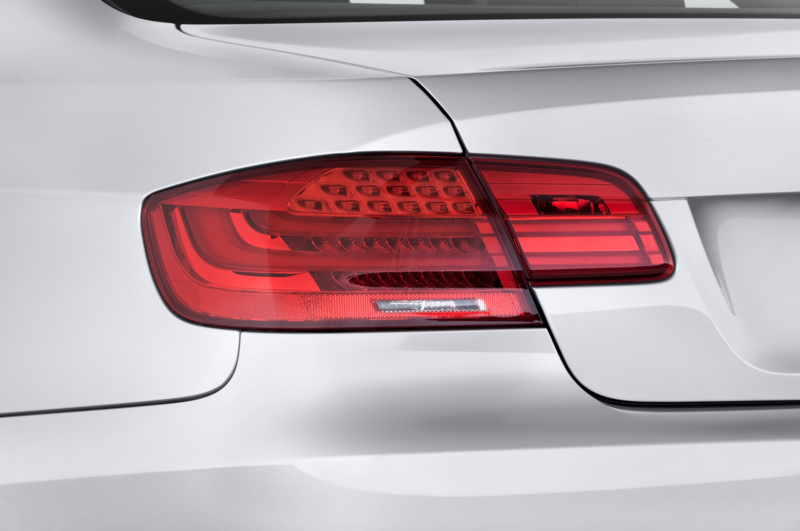 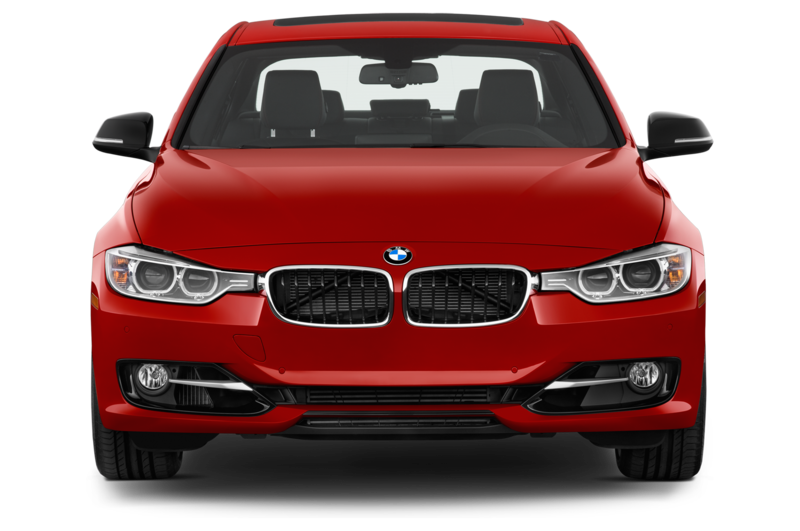 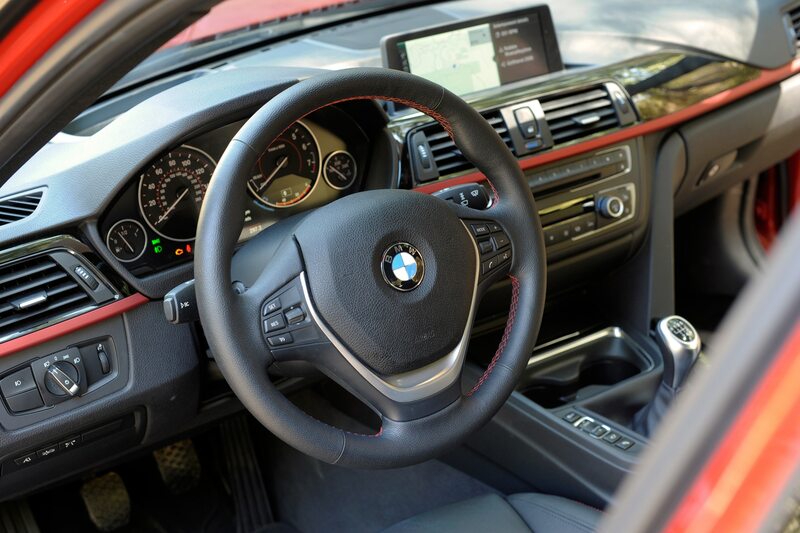 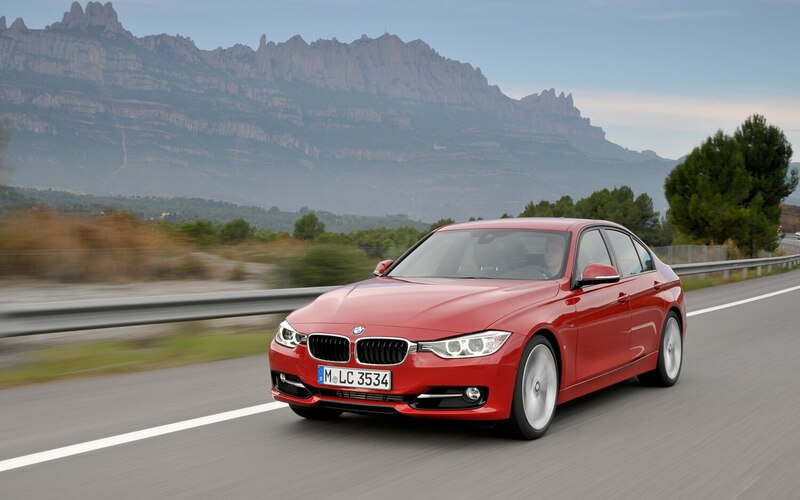 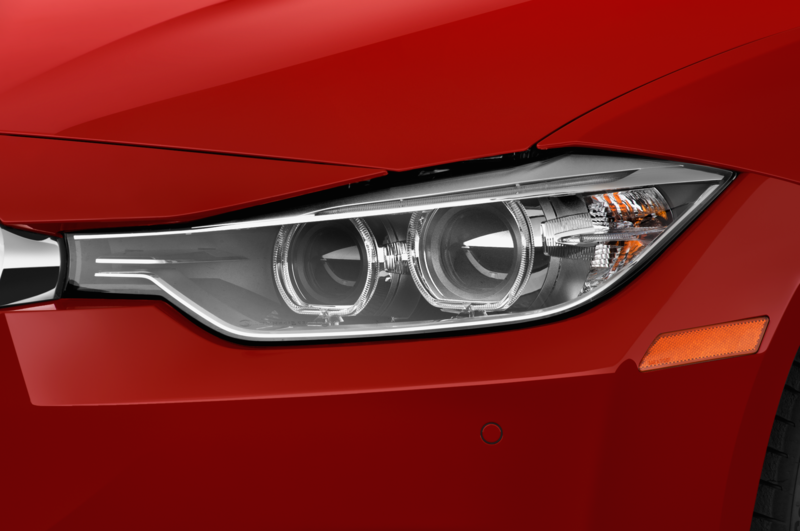 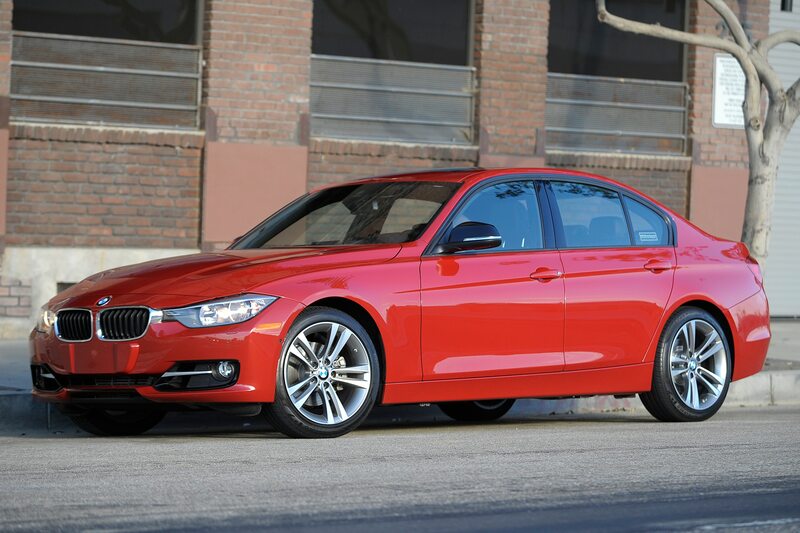 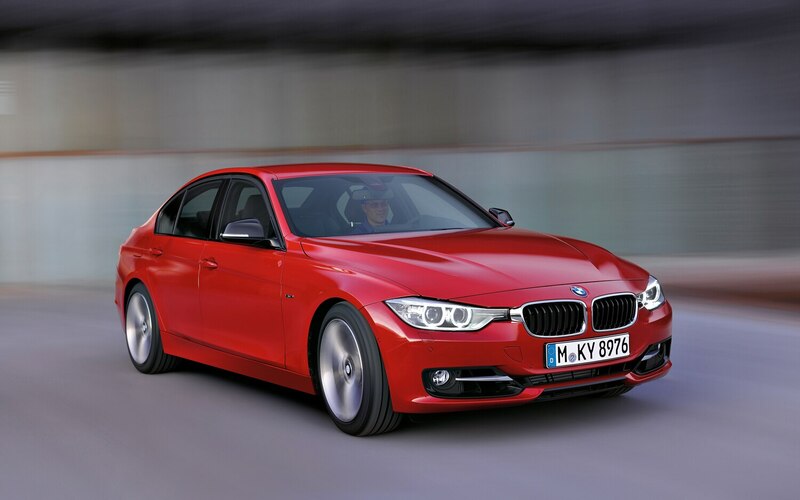 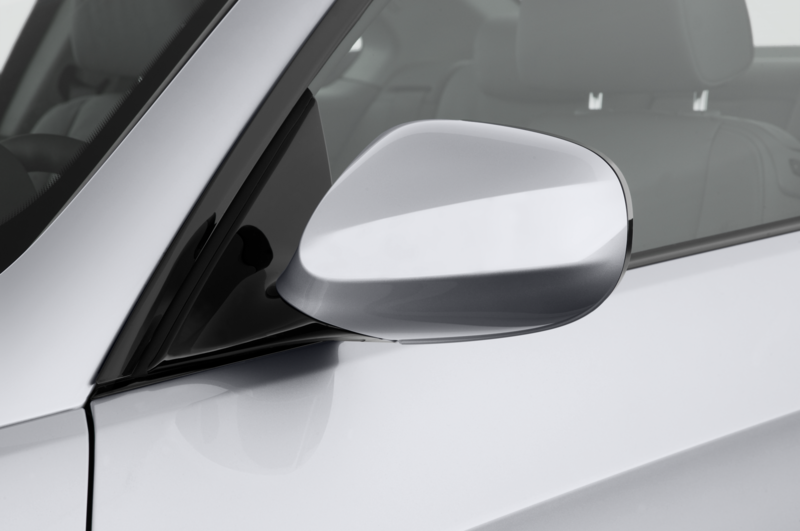 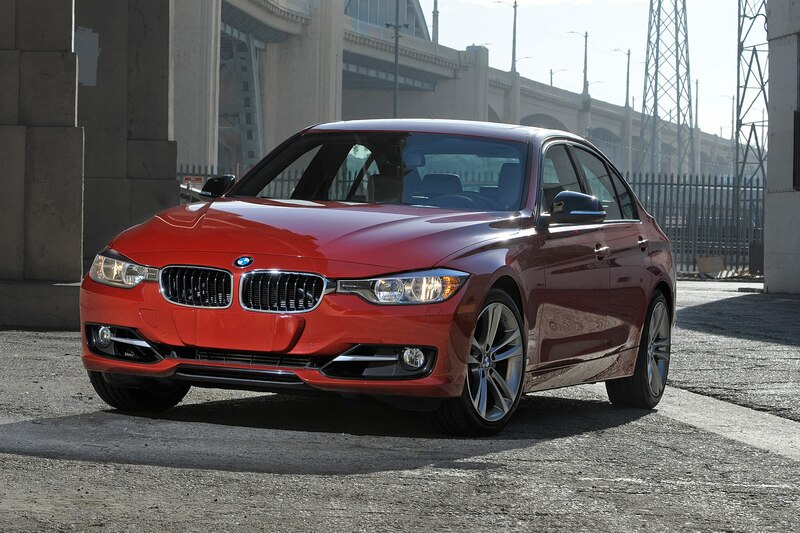 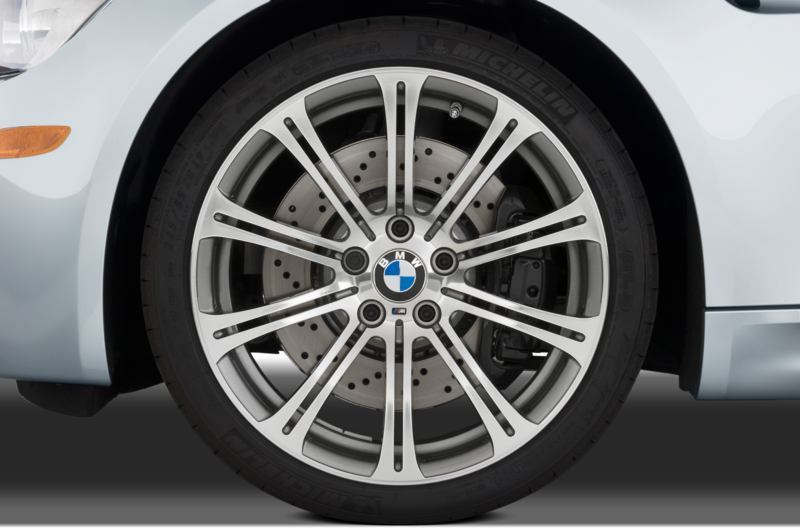 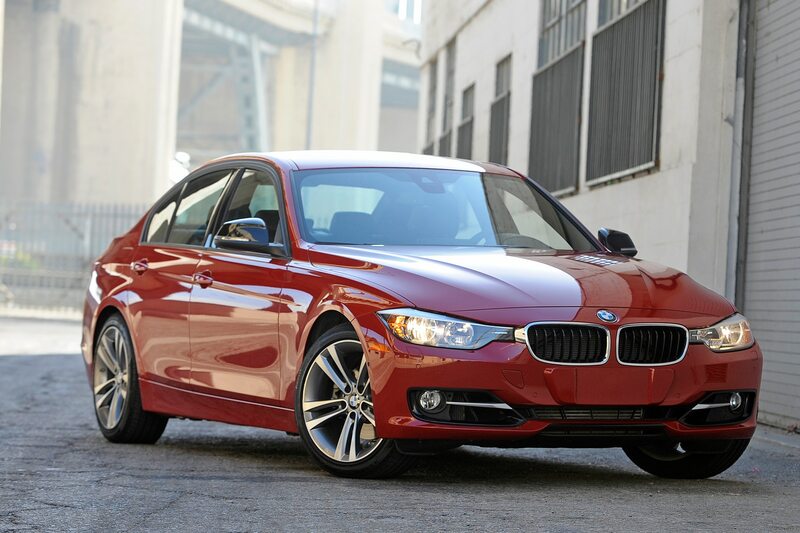 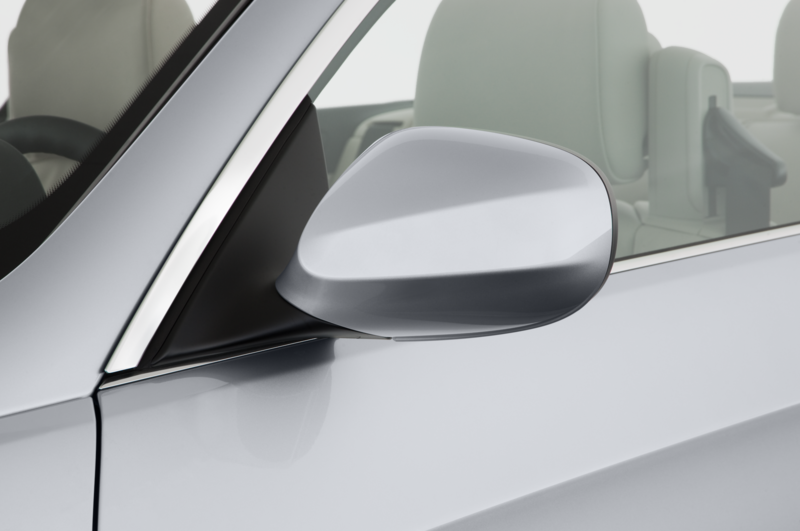 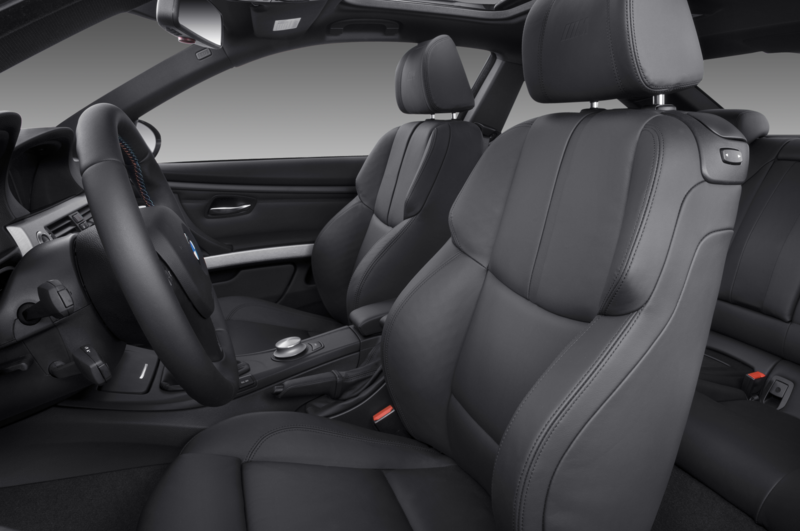 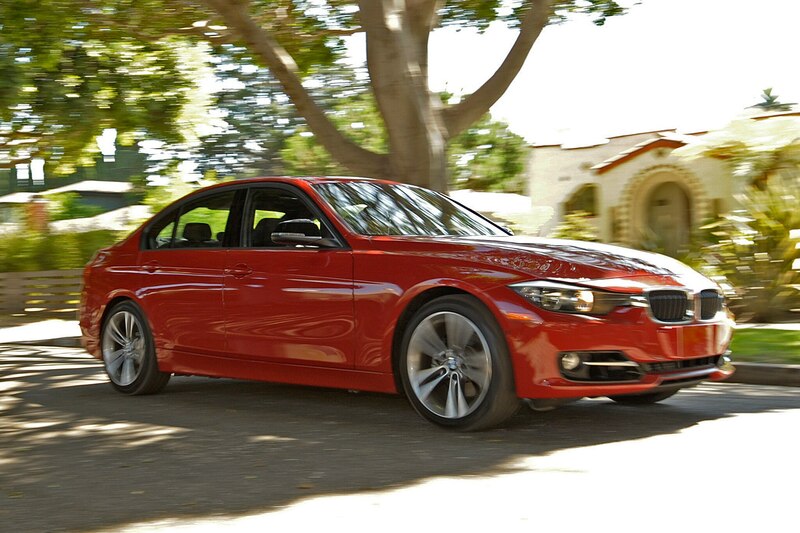 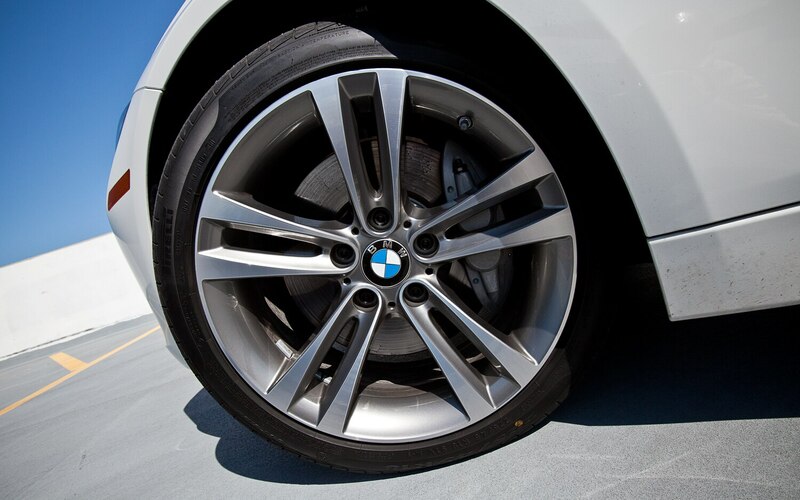 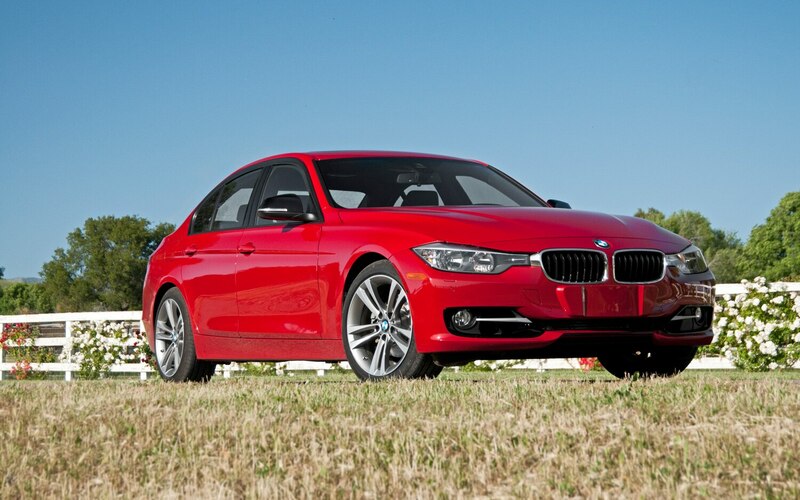 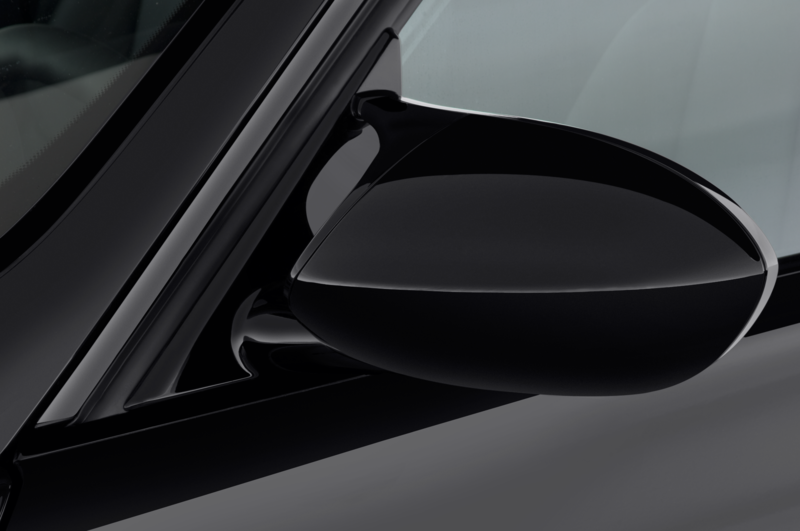 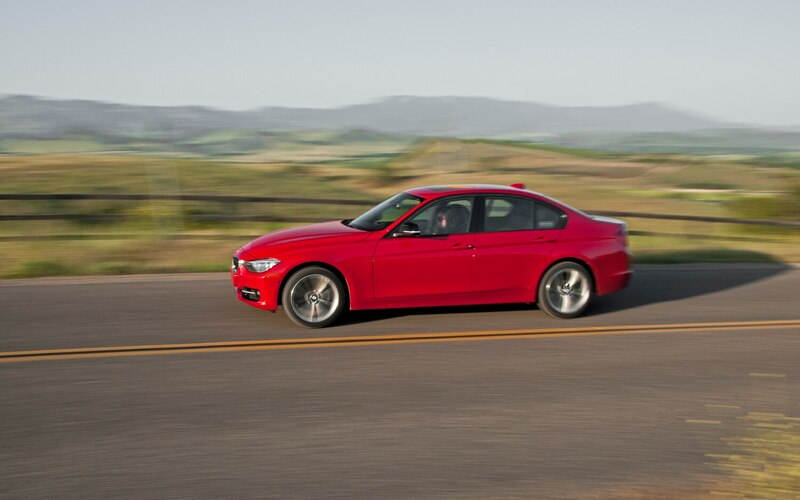 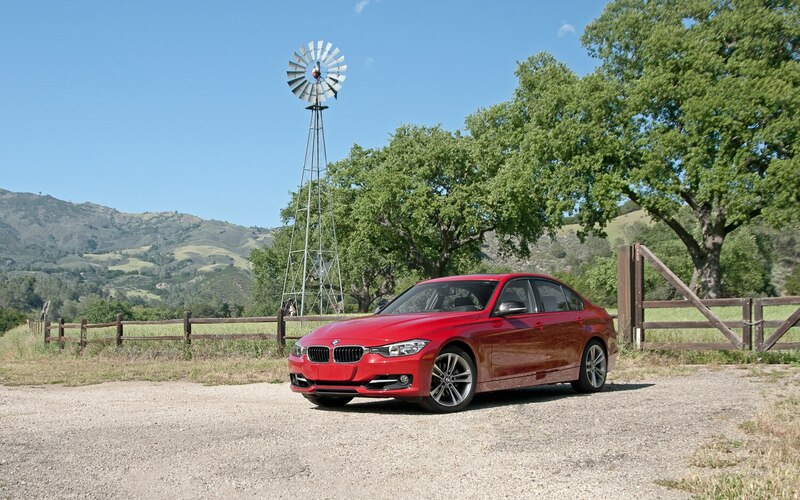 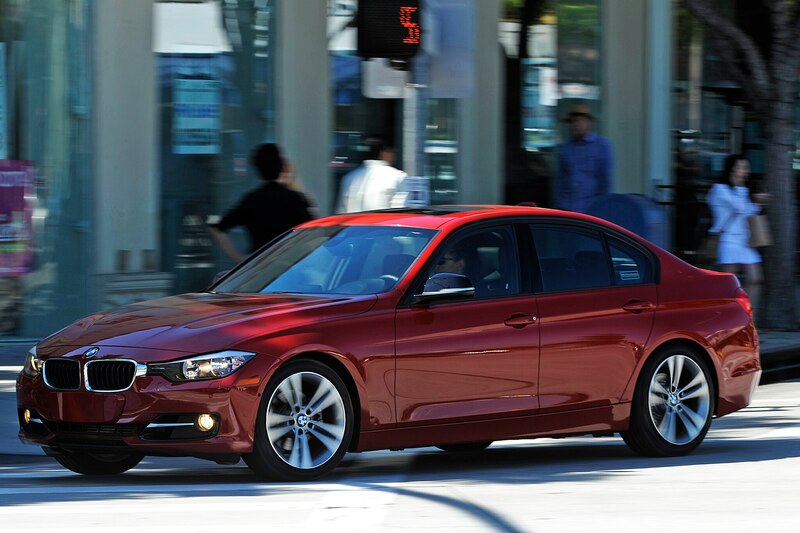 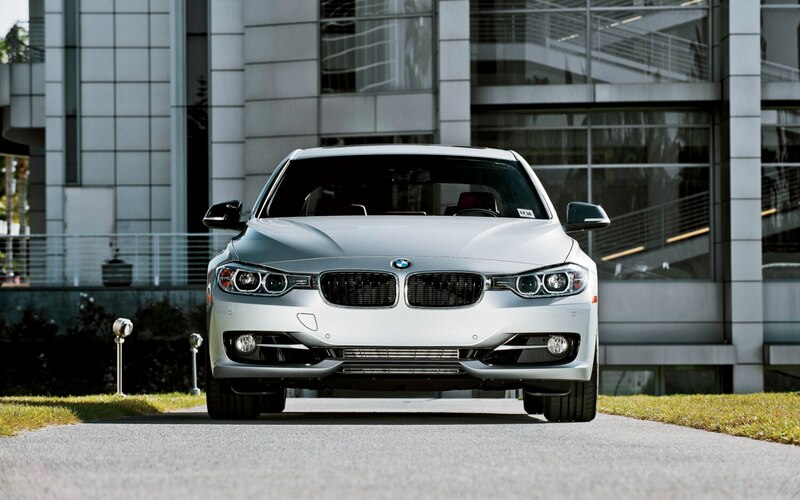 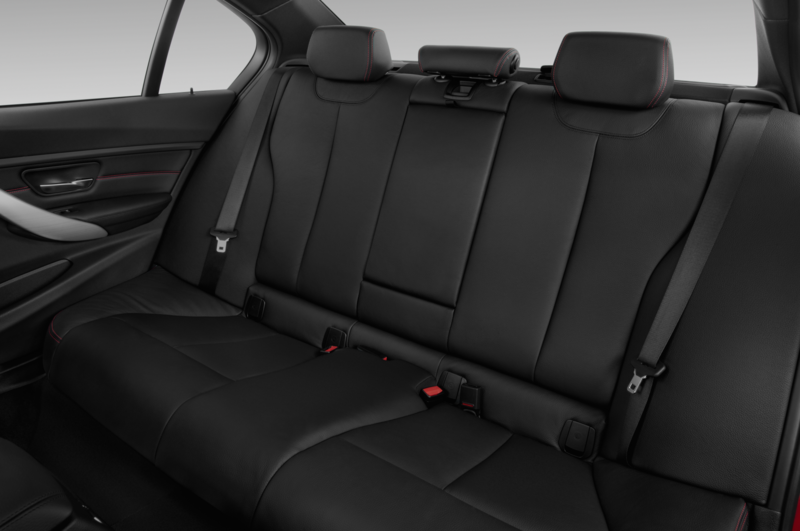 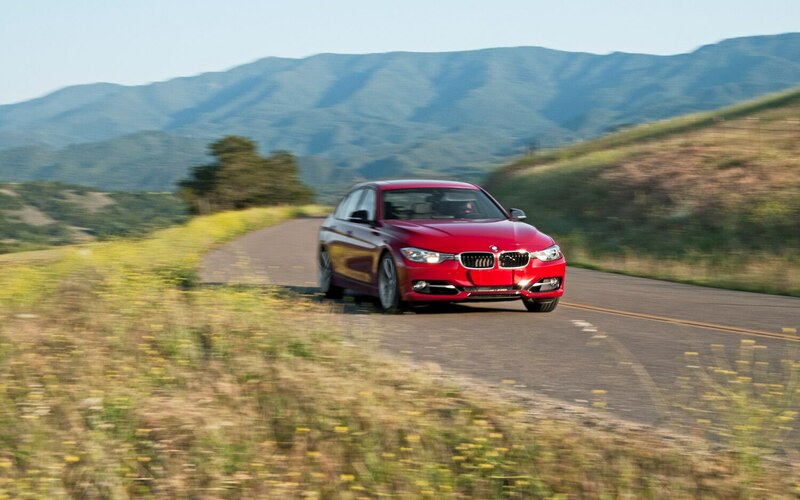 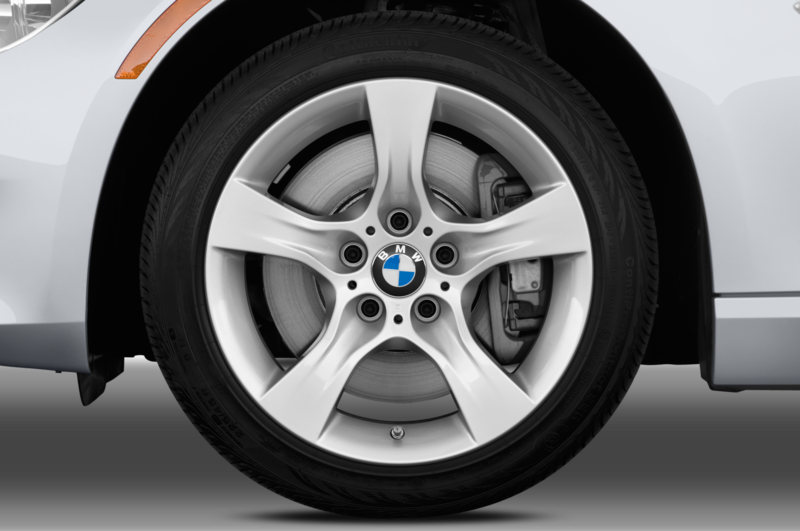 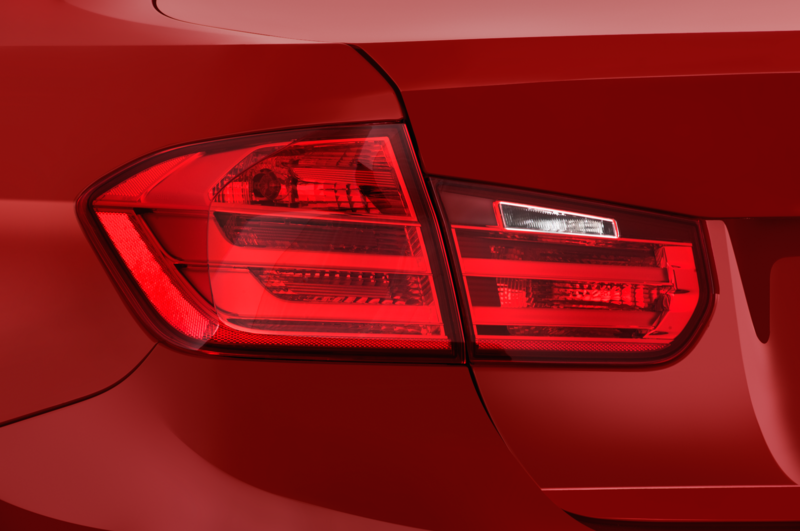 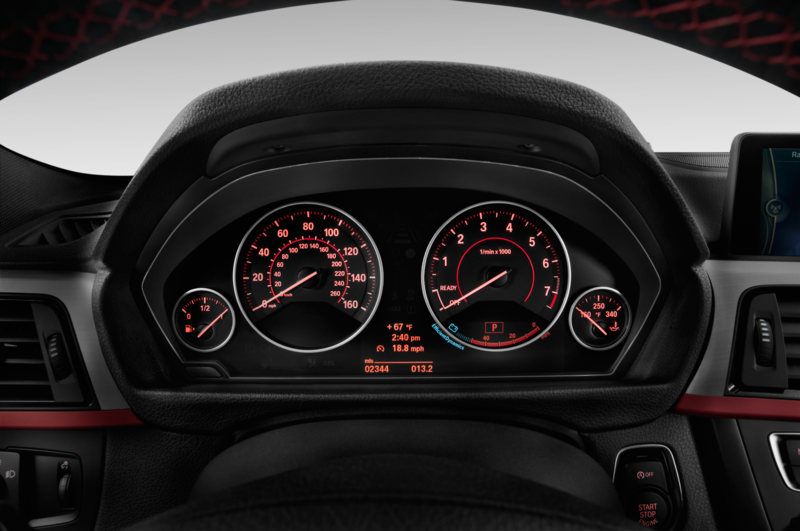 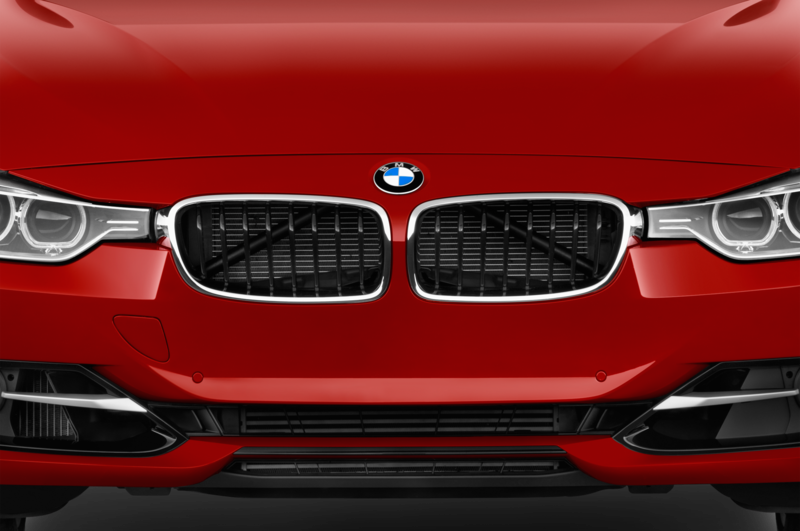 The six’s smooth, distinctive growl is and always will be a huge slice of the 3-series’ all-around perfection. 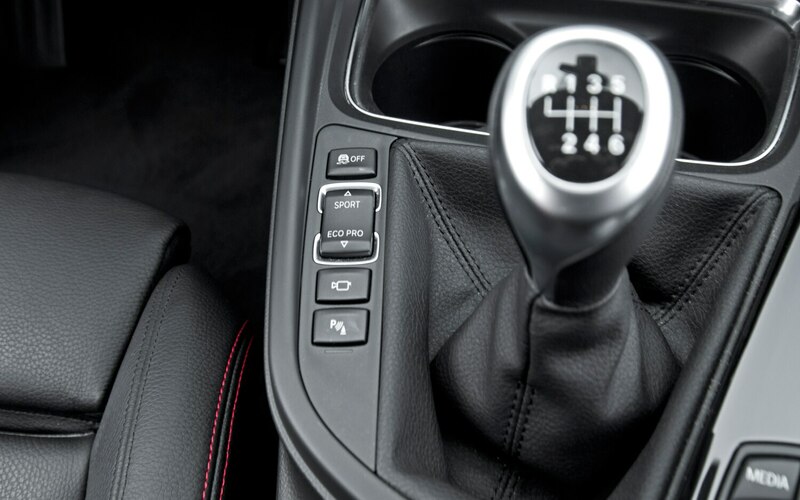 And although the lighter four-cylinder should theoretically offer better handling, the six has the advantage of being much more responsive to small inputs of the gas pedal, which is very important considering how sensitive the 3’s balanced chassis is to the throttle. 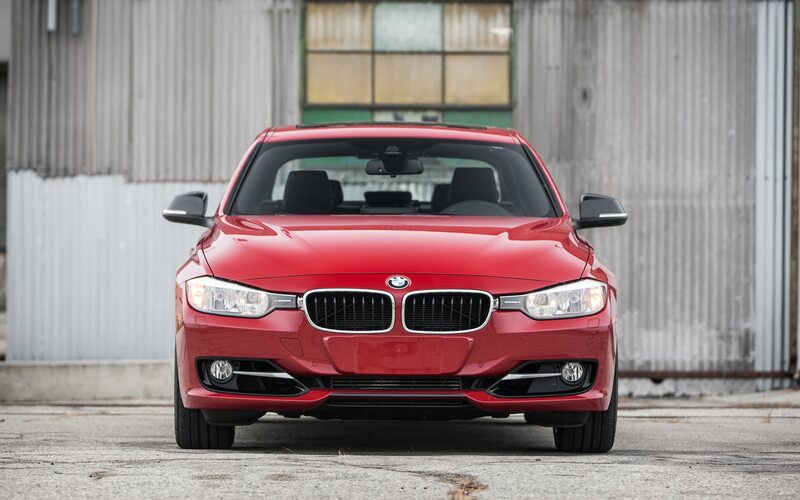 Despite all that, the new four-cylinder is the right choice for most 3-series buyers. 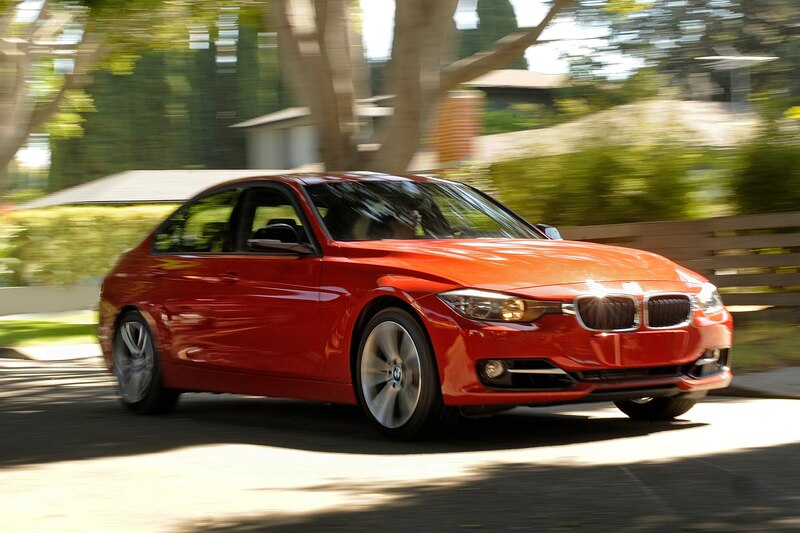 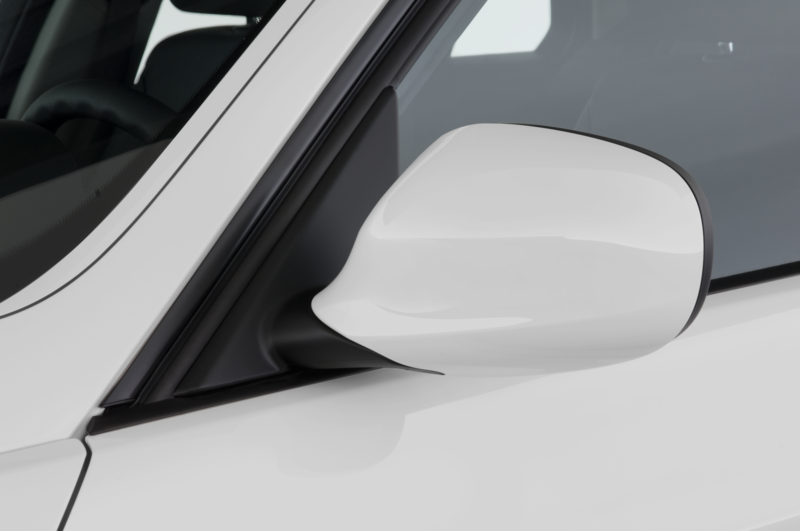 It’s hard to argue with $7000 in savings upfront coupled with a 3-mpg fuel efficiency advantage. 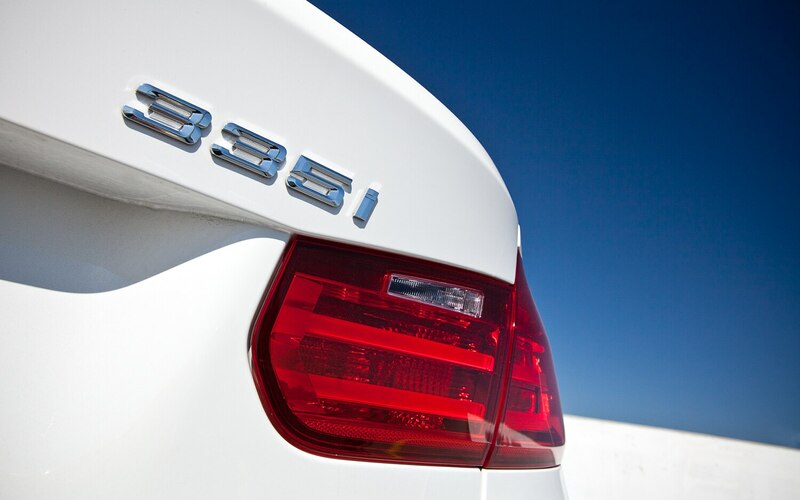 And don’t misunderstand: the 328i is still a wonderful vehicle to drive. 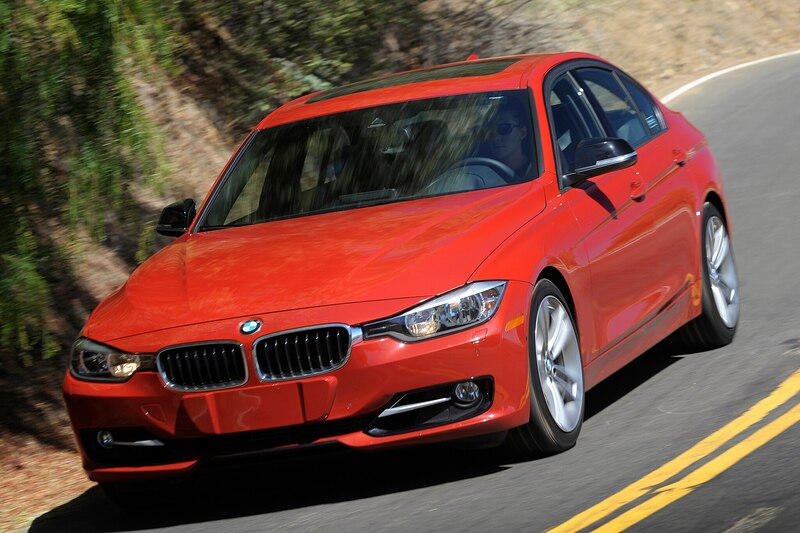 Just don’t test-drive a 335i lest you want its buttery six-cylinder soundtrack to haunt your dreams. 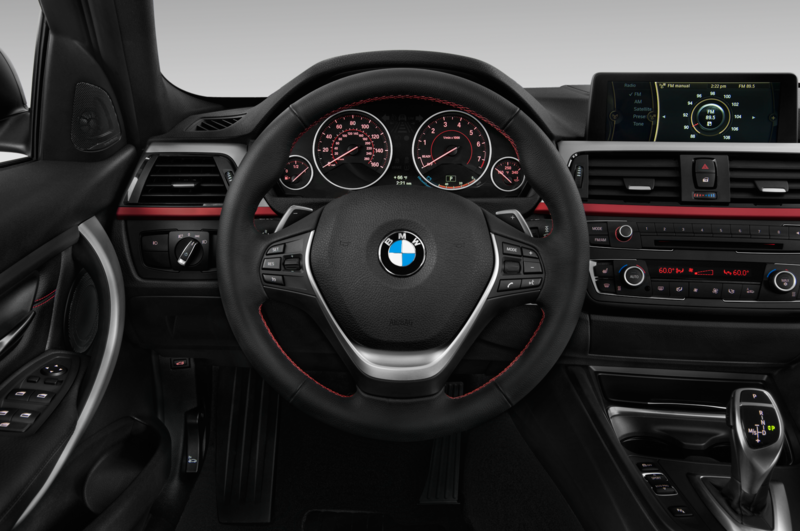 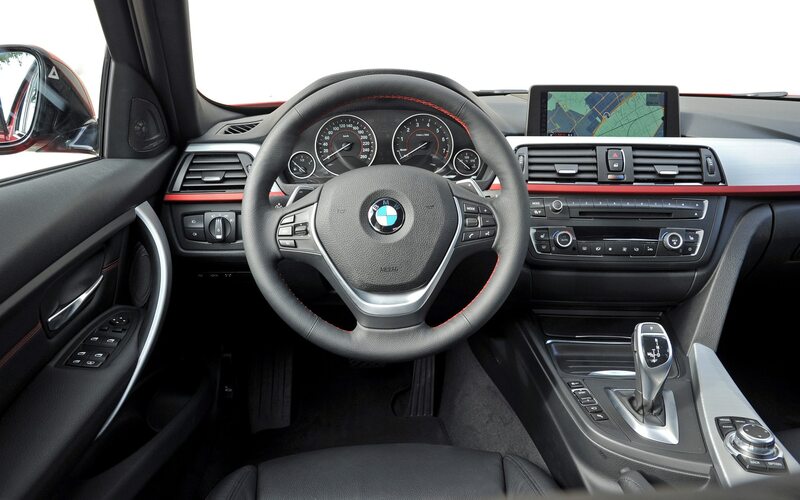 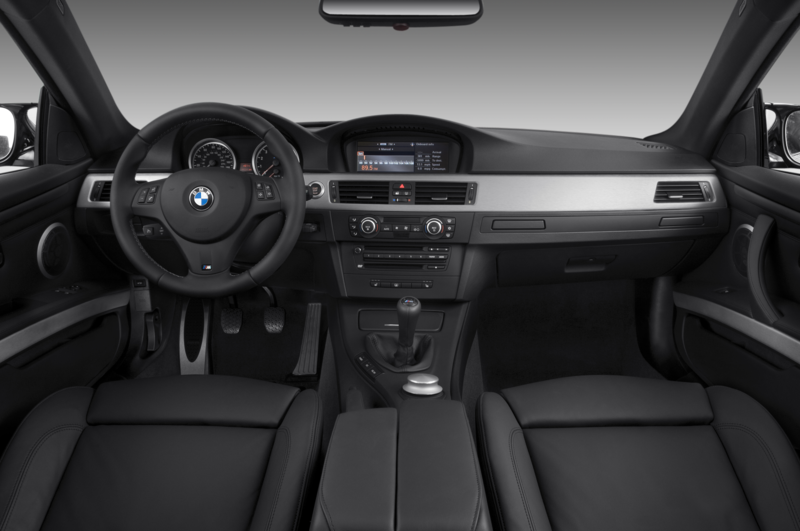 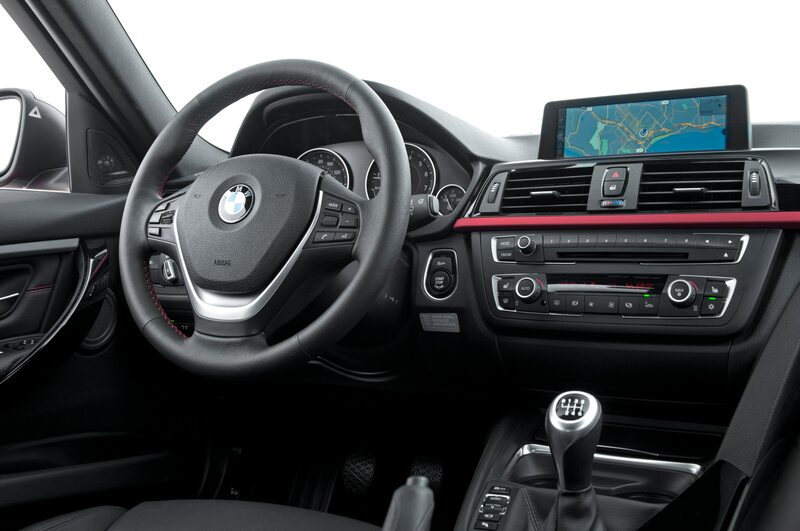 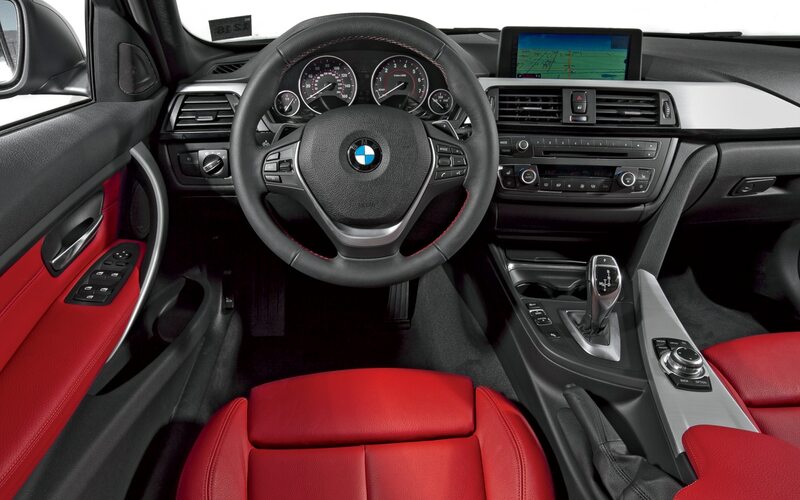 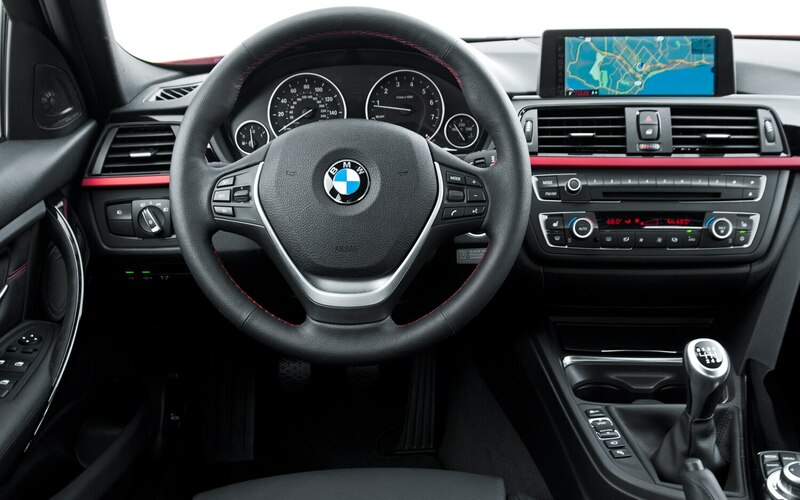 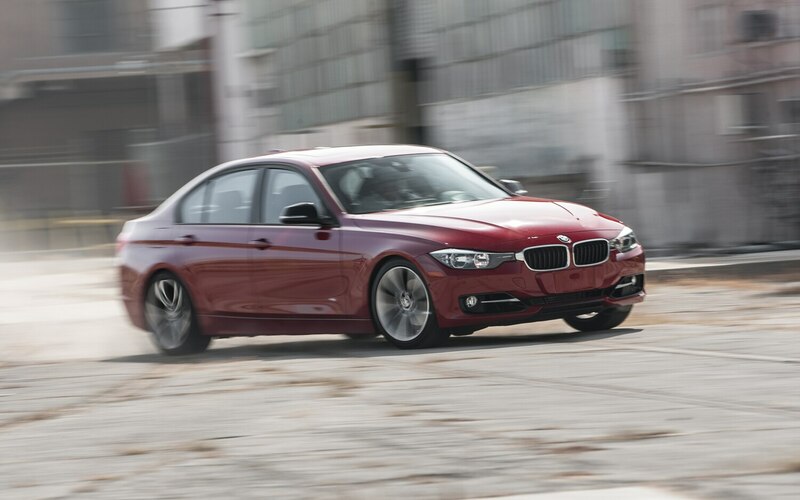 The new 3-series’s manual transmission definitely works better with the six-cylinder than it does with the four: BMW allows more of the 335i engine’s music to come through to the cabin, so it’s an acoustic delight to drive. 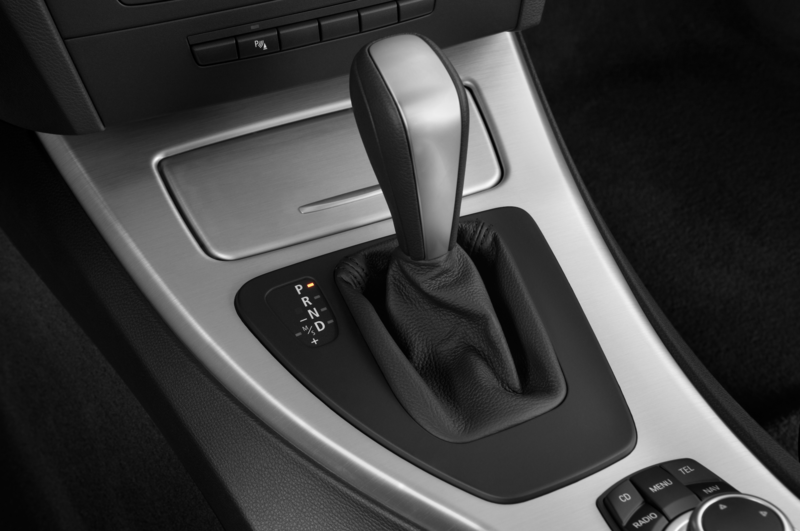 Unfortunately, the start/stop system is still way too rough on restart, and the clutch pedal’s travel is just too long for my tastes — and my left leg. 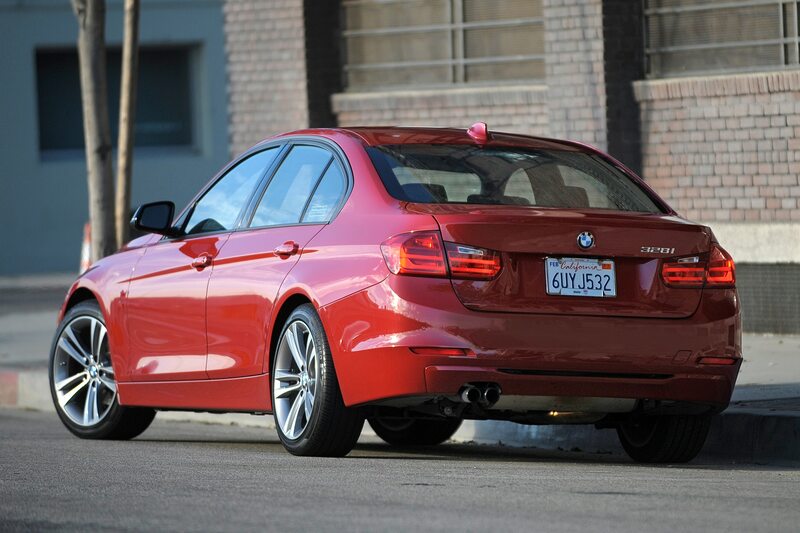 The sport suspension does a shockingly good job of dealing with Ann Arbor’s miserable roads. 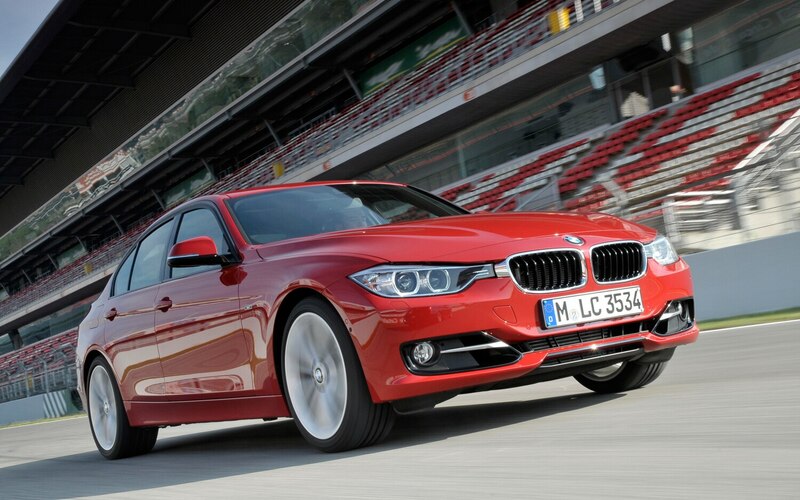 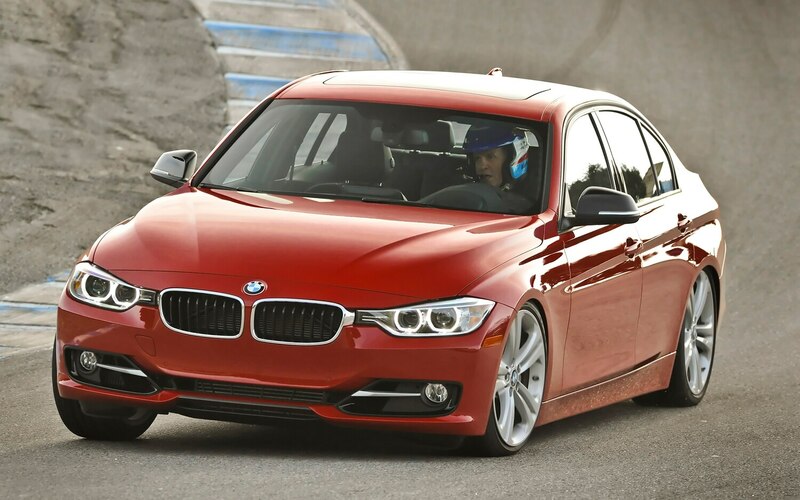 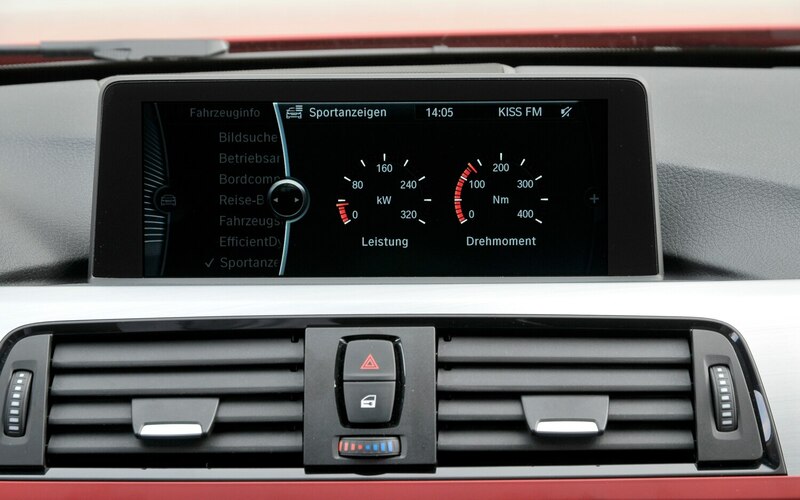 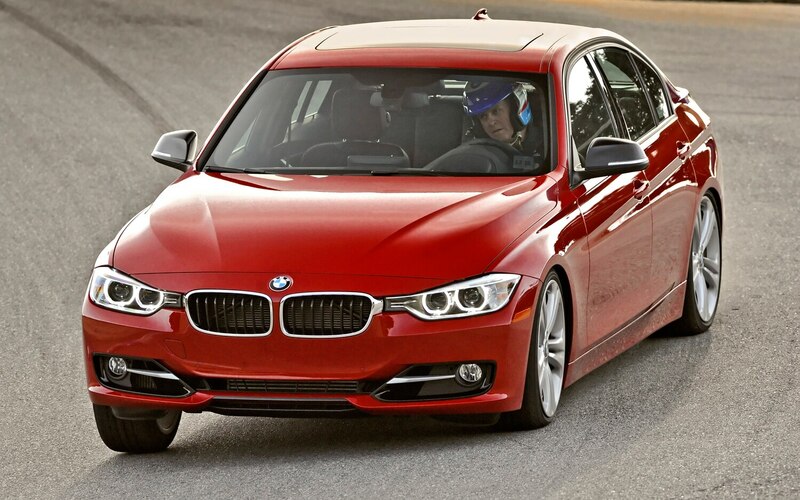 For the first time in decades, you can actually drive a sport-package-equipped 3-series and not lose your dentures. 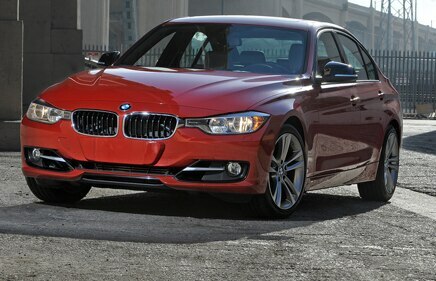 As much as I like this car, I don’t love it. 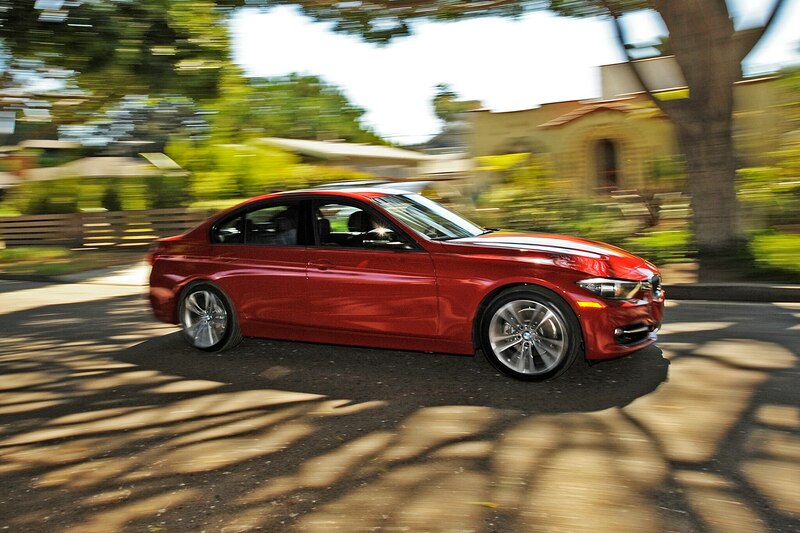 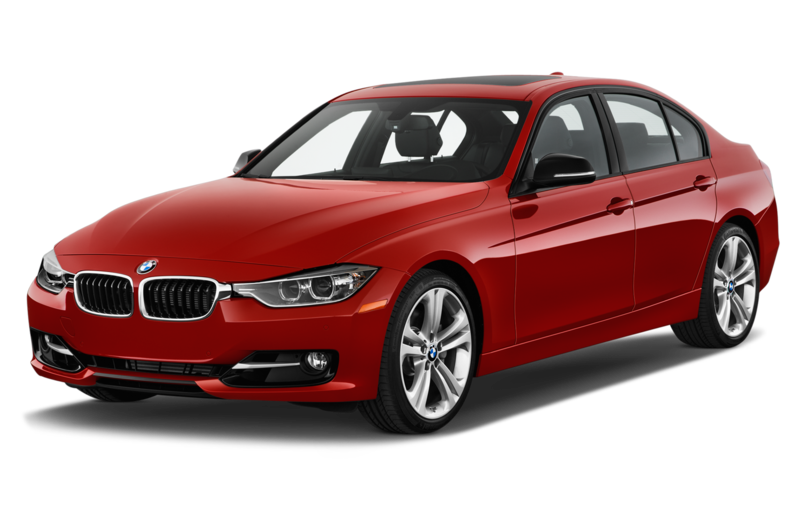 The 3-series has become a little too grown-up for me — a little too much like what a 5-series should be. 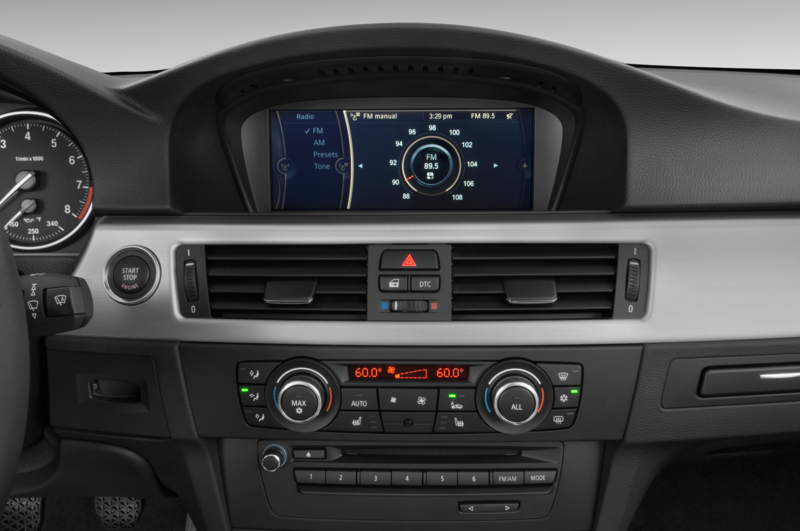 And the final nail in the coffin is the electronics. 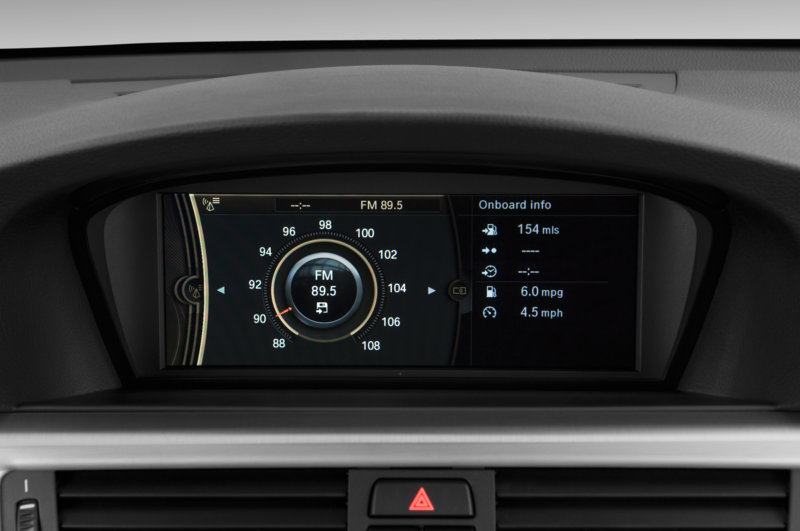 iDrive is finally genuinely brilliant to use, but I’m sick to death of having to hit the stupid START button twice to turn this car off. 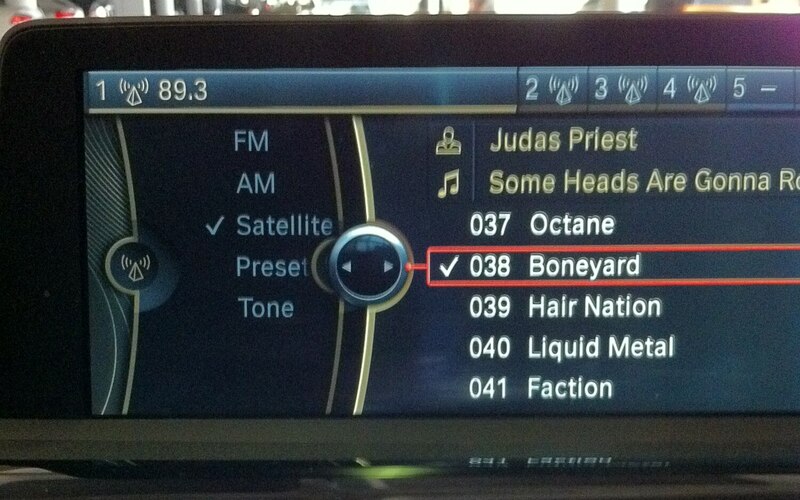 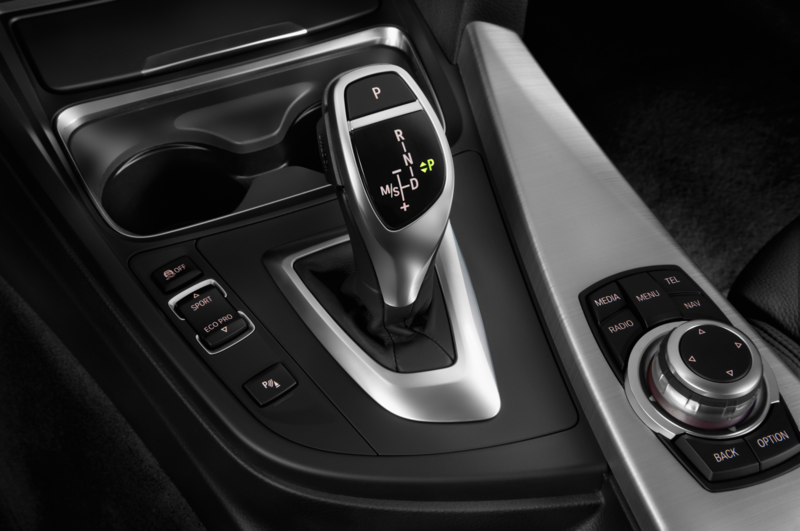 And I’m sick of having to put it in Sport mode every time just to get SOME steering feel. 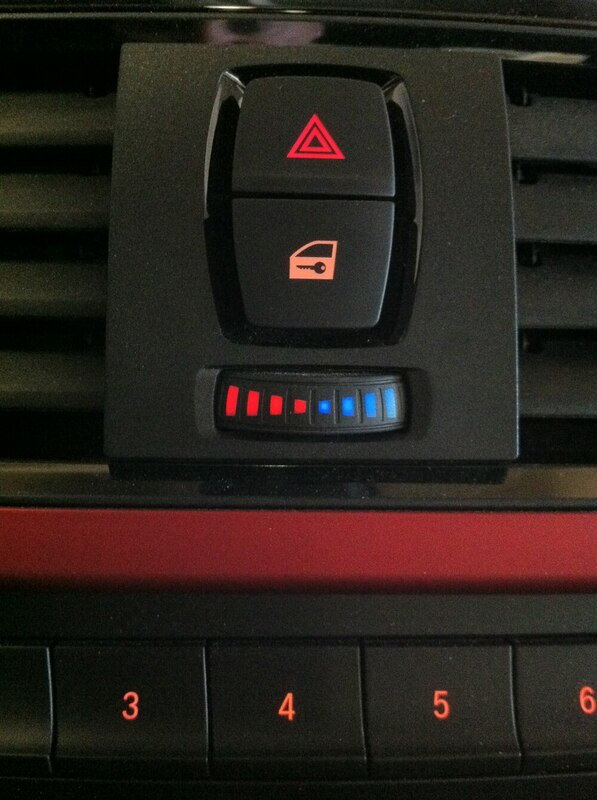 And then I have to deal with throttle response that’s too jumpy. 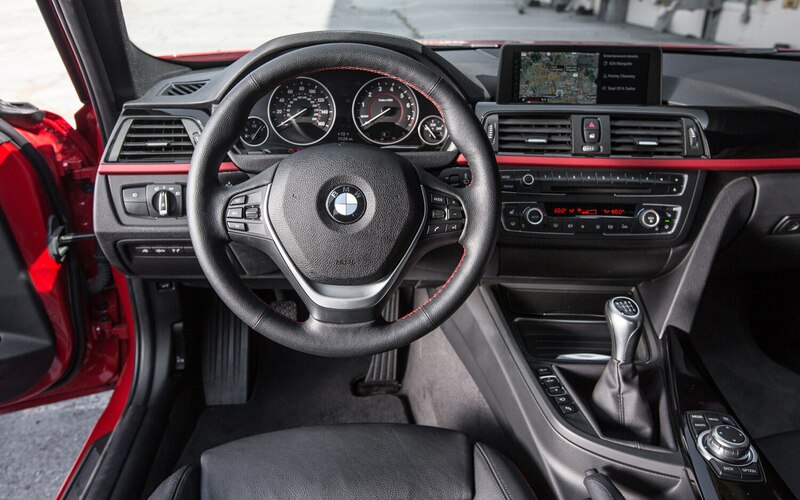 For the first time, a 3-series’ annoying electronics outweigh its driving experience, and I’m afraid the 3-series has officially fallen off my personal shopping list. 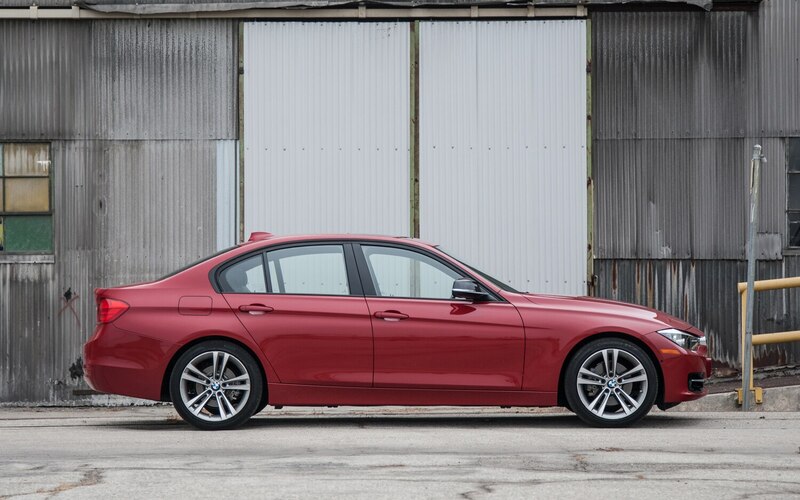 Sure, it’s probably a better 3-series for the masses (and it’s finally gorgeous again, inside and out), but the 3 is no longer entire car-lengths ahead of the crowd. 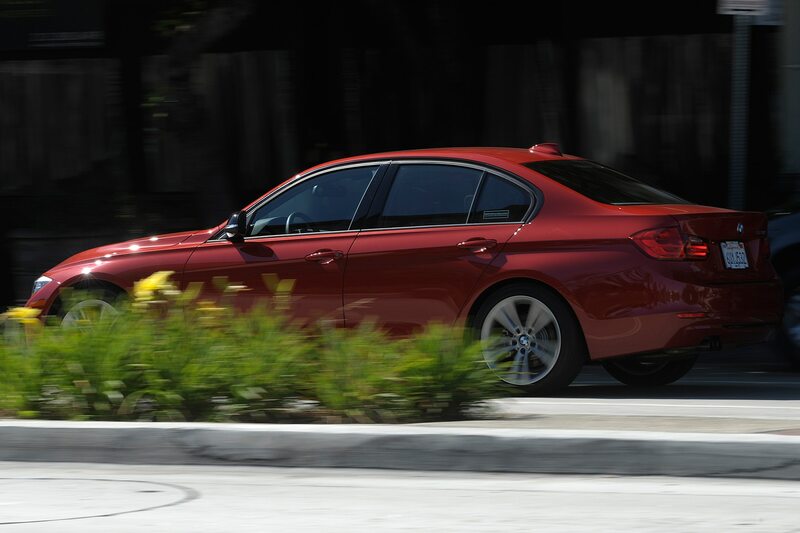 This was my first exposure to the new 3-series, and the 335i is pretty sweet: so smooth, so solid, so silkily sporty. 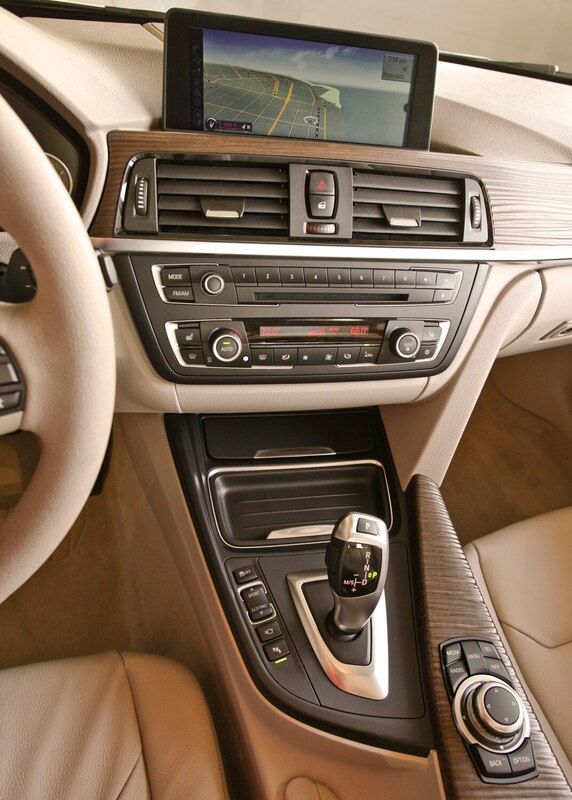 Aside from a clunky-sounding rattle somewhere at the left-front of the car and the fact that I could get almost no FM radio reception, I found many things to love about the newest Bimmer, such as the new iDrive controller, the asymmetrical shift handle, the spacious rear seats, and the stylish design inside and out. 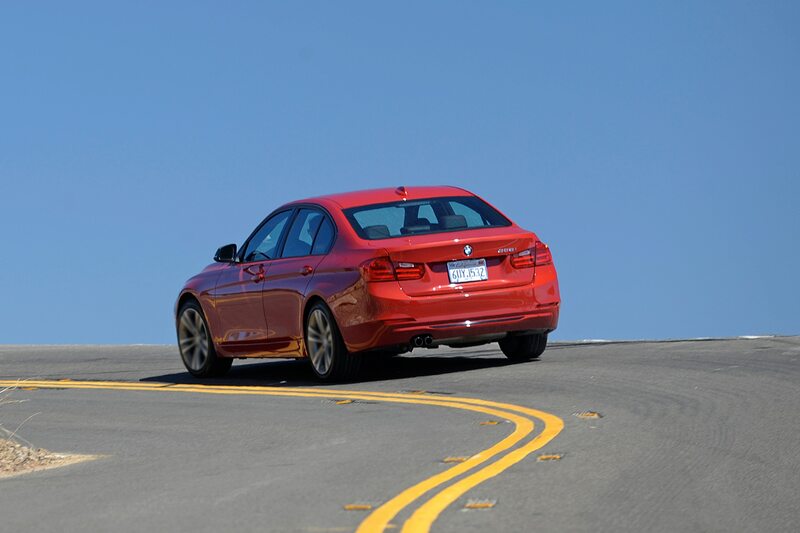 I was sort-of expecting that my night in the BMW 335i would be the same as my recent evening in the Audi S4, as both are six-cylinder, forced-induction sport sedans that are built by iconic, Teutonic brands. 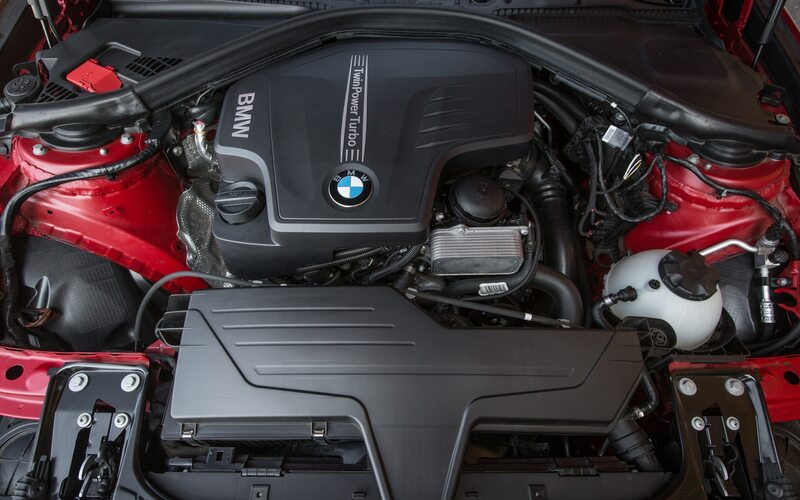 In some ways, my preconceived notion that the Audi and BMW are similar was right — they both have lovely engines with prodigious grunt — but my experiences were certainly different. 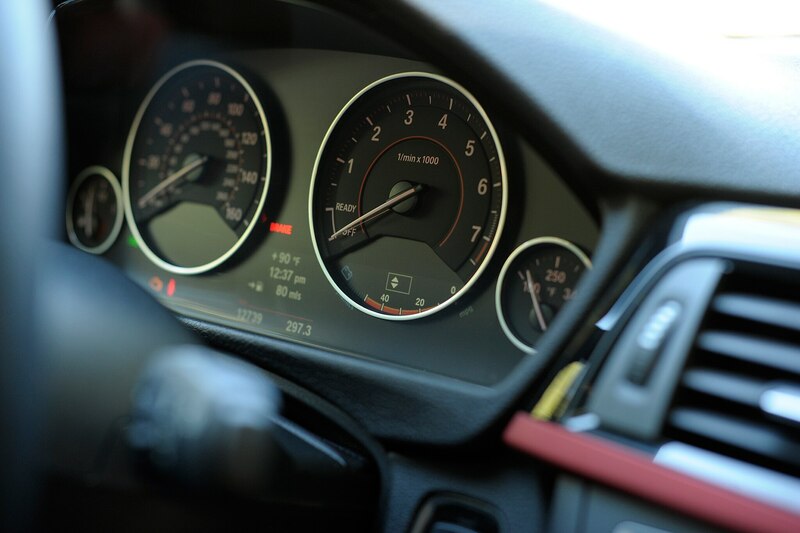 The S4’s supercharged six is distant and hushed unless you stand on the loud pedal, and the steering and shifter left me feeling a little detached from the car. 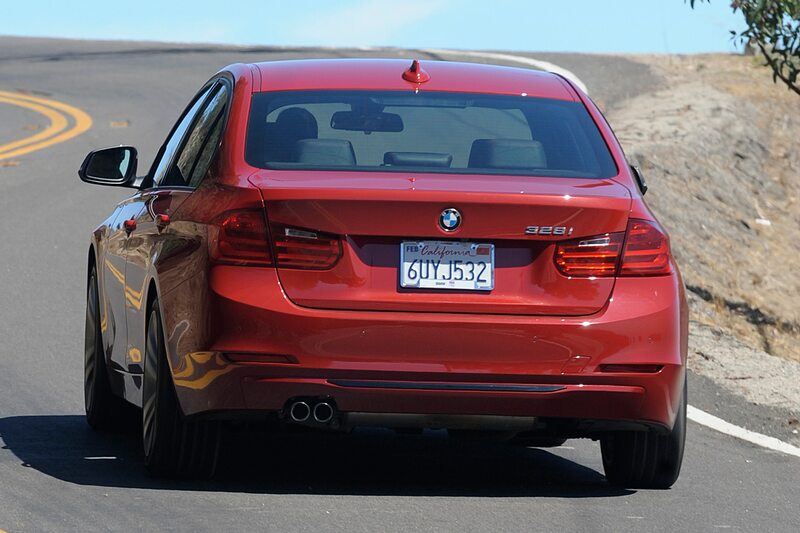 I felt that the S4 would be much better with a DSG rather than a manual gearbox, because this car is more about efficient power than it is goofy fun. 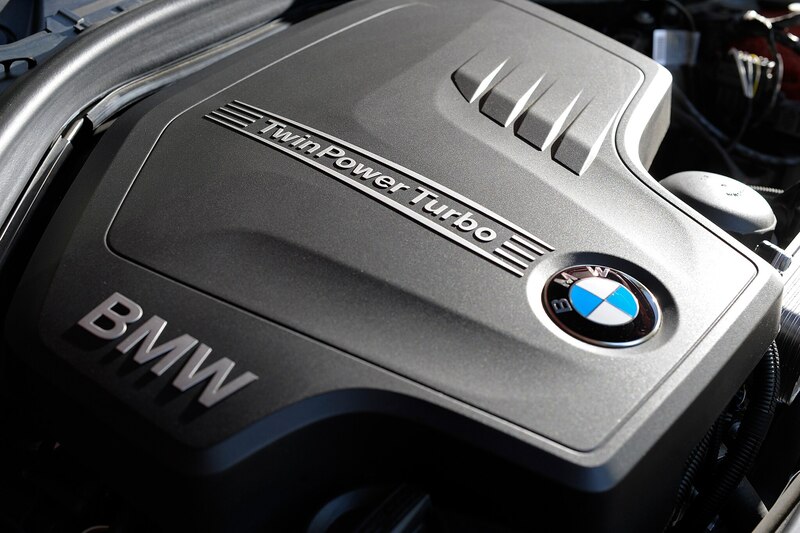 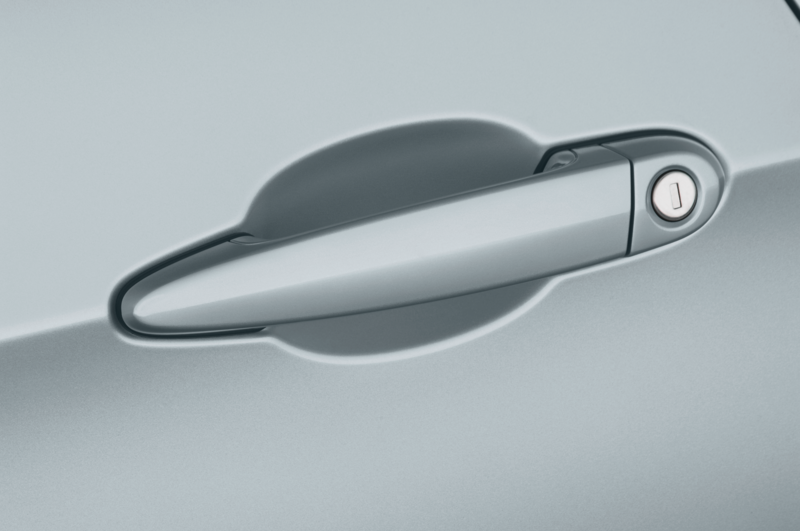 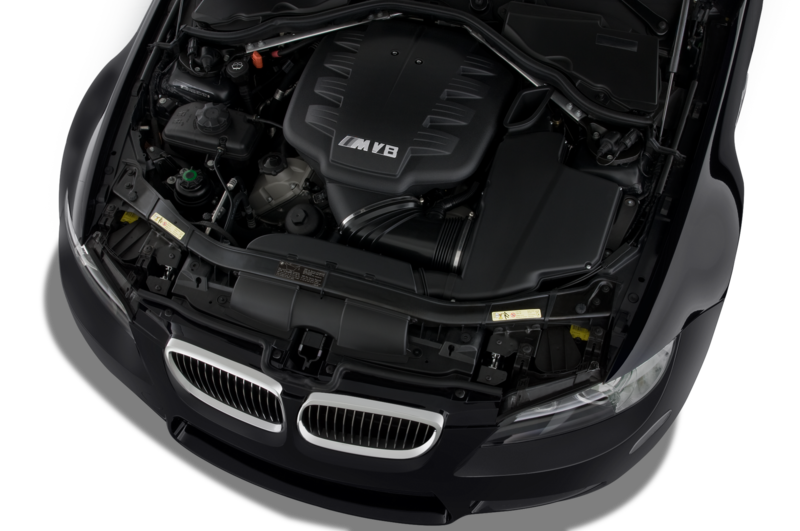 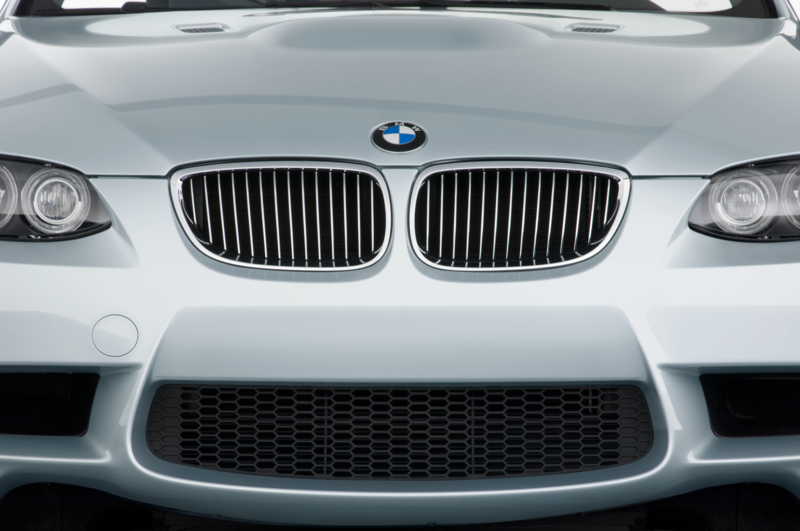 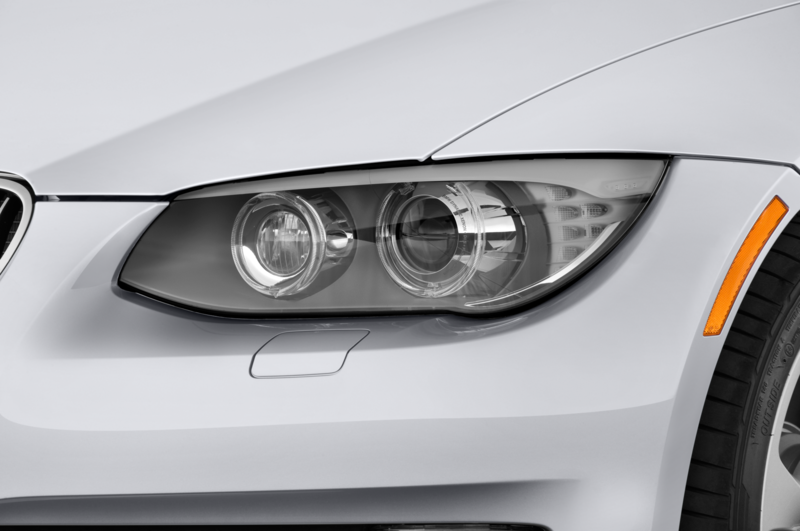 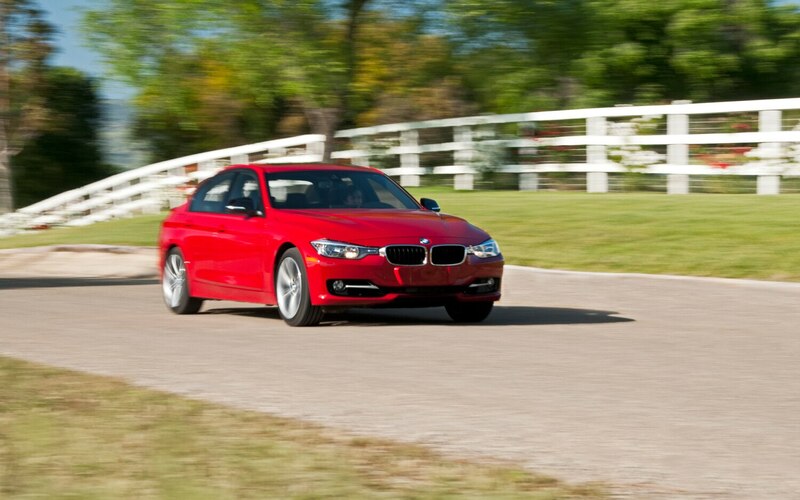 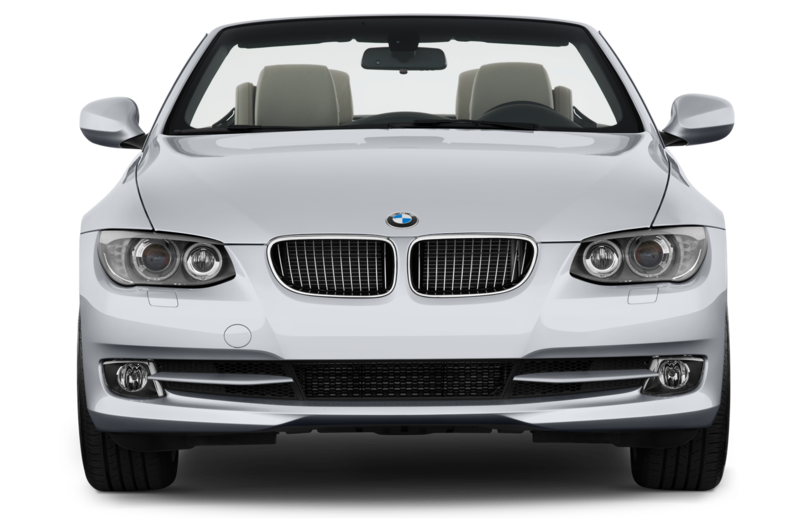 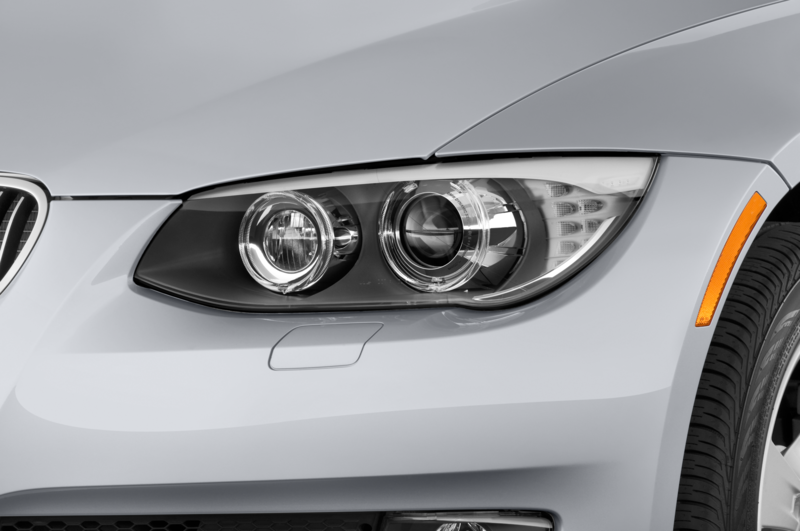 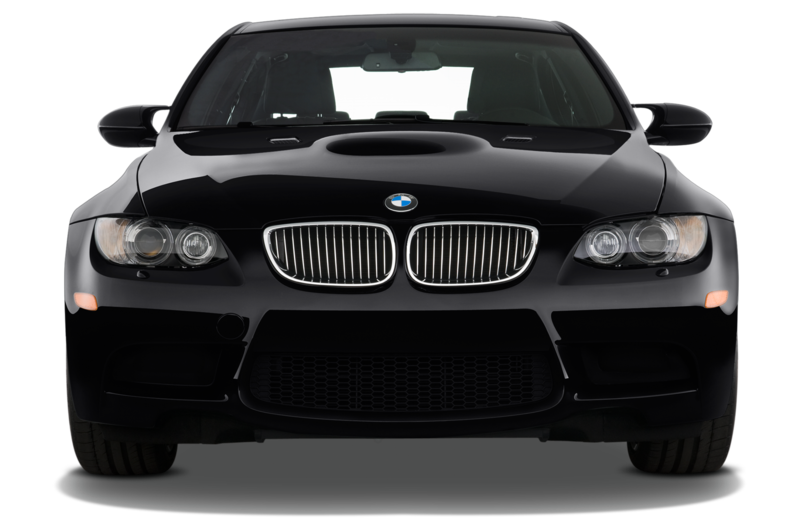 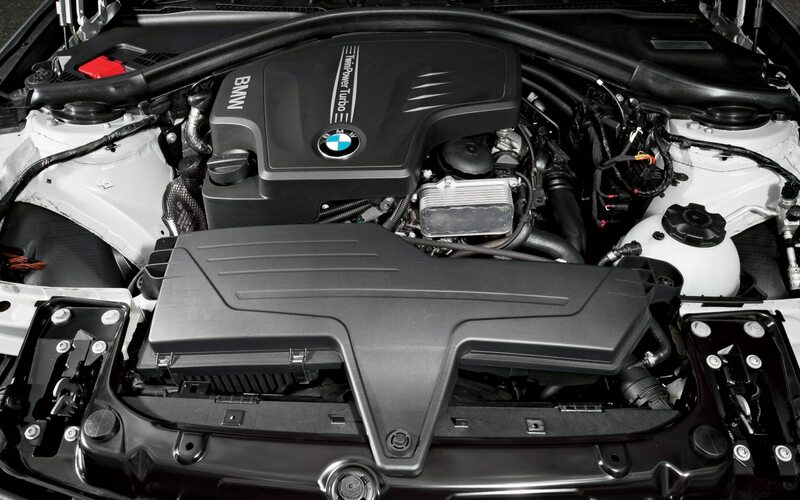 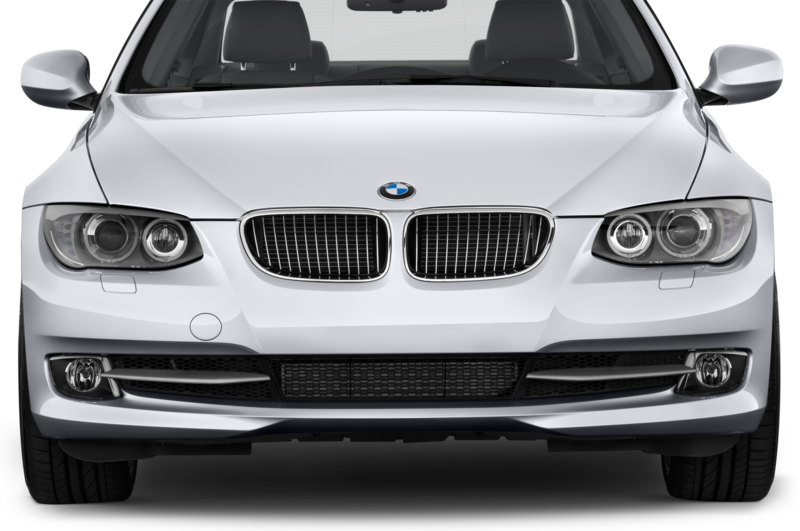 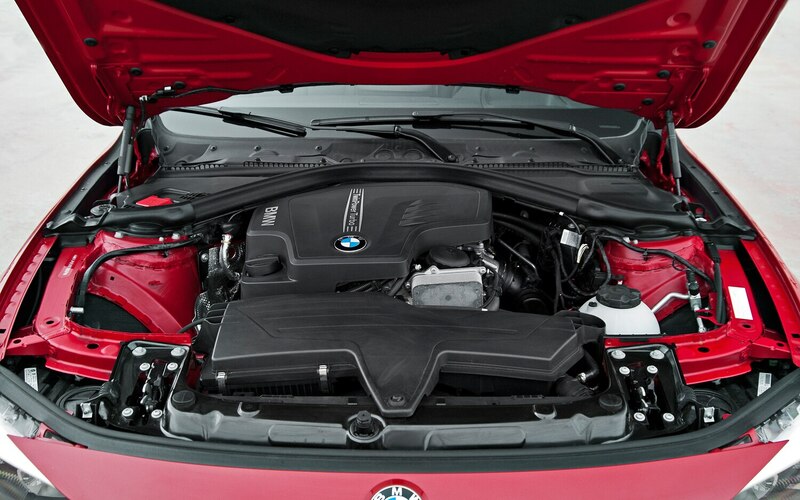 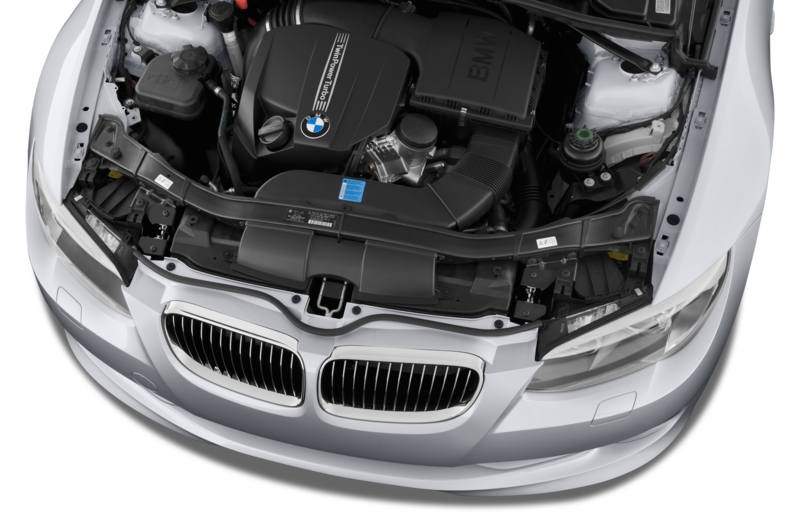 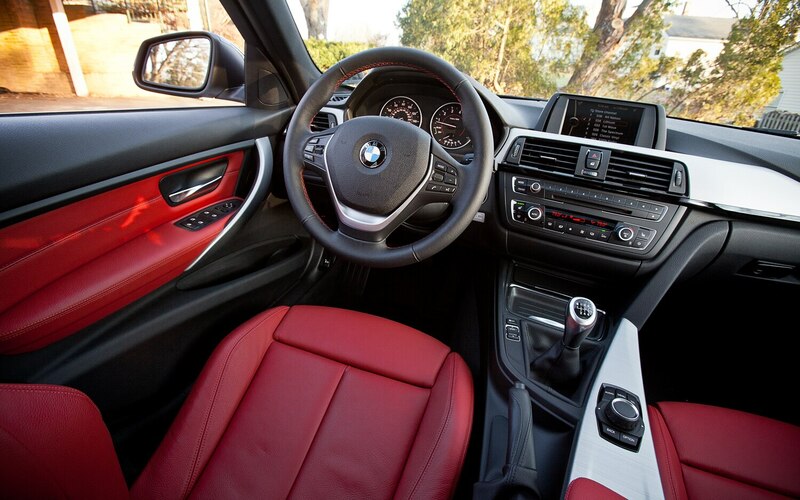 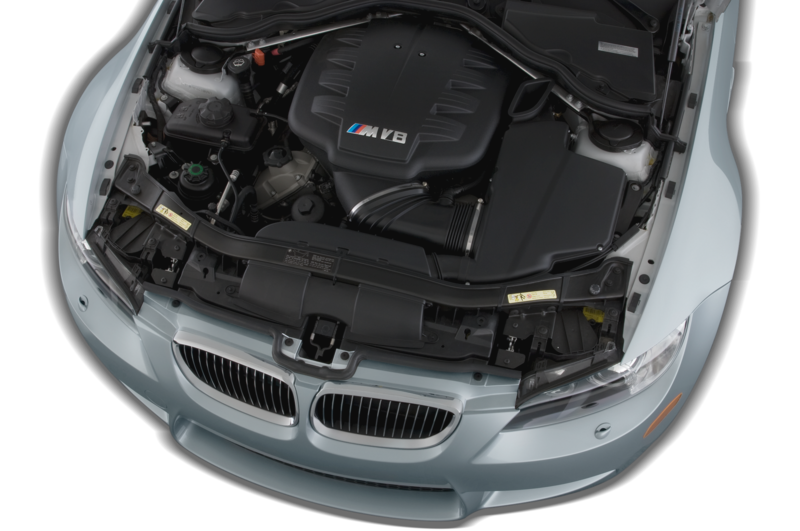 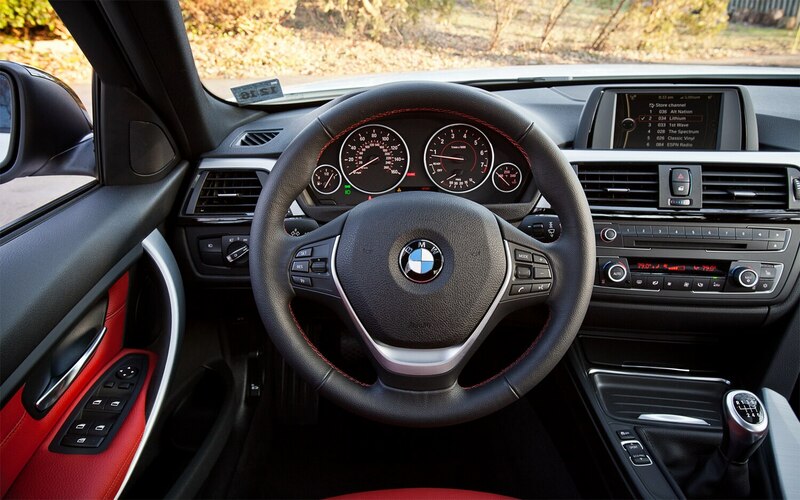 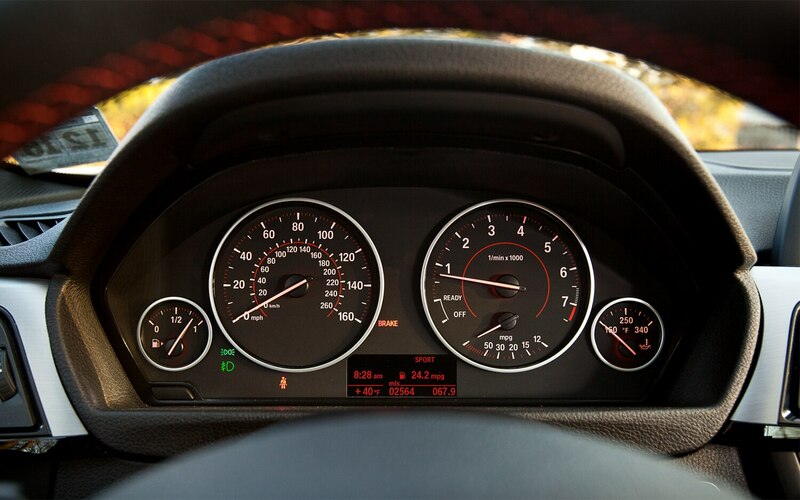 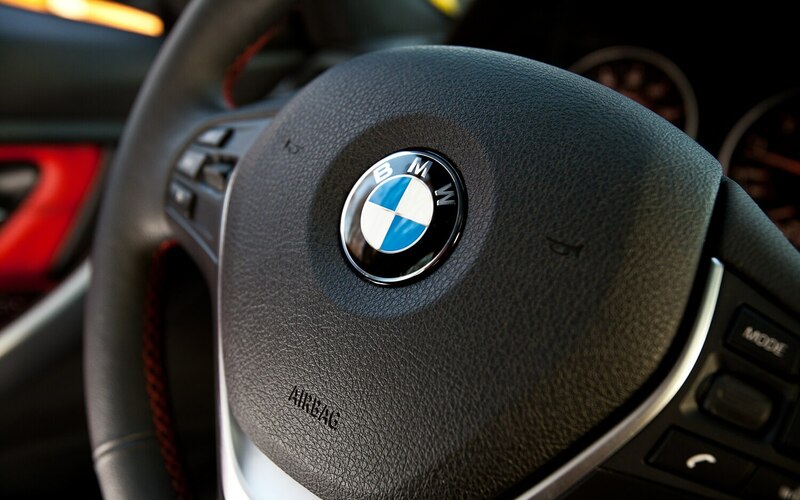 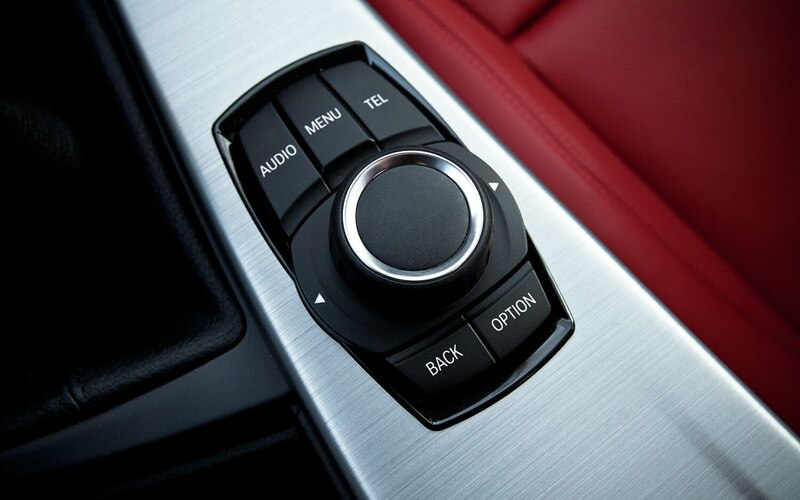 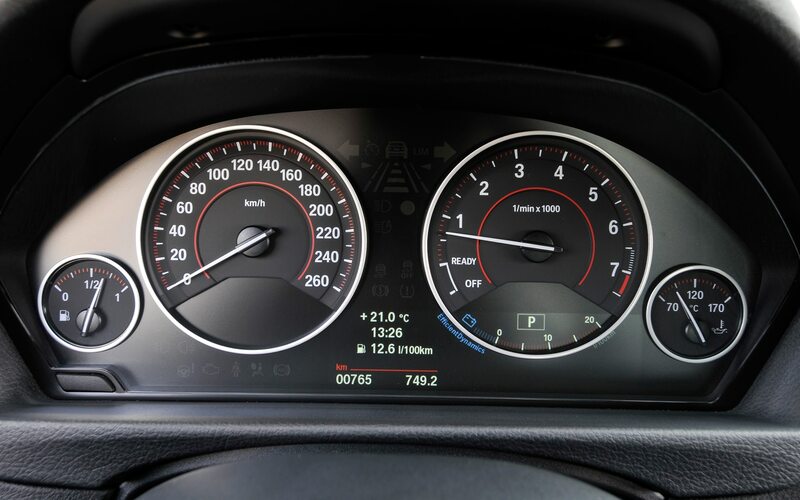 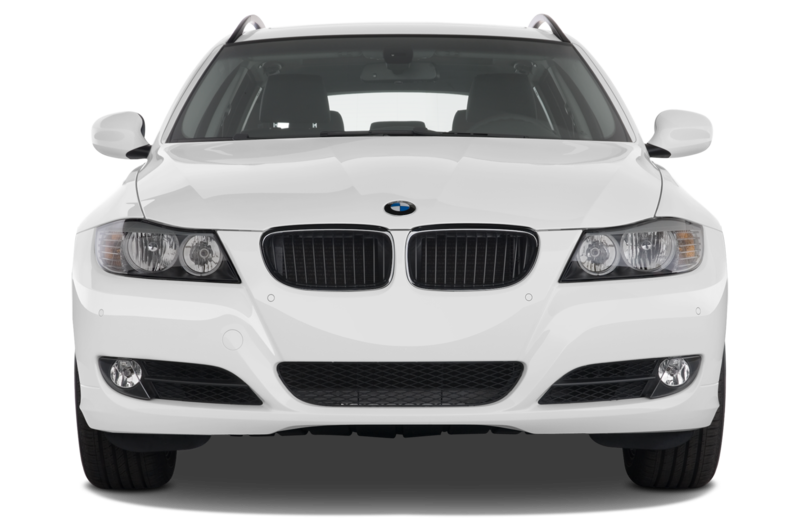 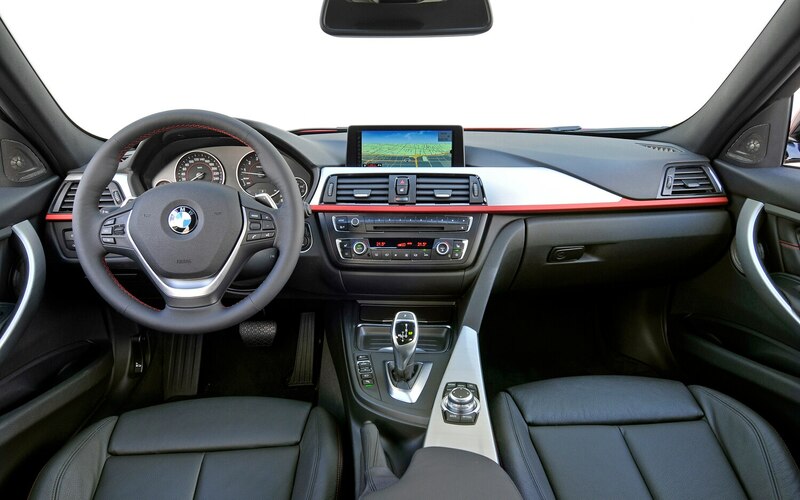 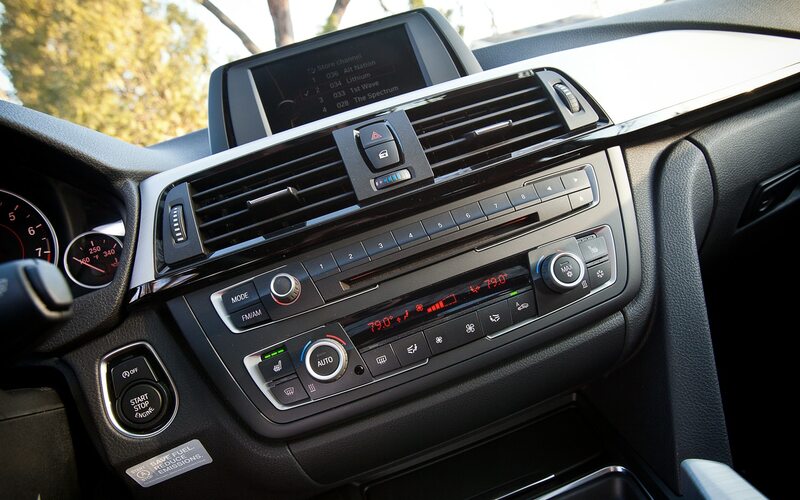 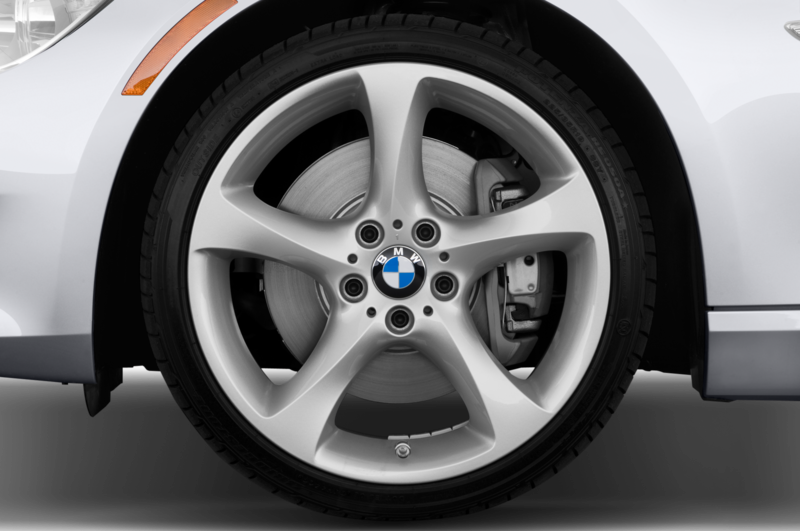 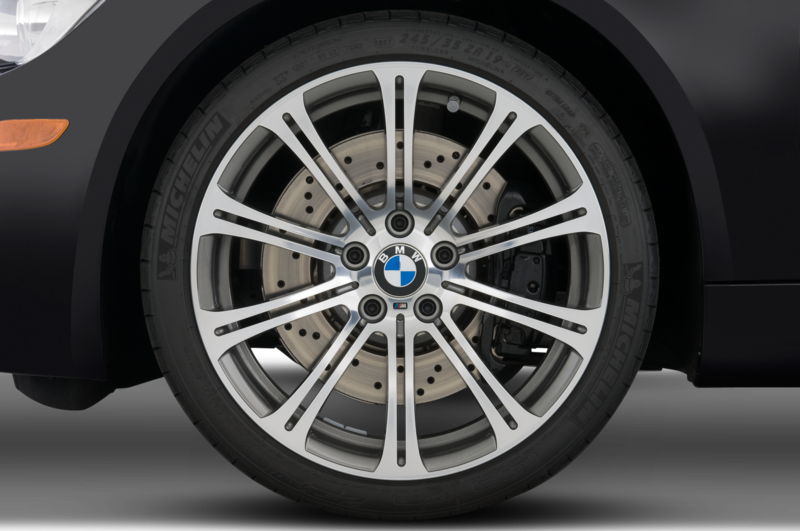 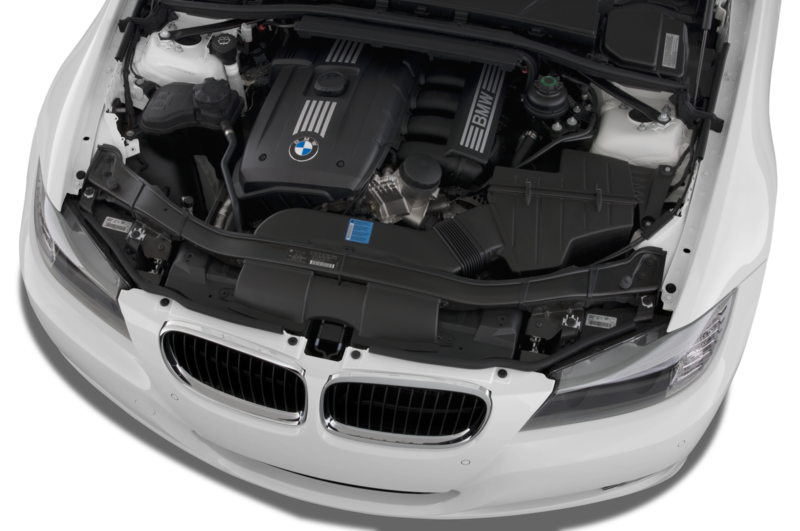 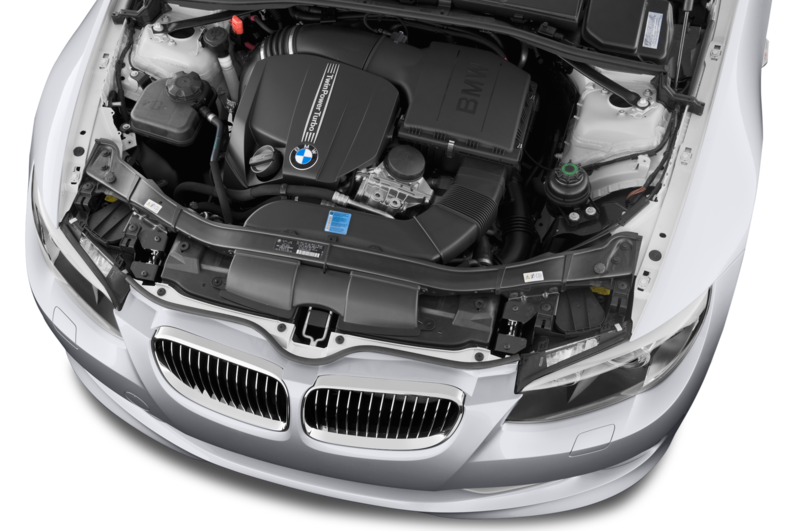 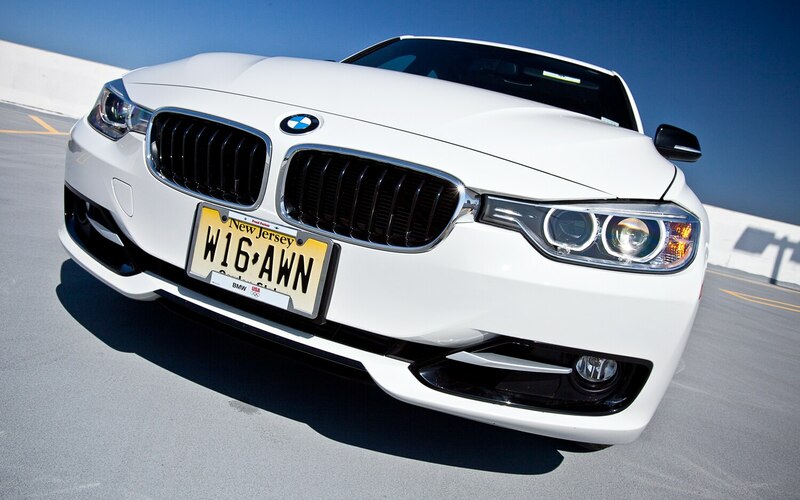 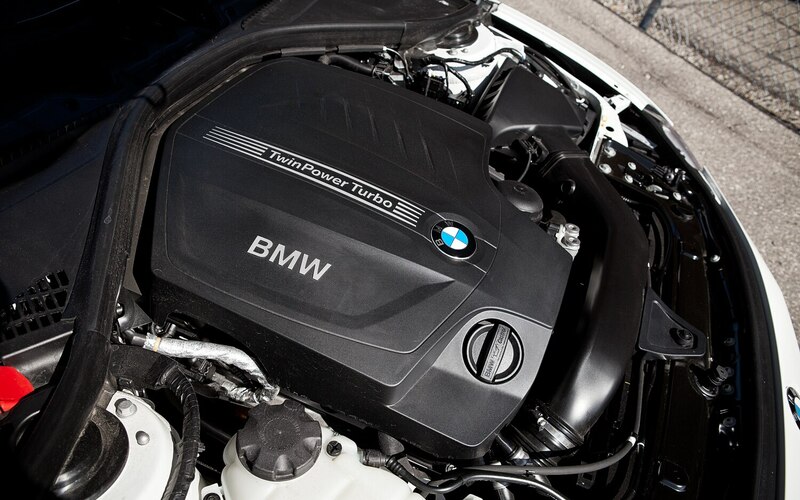 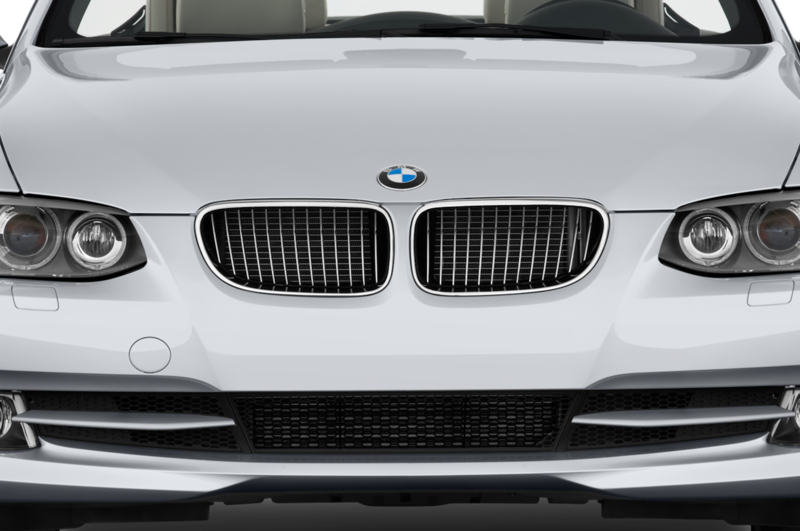 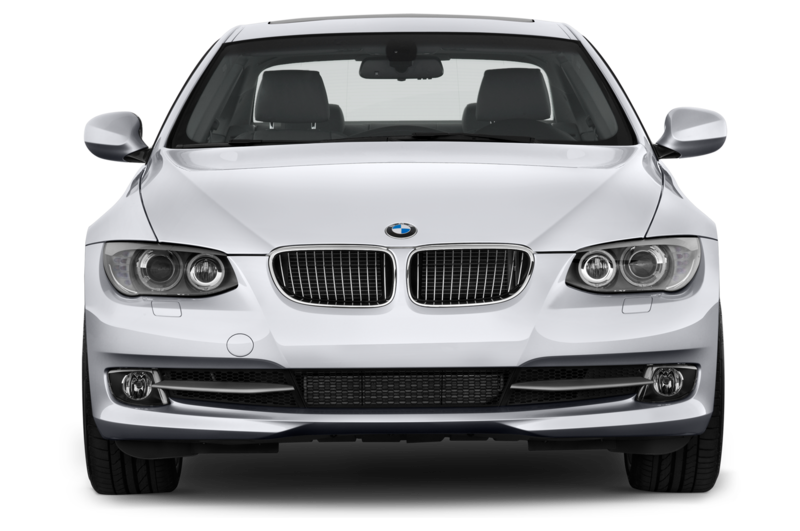 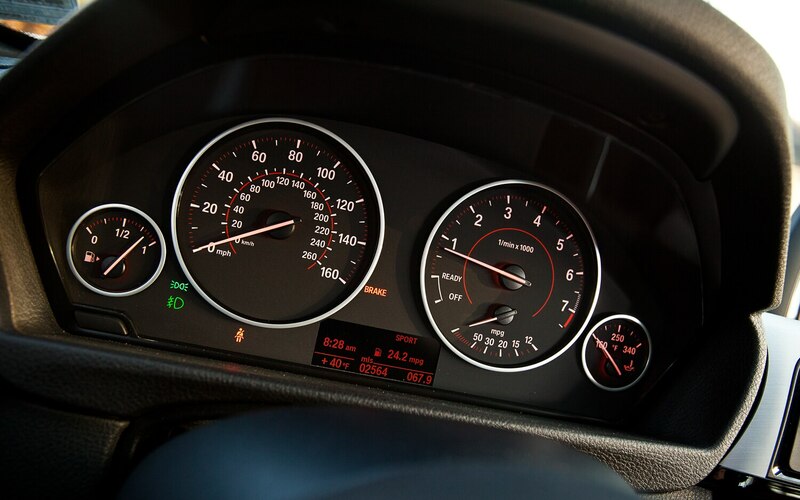 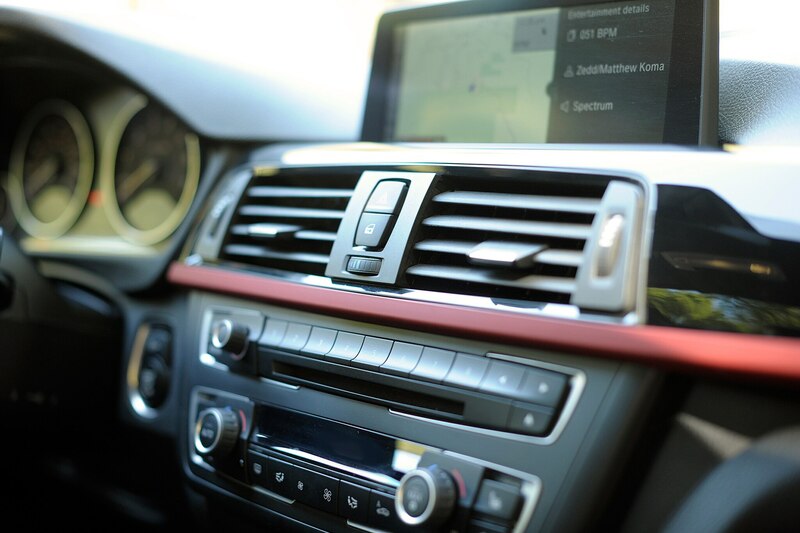 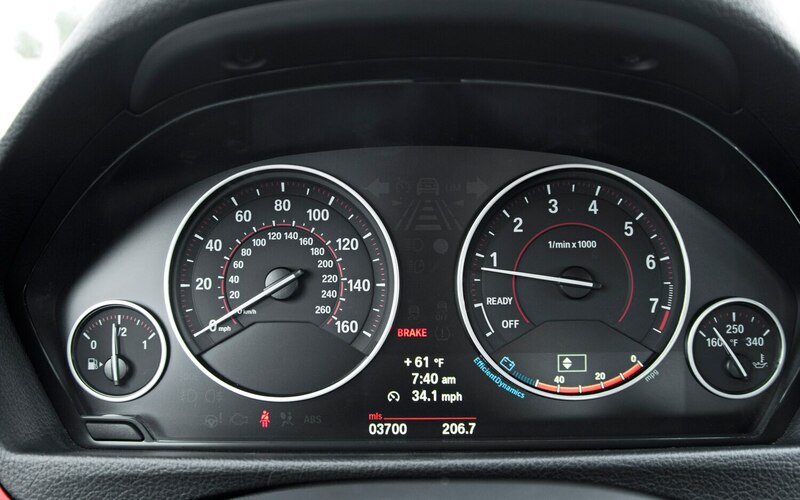 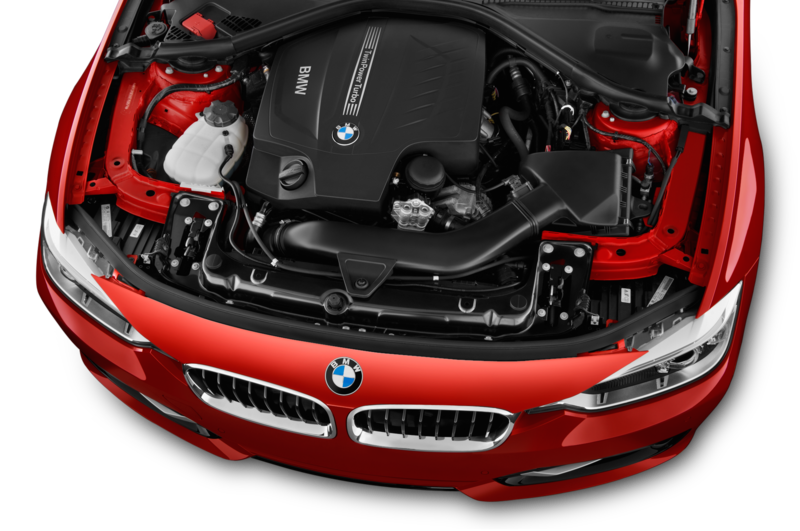 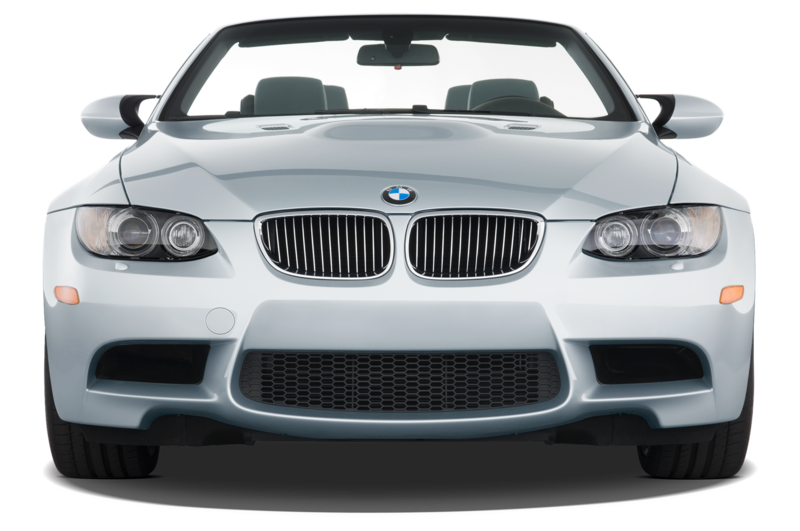 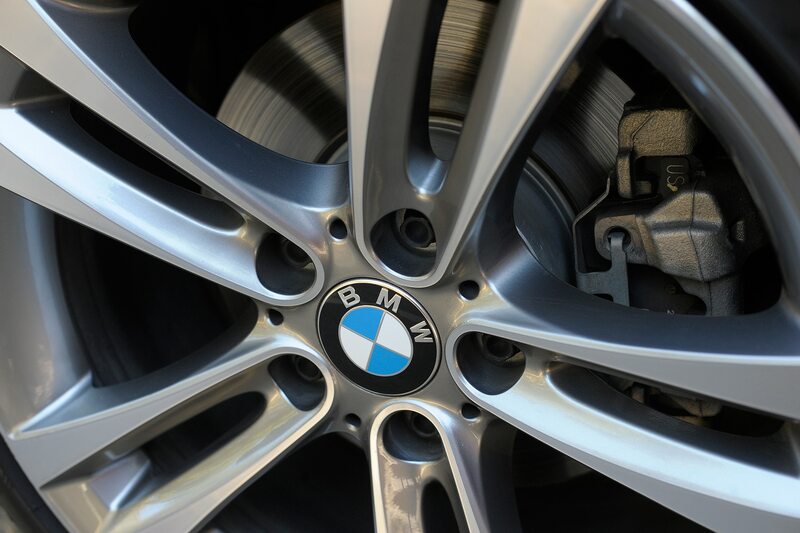 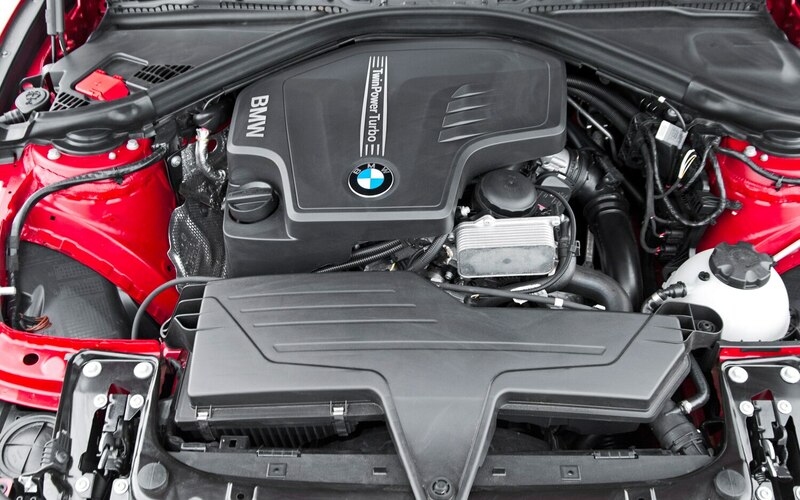 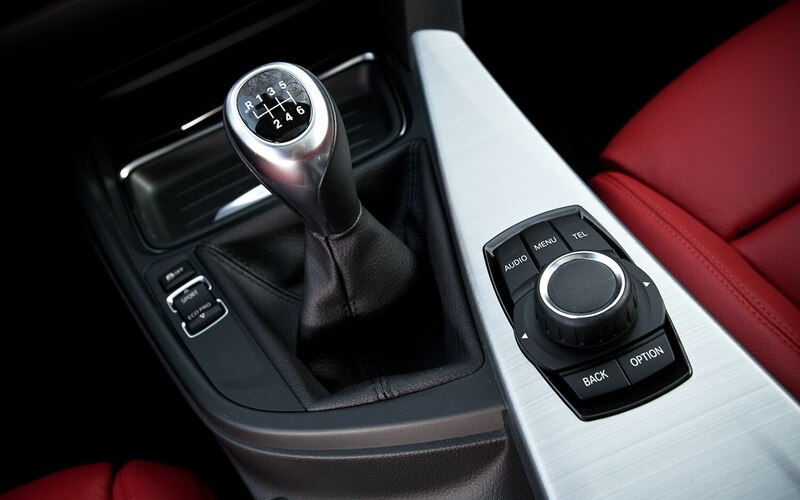 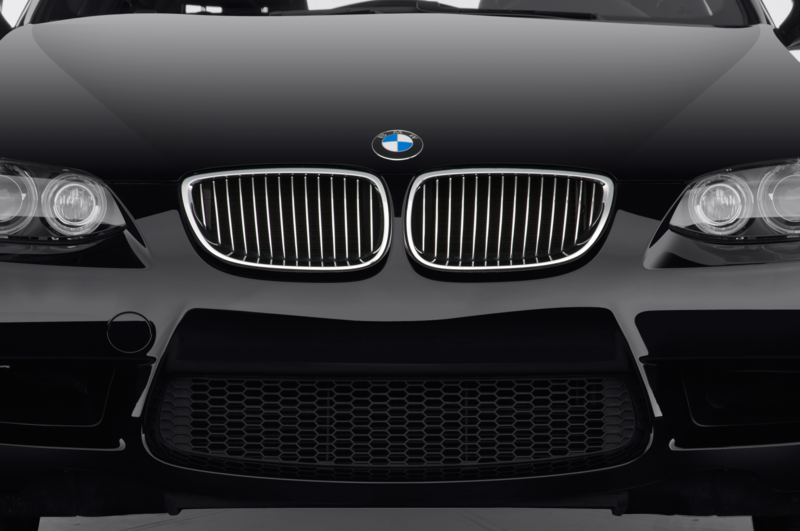 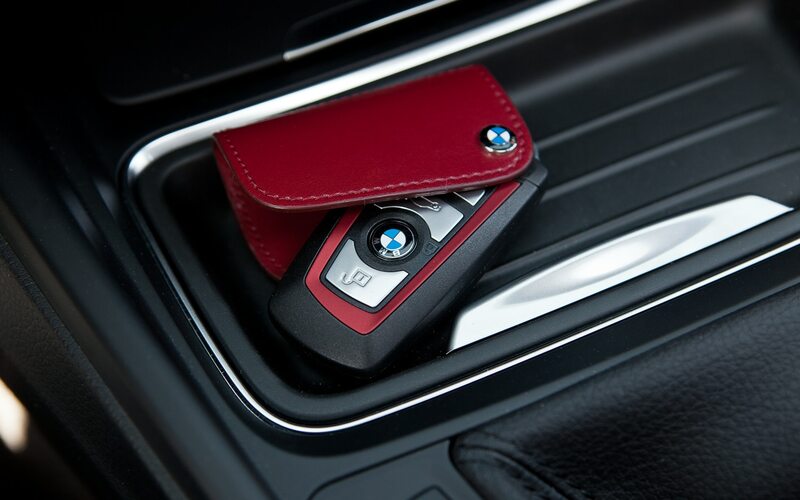 The BMW’s engine and transmission are both efficient and charismatic. 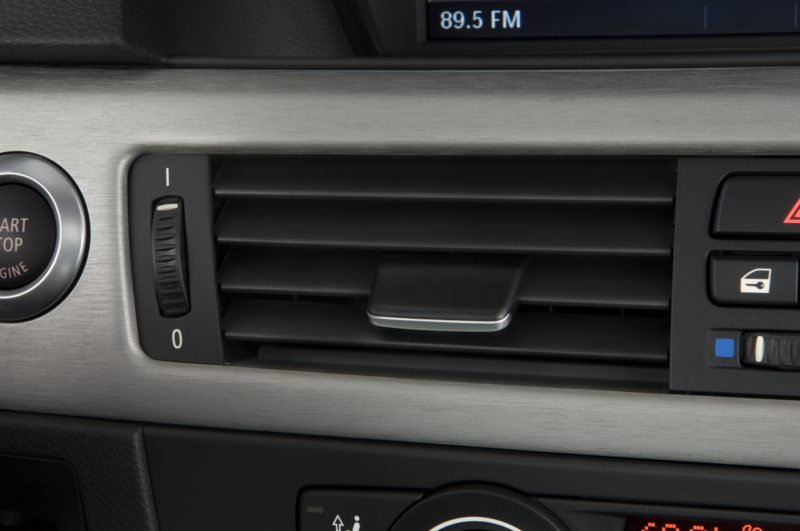 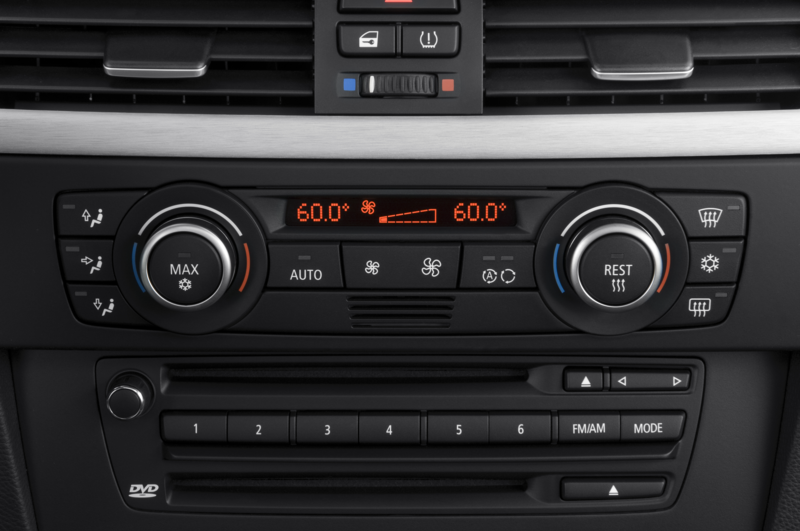 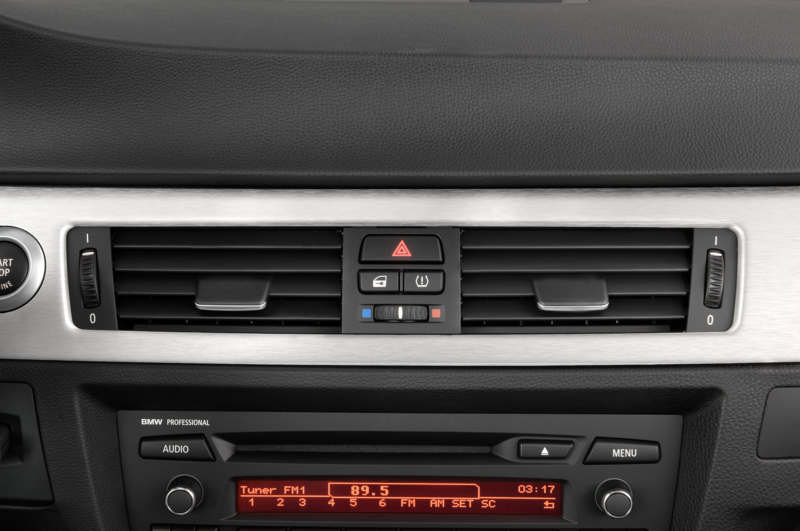 The in-line-six is ultra smooth at idle but sings a happy tune in the upper rev ranges. 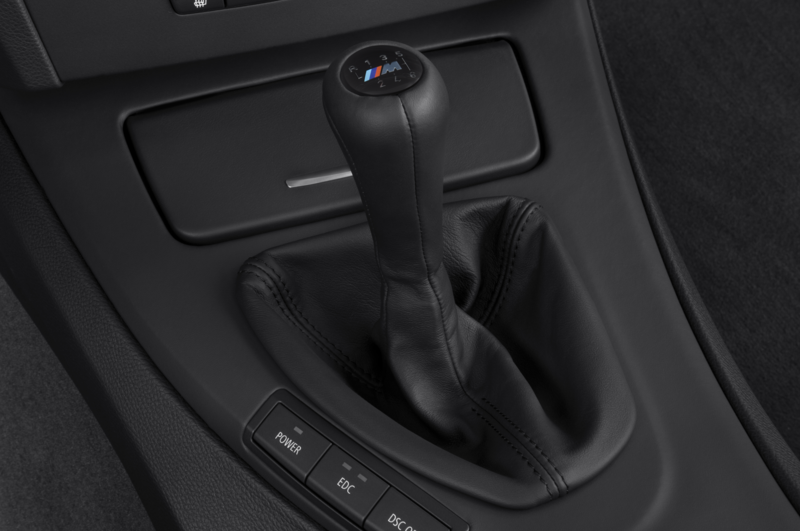 While parking the 335 in our nearby garage, I left the manual shifter in first, rolled down the windows, and pasted a huge smile on my face during the six-floor climb. 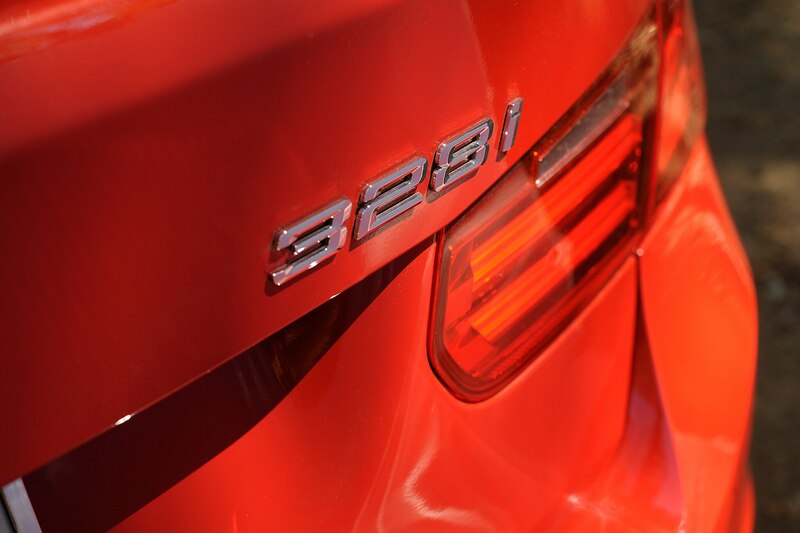 I love our Four Seasons 328i, but the 335i’s engine provides charisma that the 2.0-liter four can’t match, and 3-series buyers would do well to not write off the big engine in their quest for a fun, efficient sport sedan. 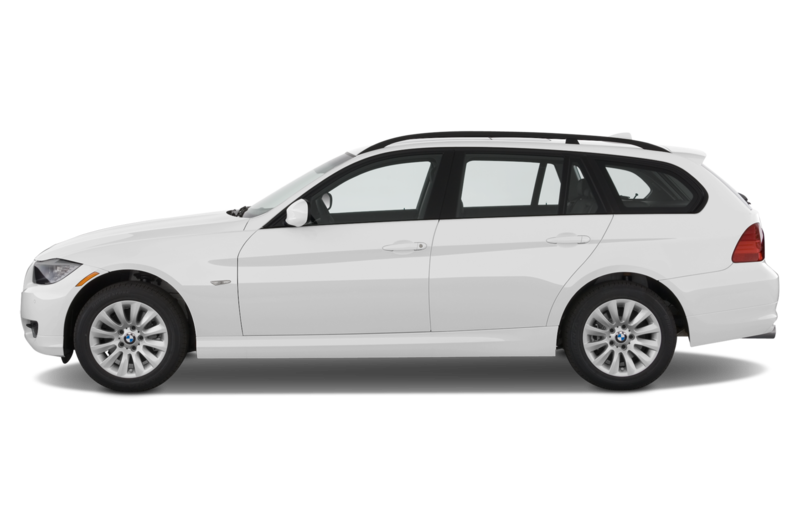 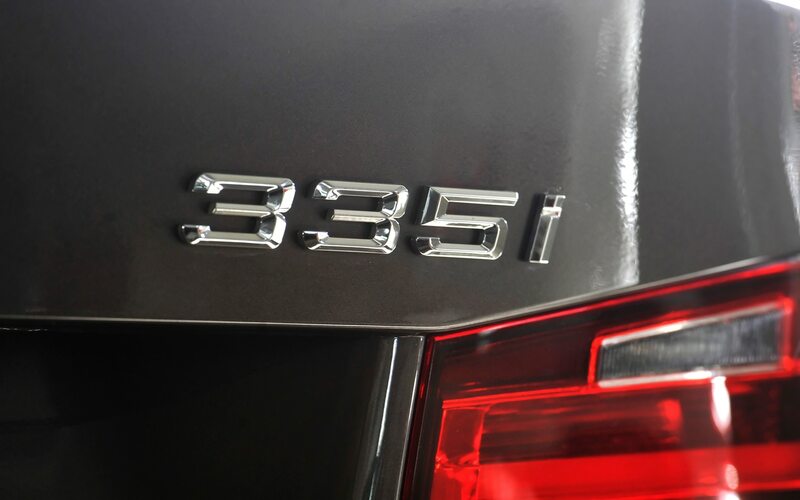 I drove the BMW 335i within a day or two of driving our new four-cylinder 328i Four Seasons car, so powertrain comparisons are inevitable. 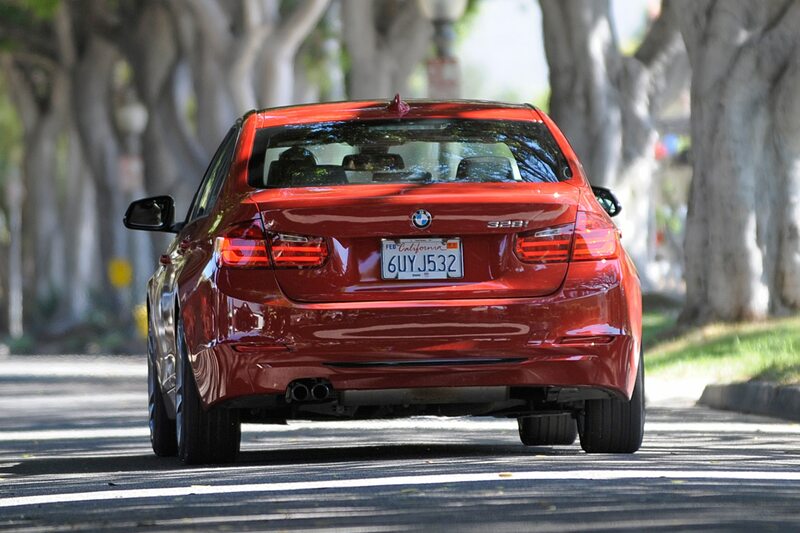 The 328i’s four-cylinder is actually quite a lot of fun, but there’s still no substitute for an in-line six. 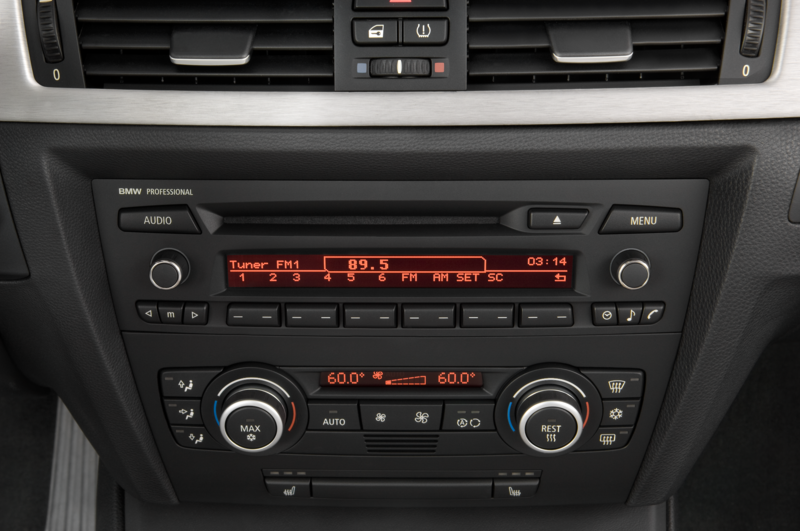 It’s responsive and smooth and sounds great. 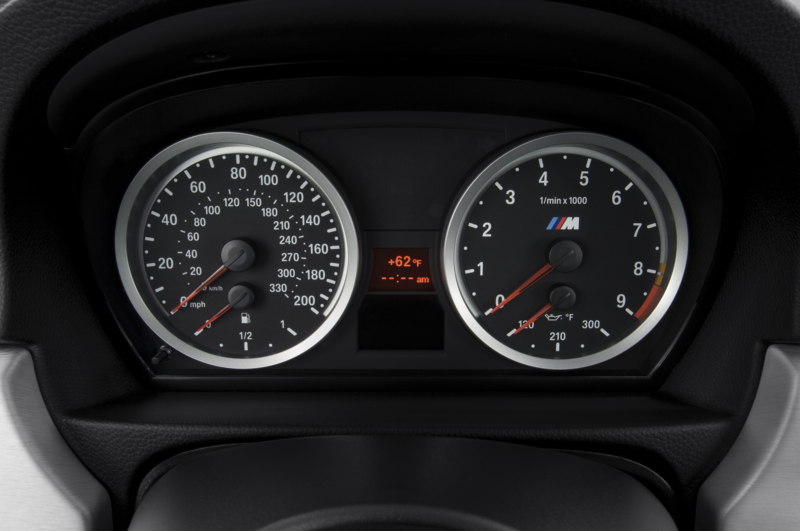 As a few of my colleagues have noted, however, throttle response is not progressive at low speeds. 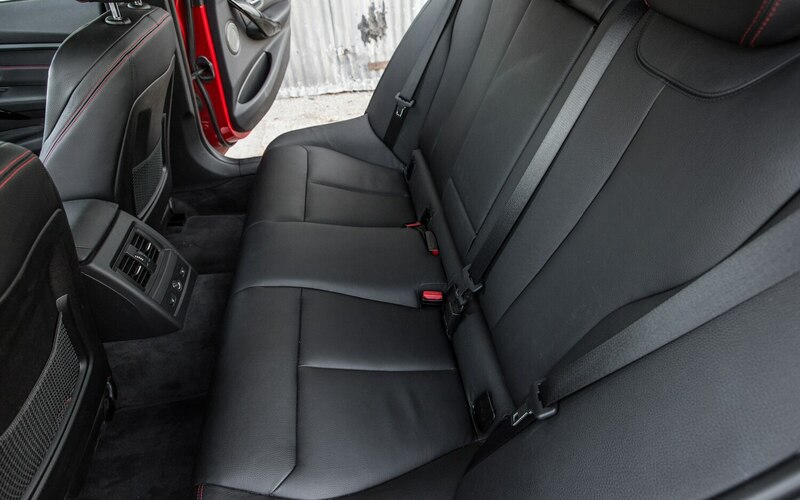 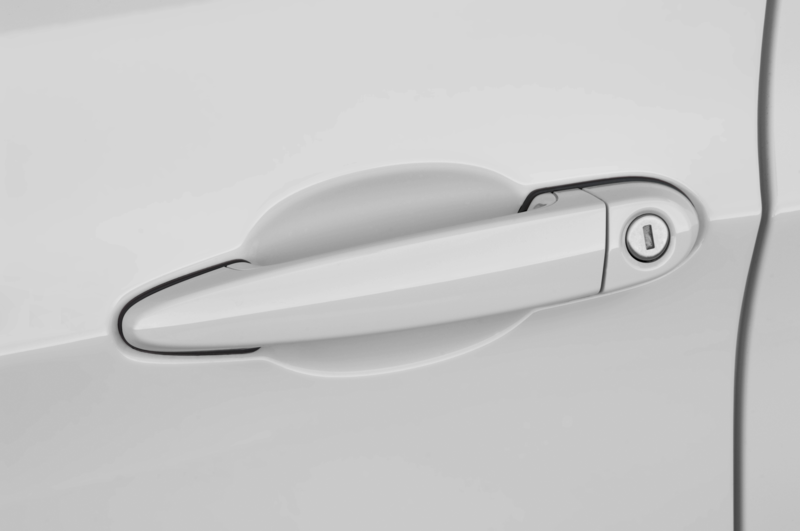 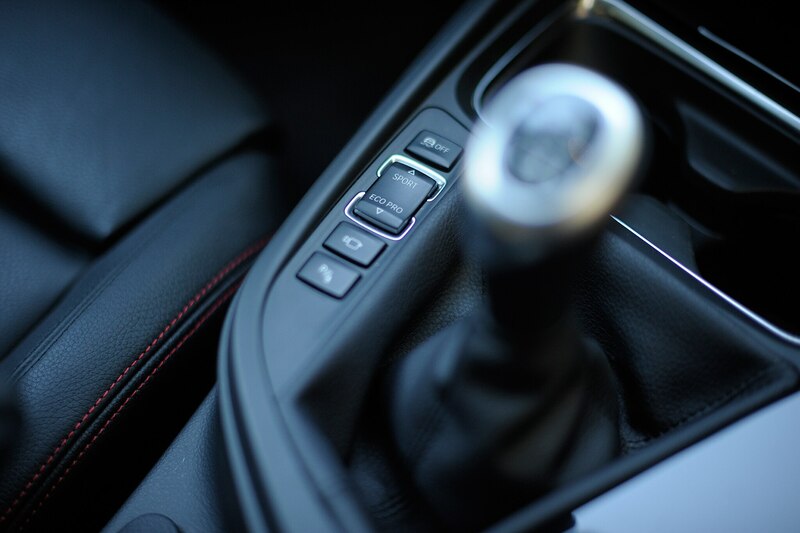 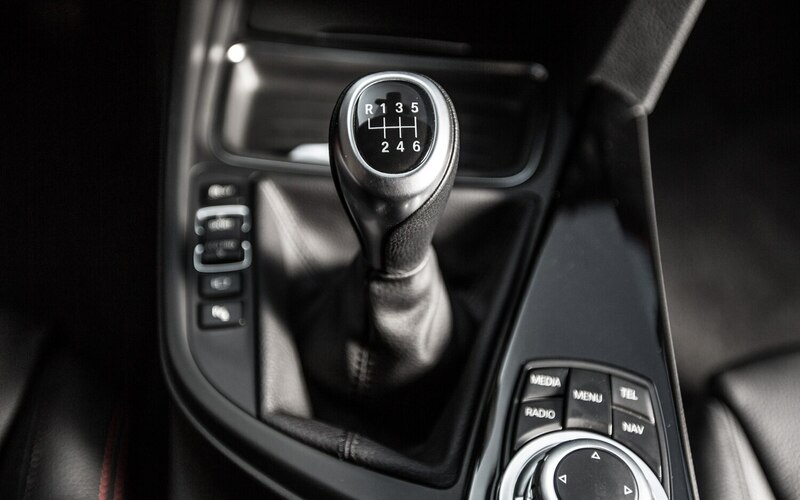 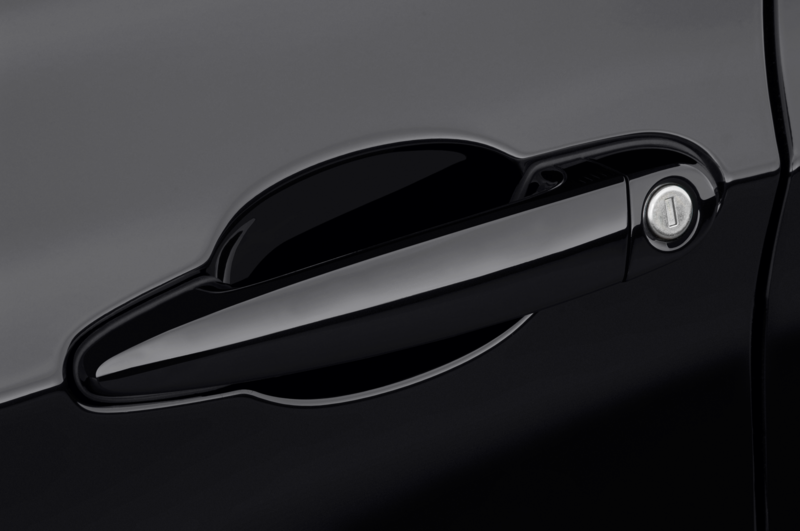 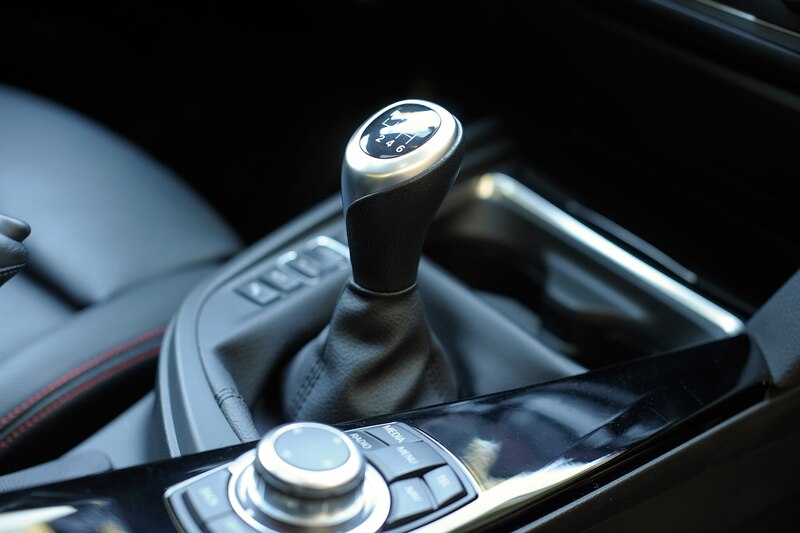 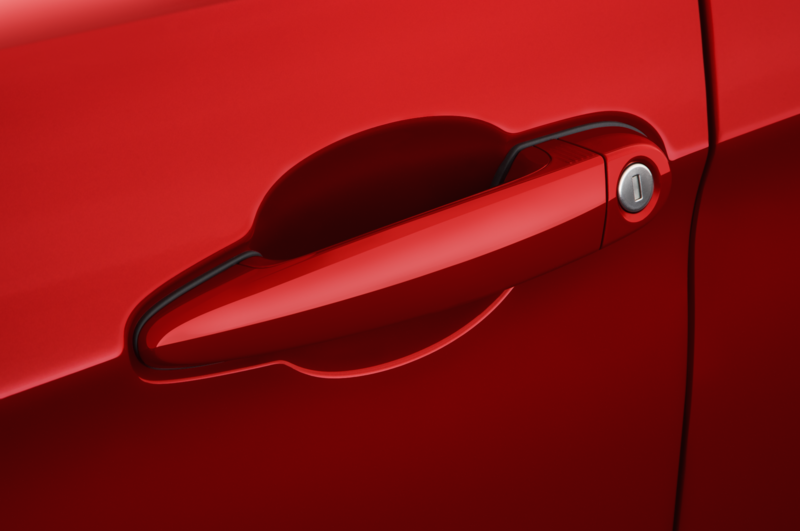 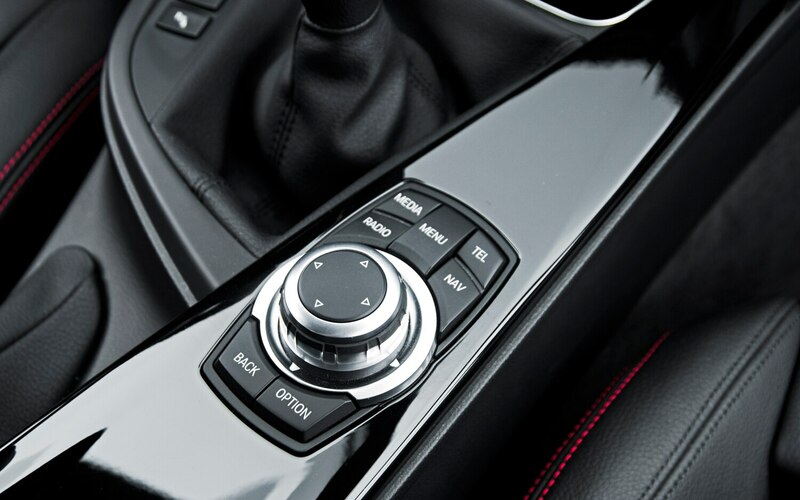 It’s like you get all or nothing – when you reach a certain point in the pedal travel, it’s as if the car has been unleashed, which isn’t so bad when you’re driving aggressively but can be disconcerting when you’re leisurely pulling away from a stop sign. 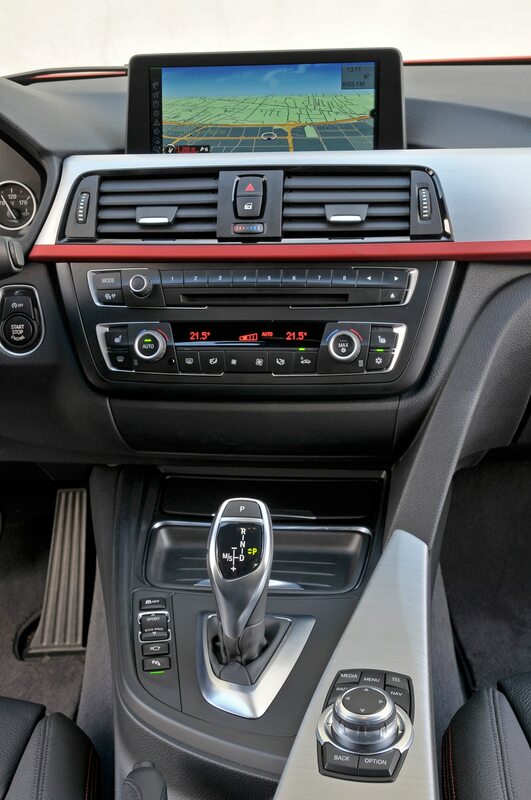 This isn’t unique to the 3-series or to the manual transmission. 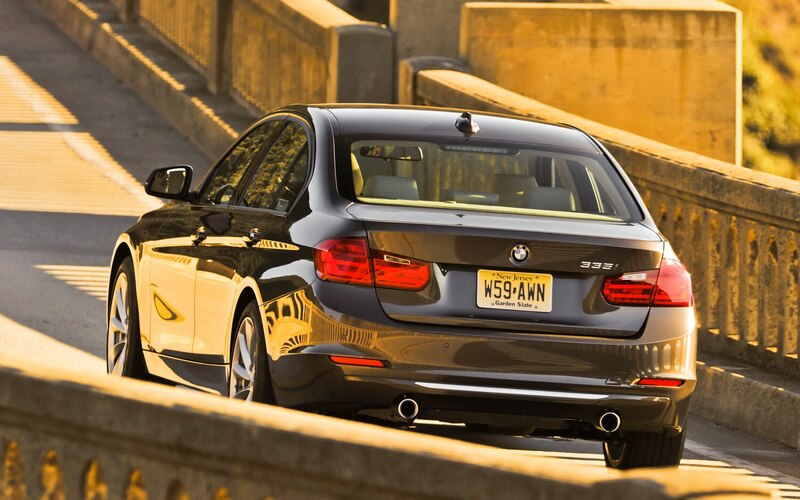 It seems as if it’s been engineered into every BMW I’ve driven lately. 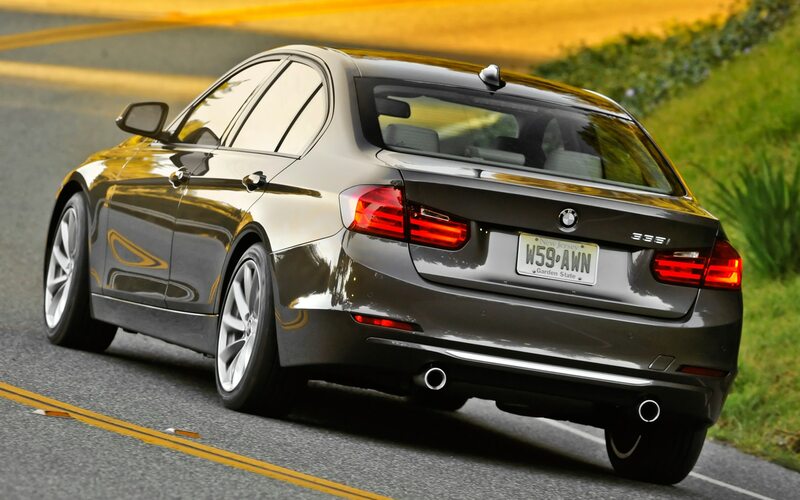 I echo those who say that BMW buyers, even those for whom fuel economy is a big concern, shouldn’t ignore the six-cylinder 3-series. 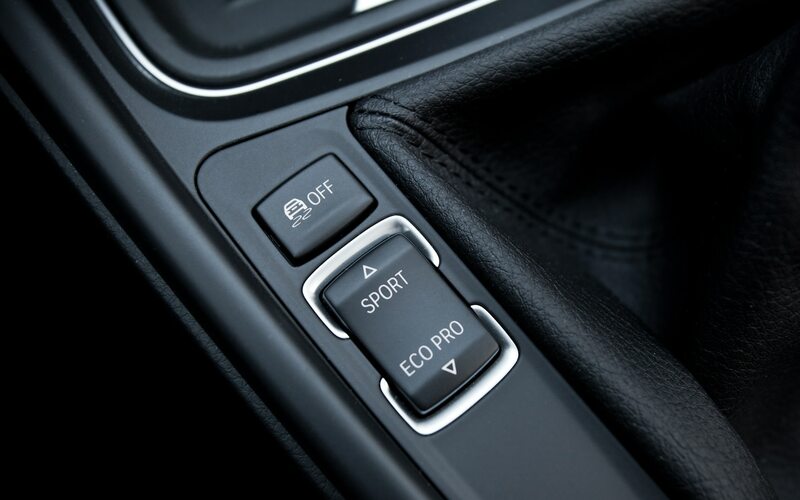 It’s EPA rated at 30 mpg on the freeway, and, at least when I drove it, the restart in “ECO” mode felt smoother than with the four-cylinder engine. 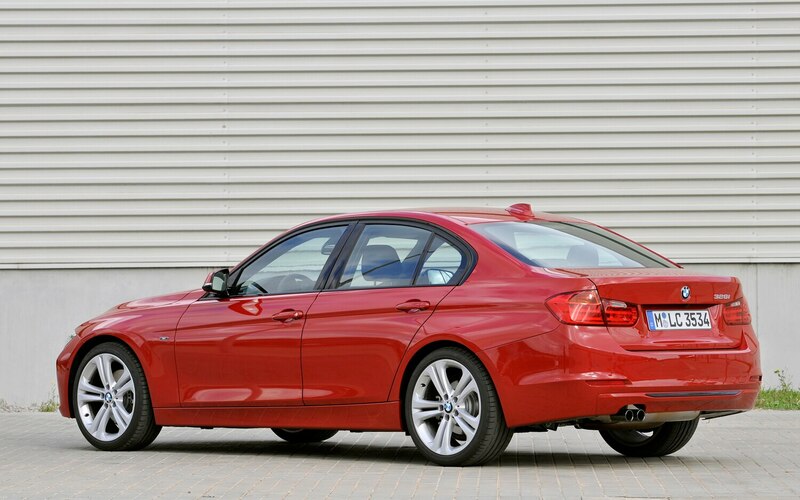 Also, this test car, equipped quite nicely, comes in at the same price point as our fully optioned Four Seasons 328i. 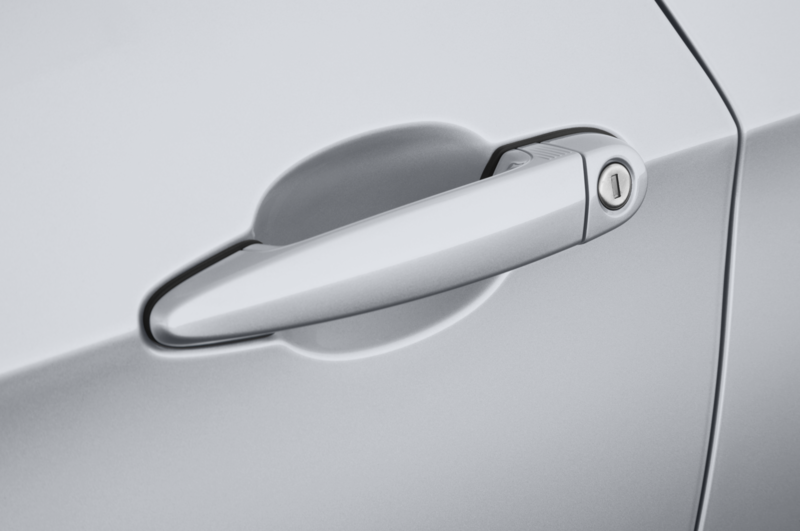 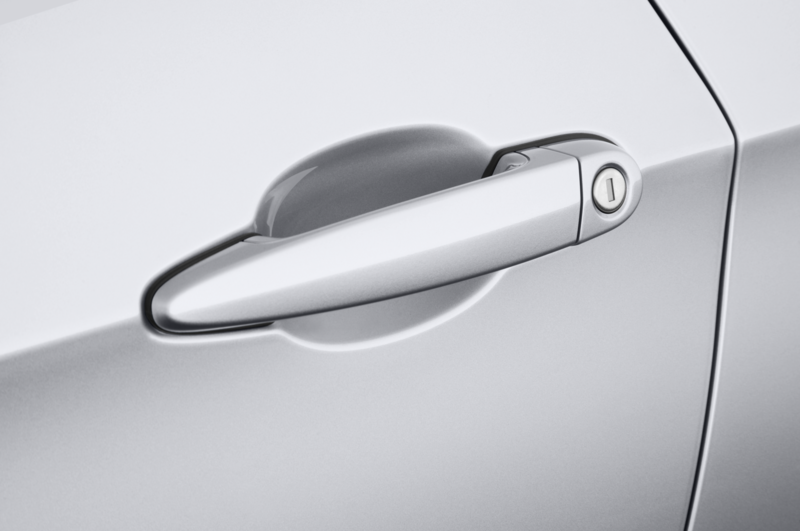 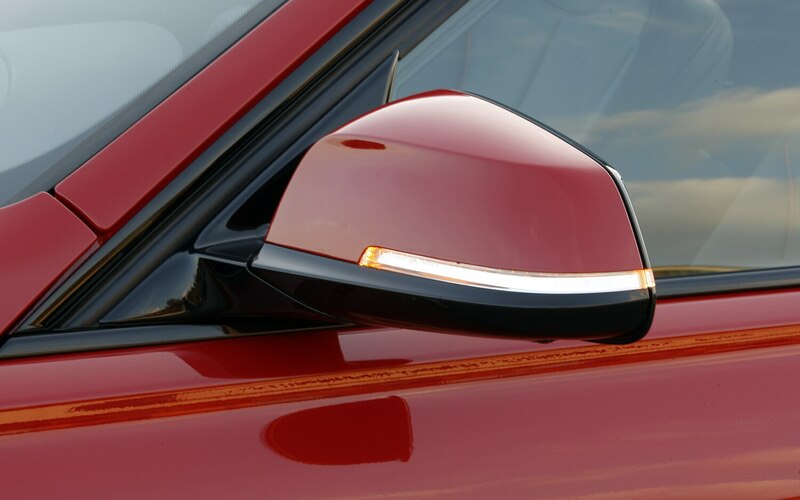 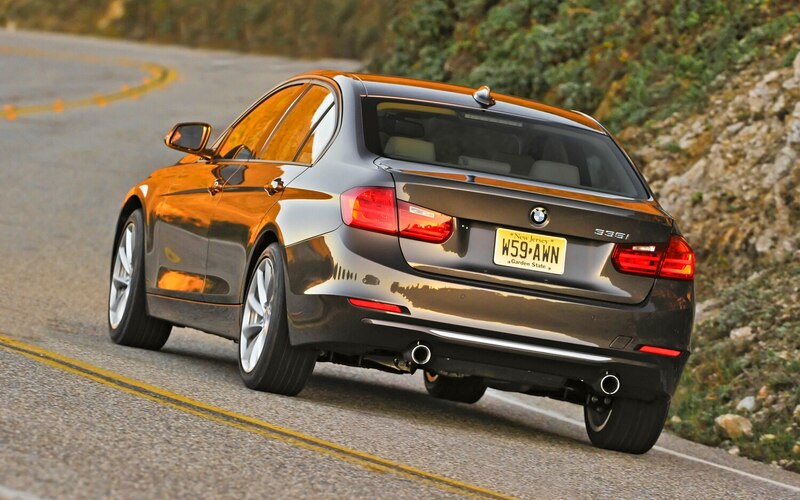 Oftentimes, what BMW defines as a new iteration of its volume leader doesn’t look or feel all that new. 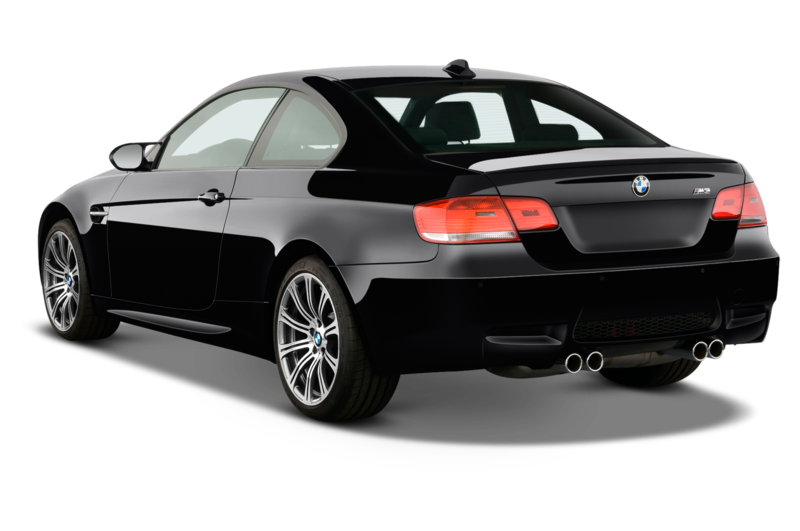 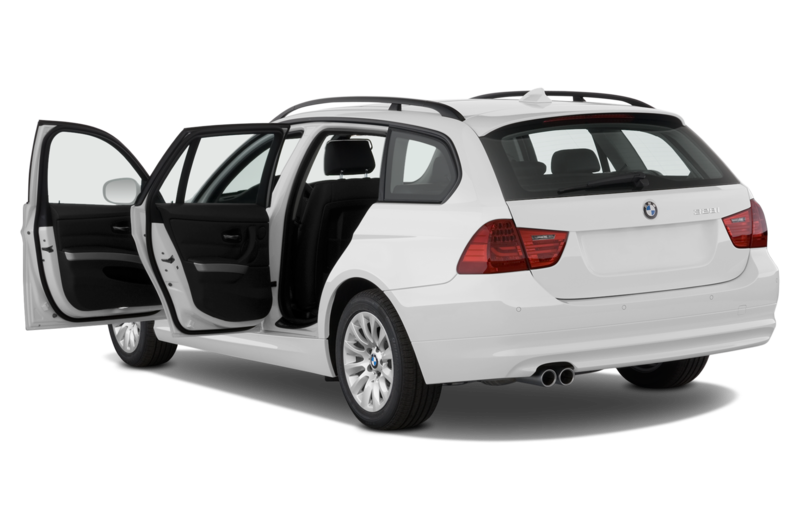 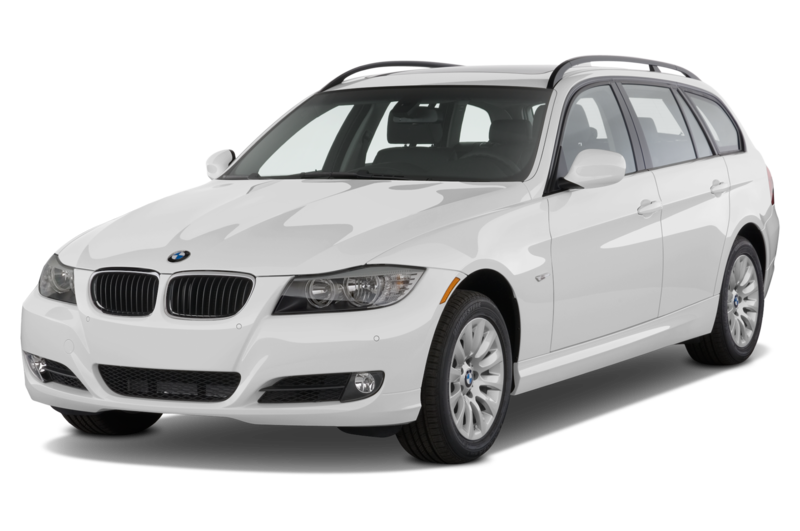 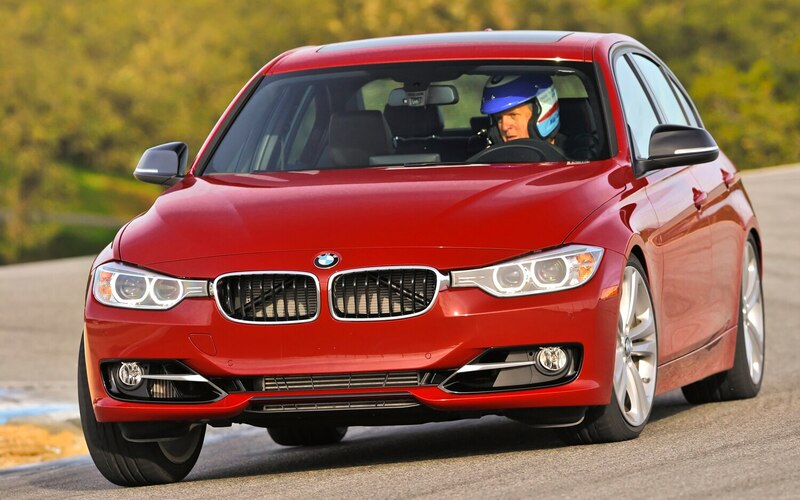 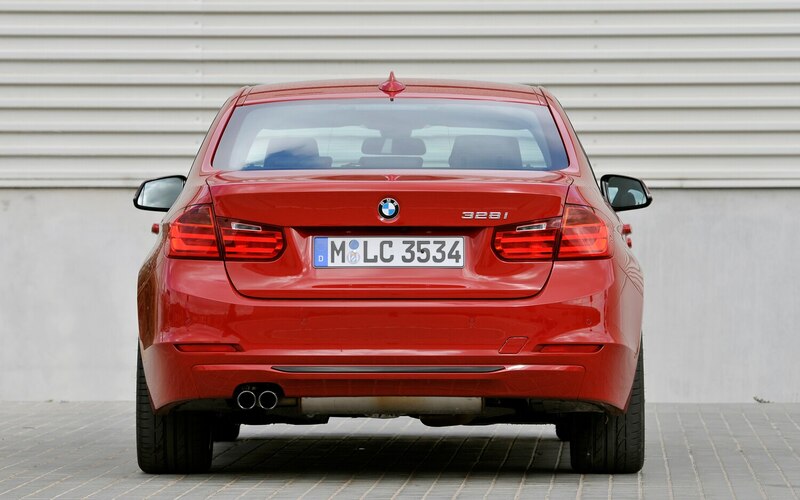 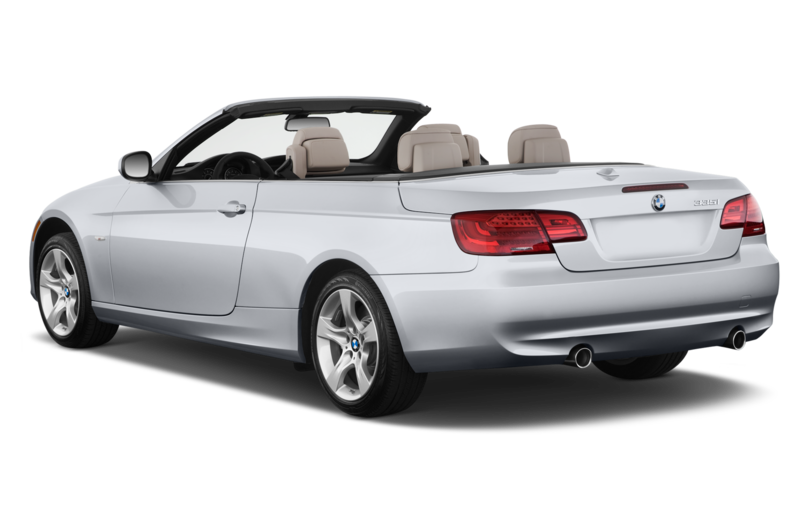 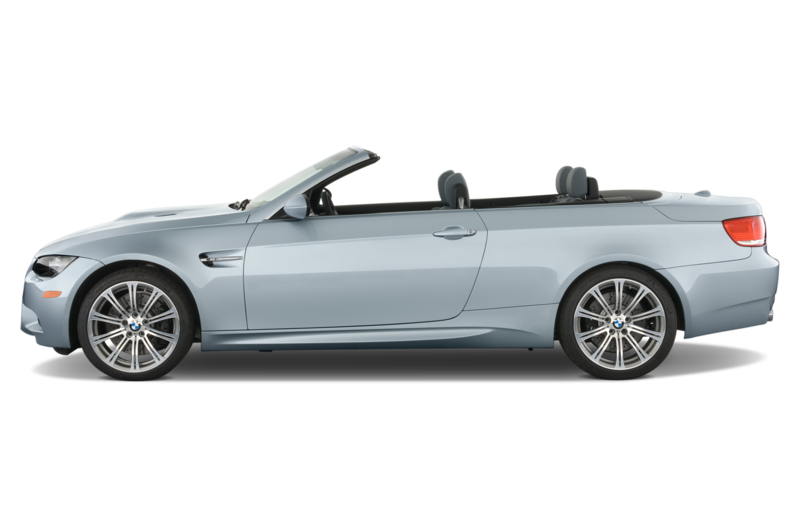 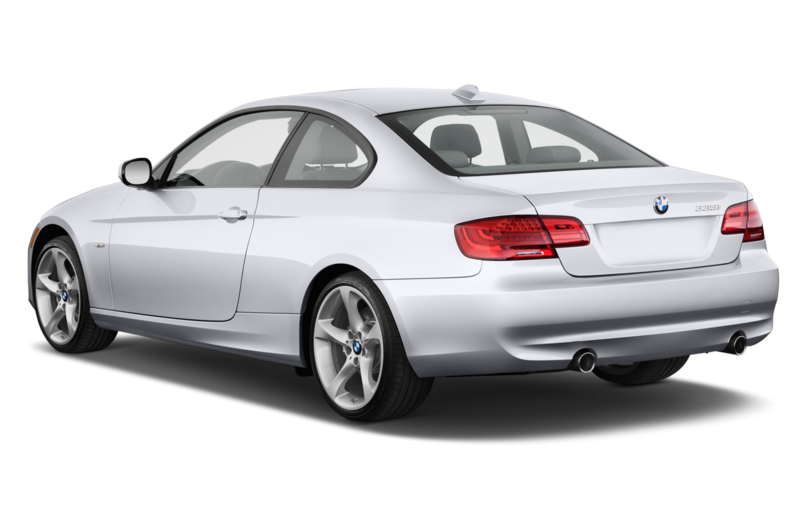 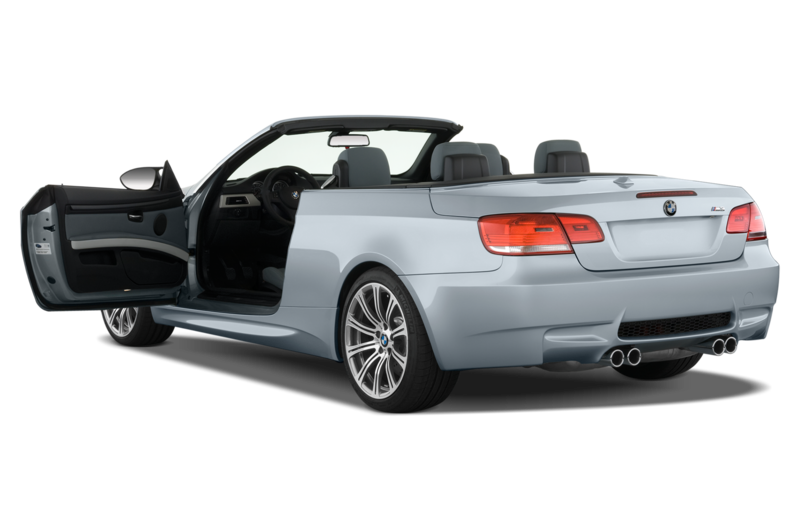 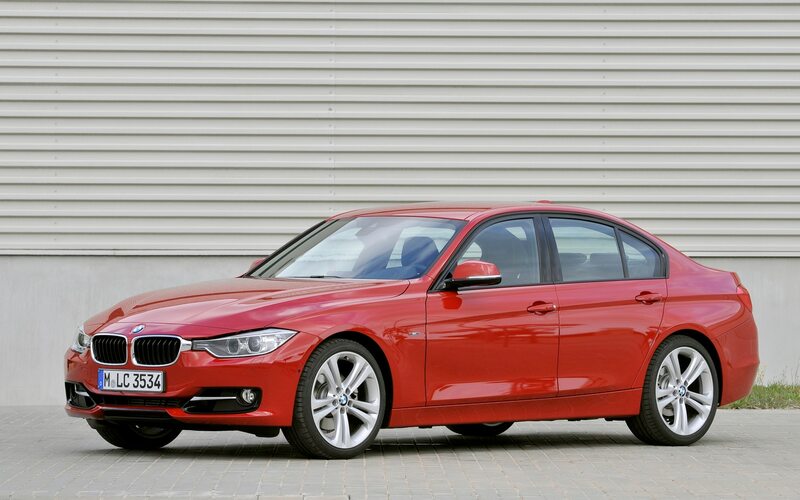 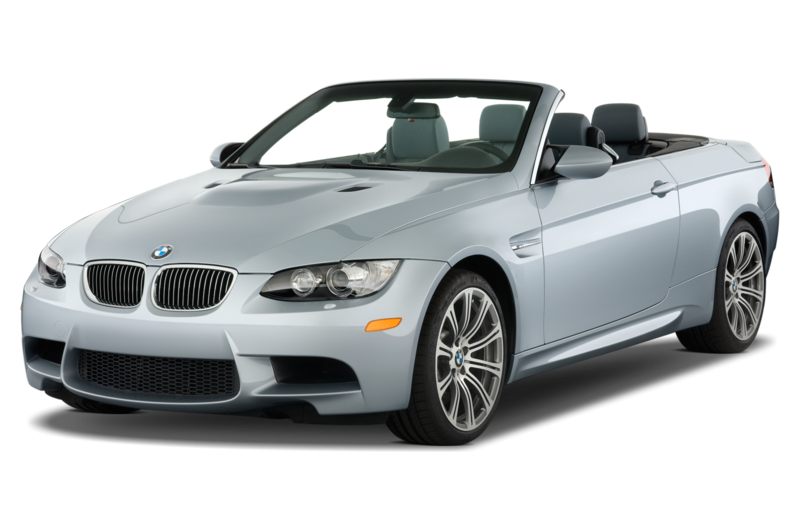 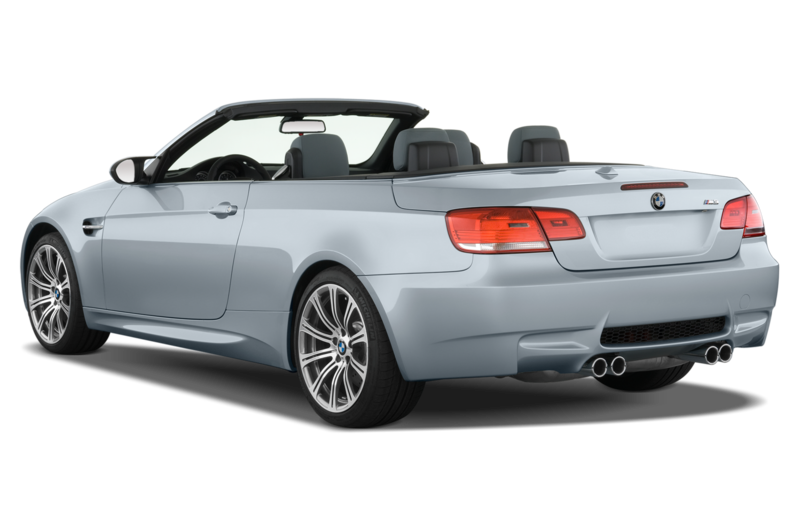 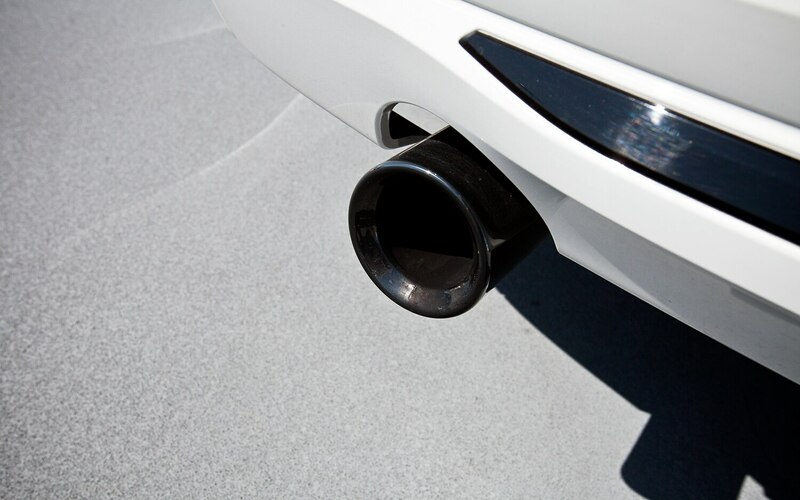 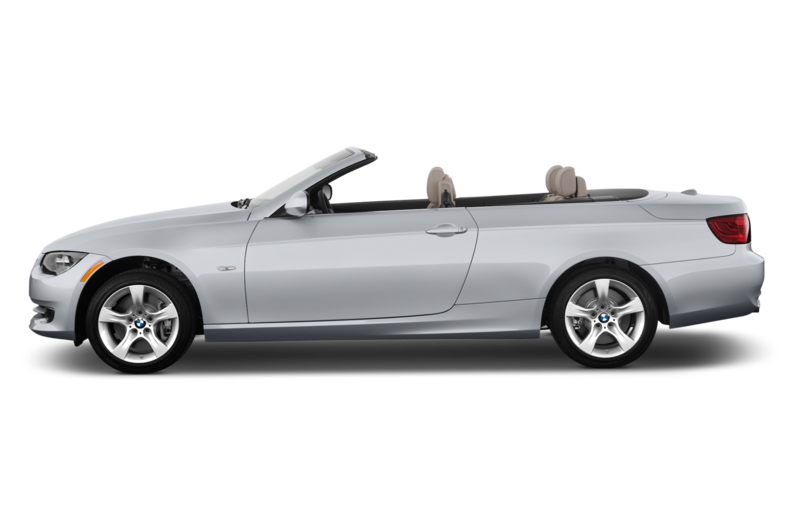 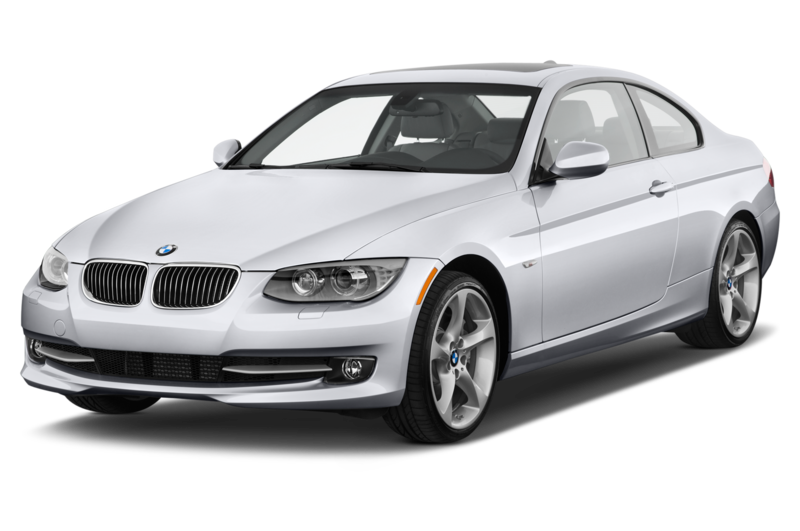 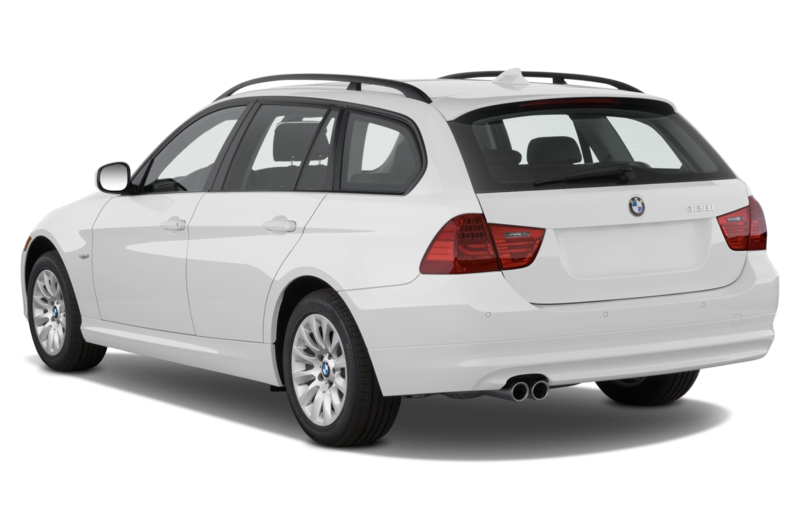 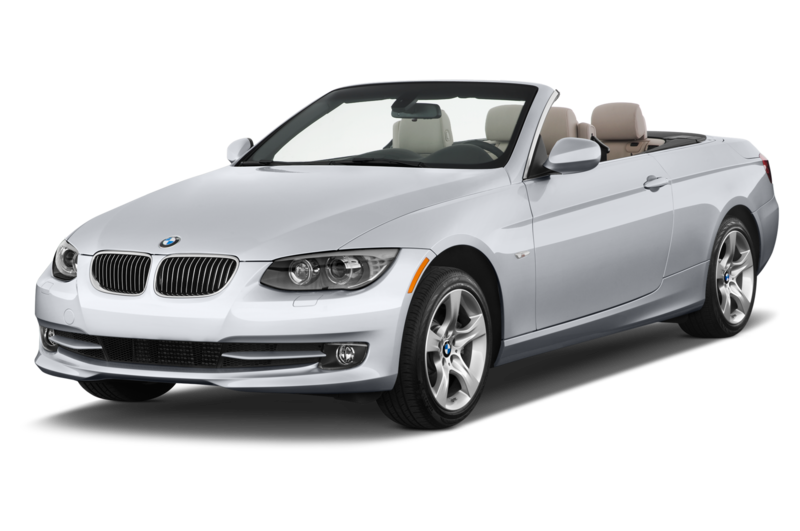 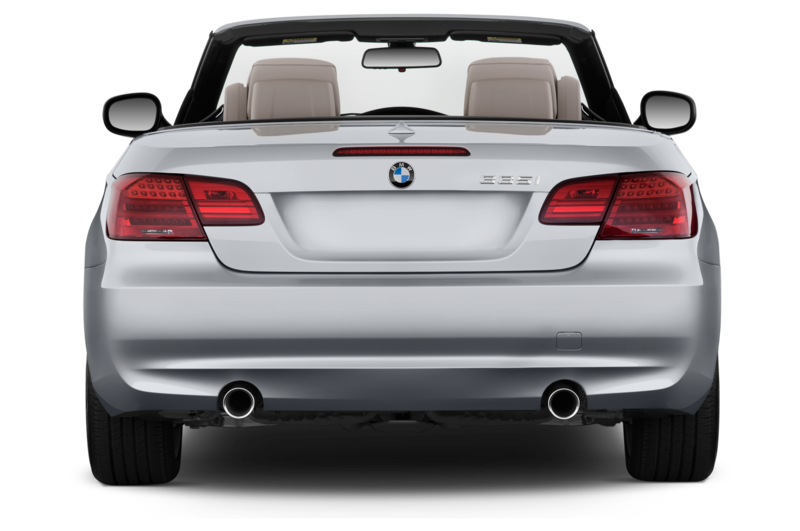 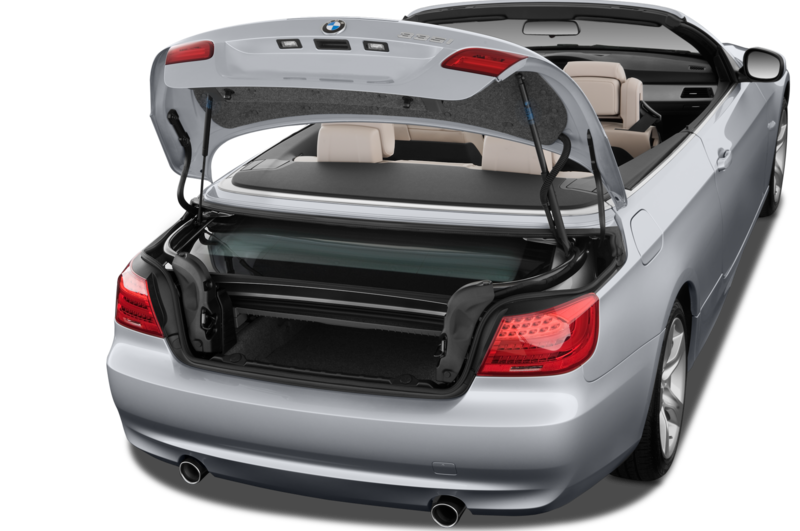 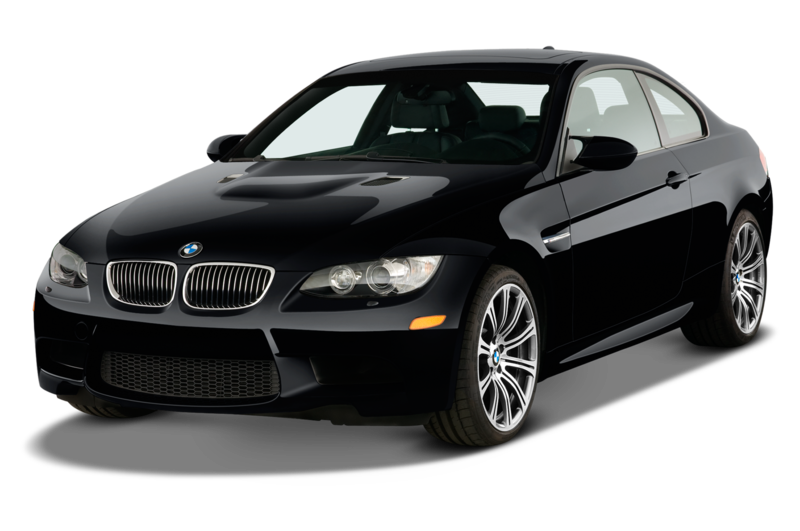 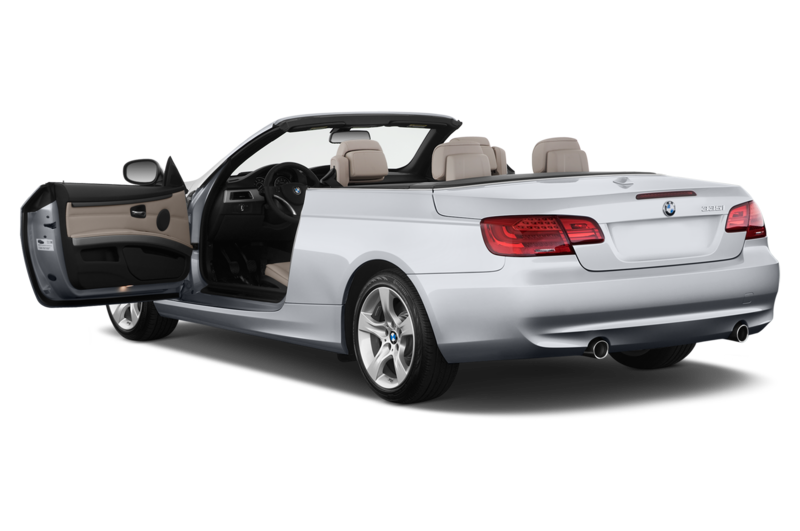 The 2012 3-series is a refreshing break from this evolutionary tradition. 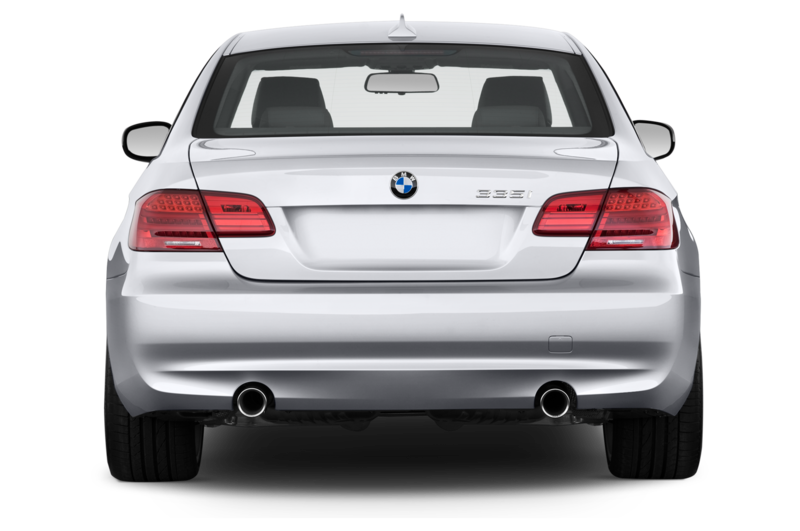 Though some complain about the 3’s increase in size and its resemblance to a 5-series, it’s one of the first non-M-tuned 3-series models I find myself excited by. 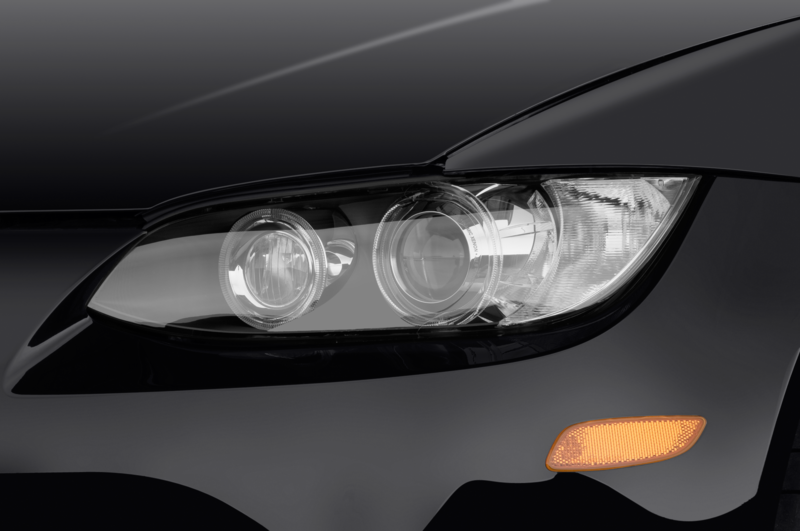 I’m absolutely smitten with the front fascia; the curved fenders, rakish hood, and furrowed headlamp brow look both menacing and muscular at the same time. 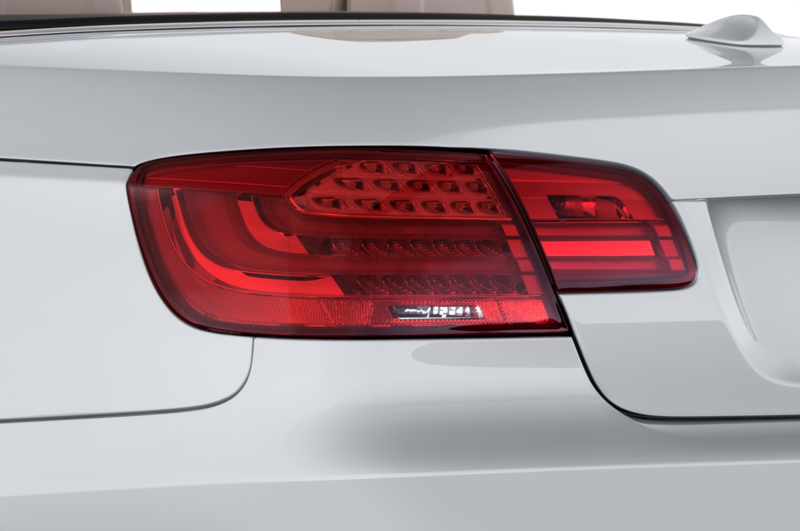 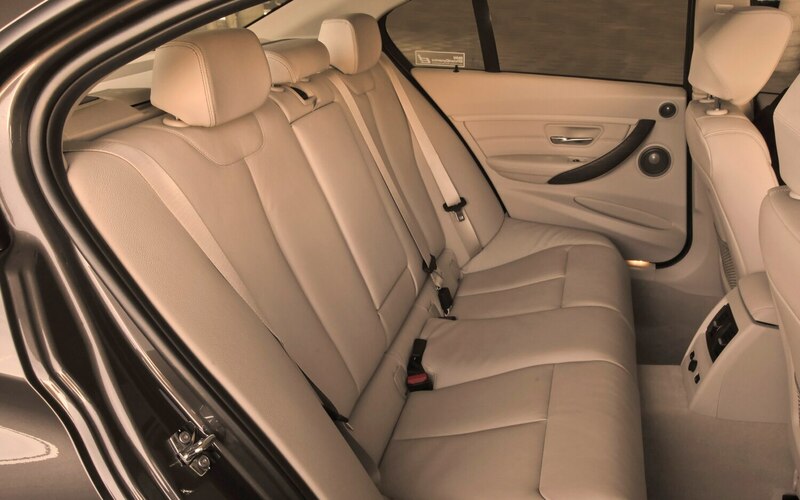 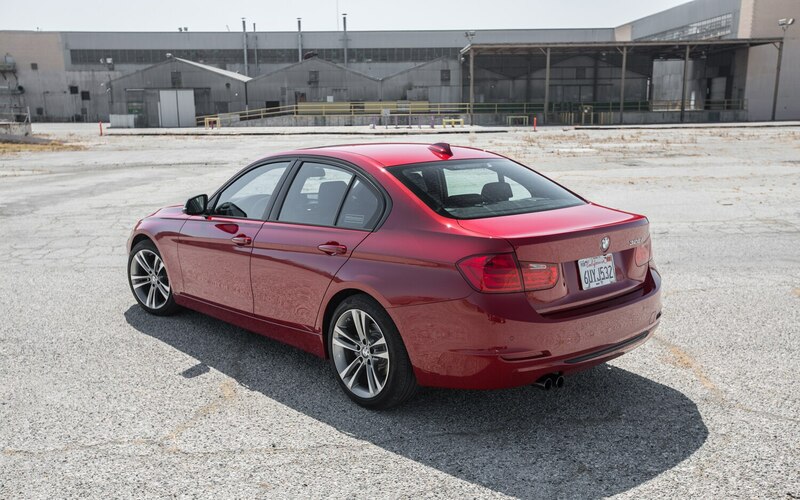 I’m also surprised at how much of a difference BMW’s new styling lines affect the exterior appearance: this Sport Line package is simple and – well, sporty – while the Luxury Line package our 328i wears makes the sedan seem ornate and fussy. 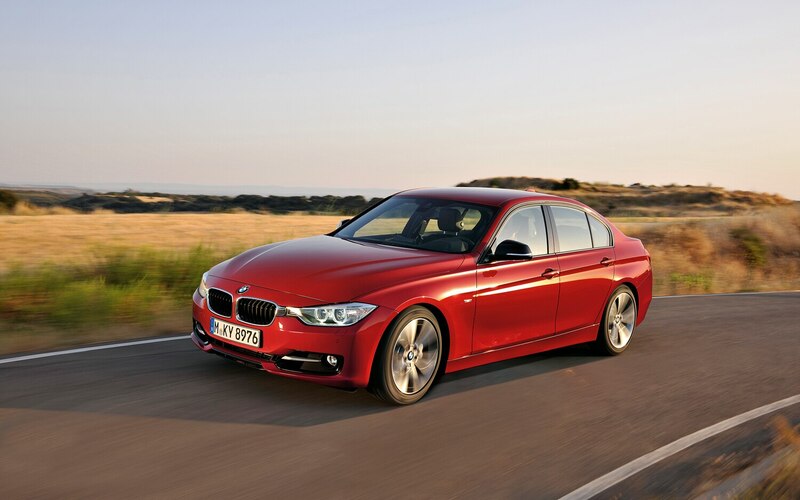 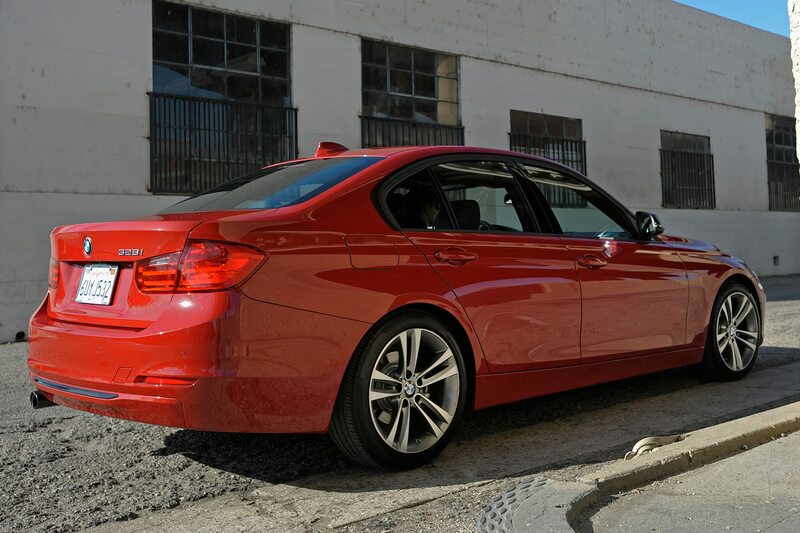 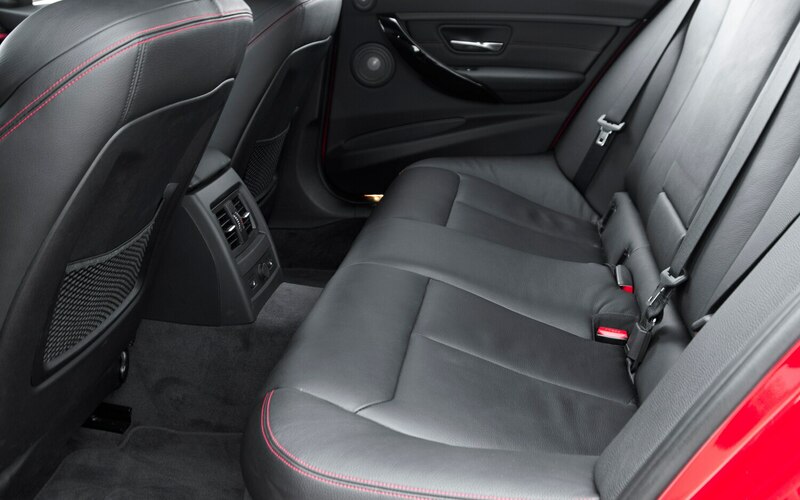 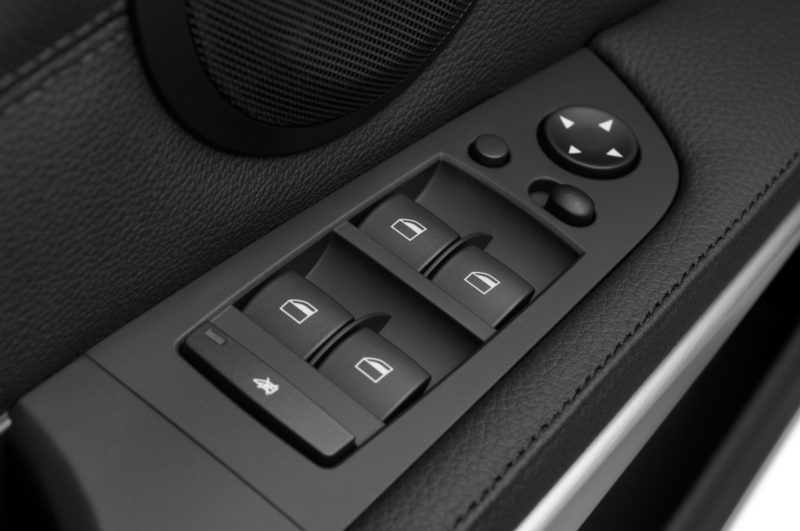 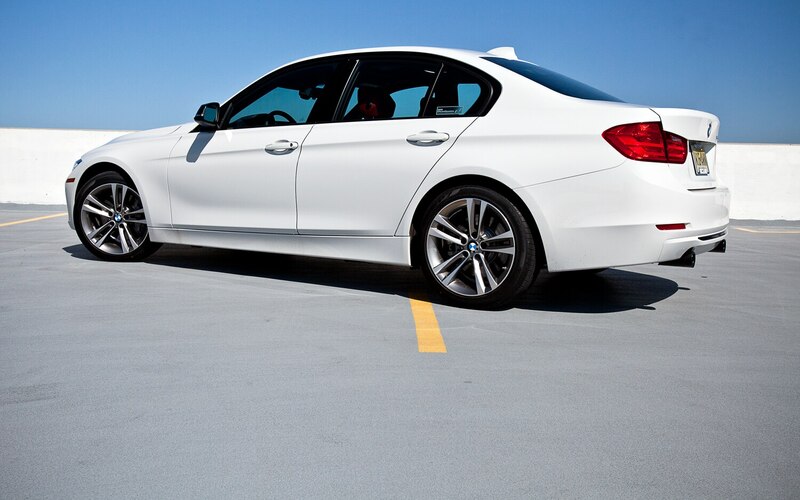 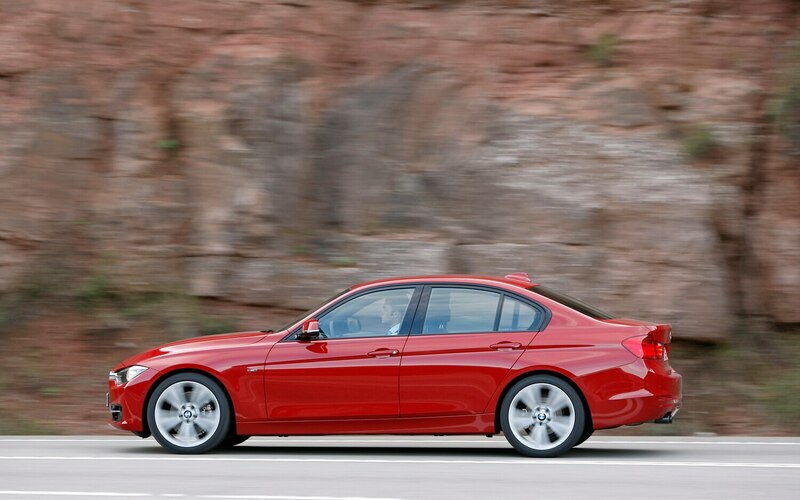 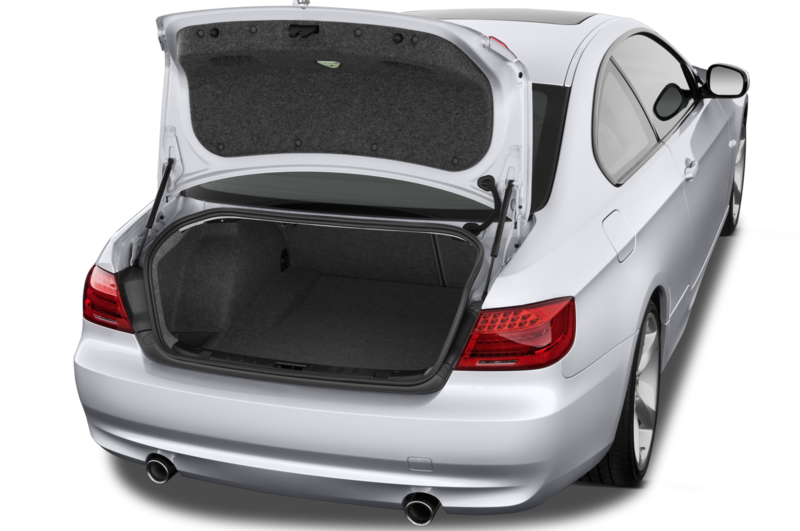 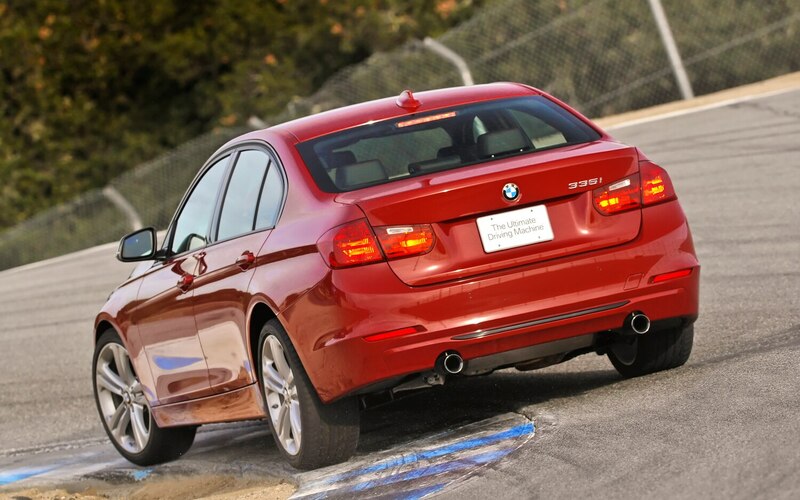 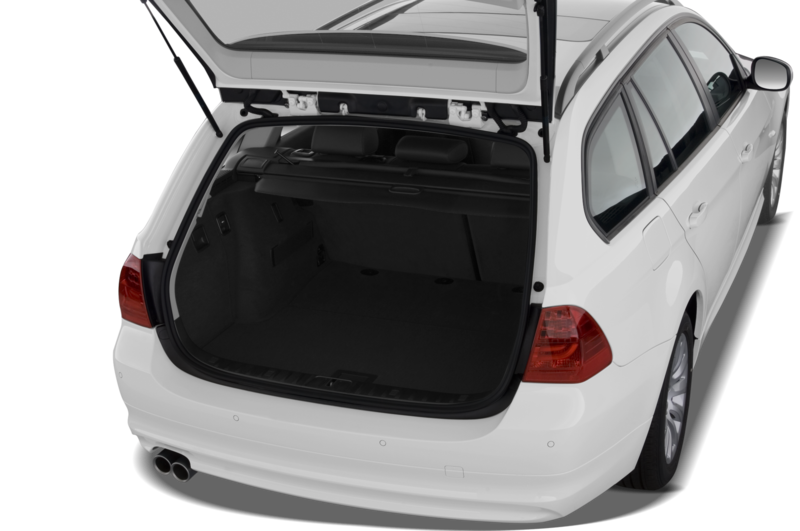 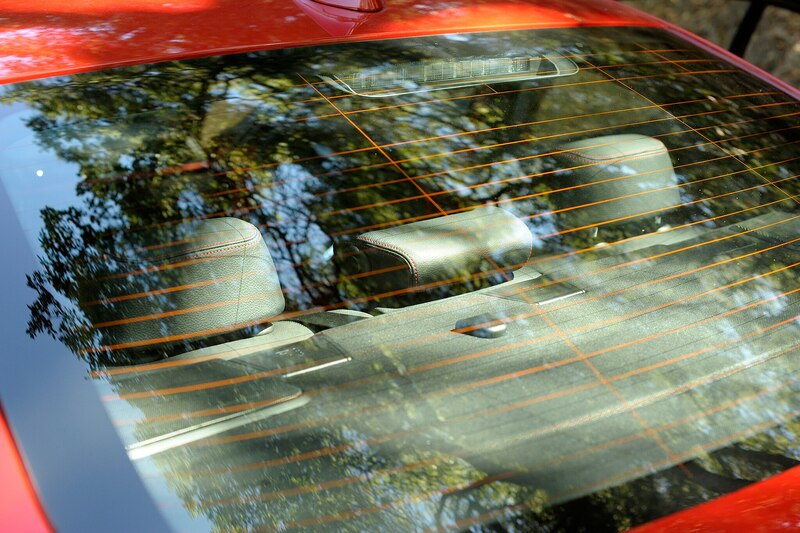 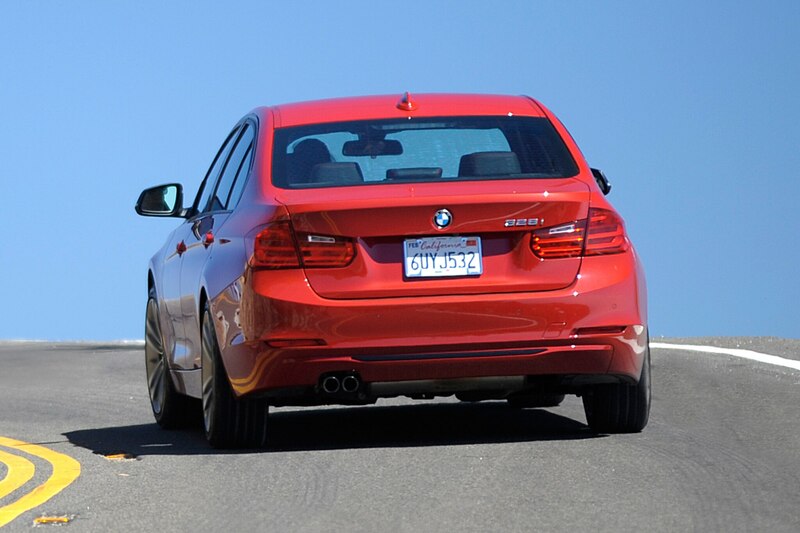 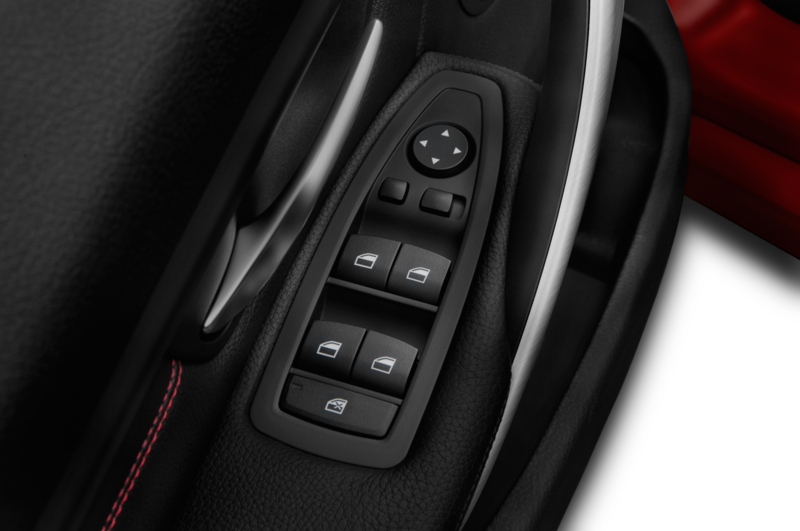 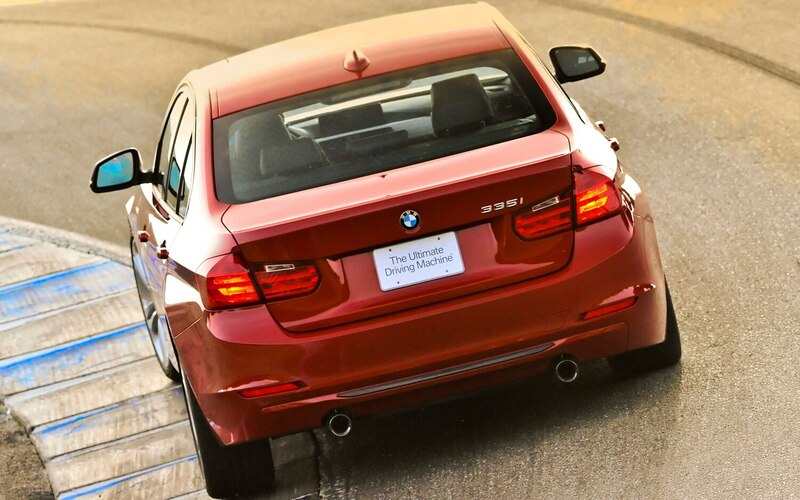 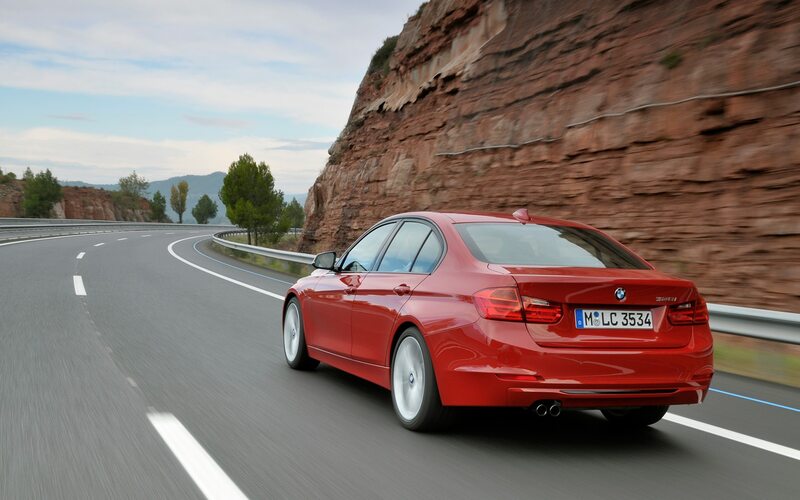 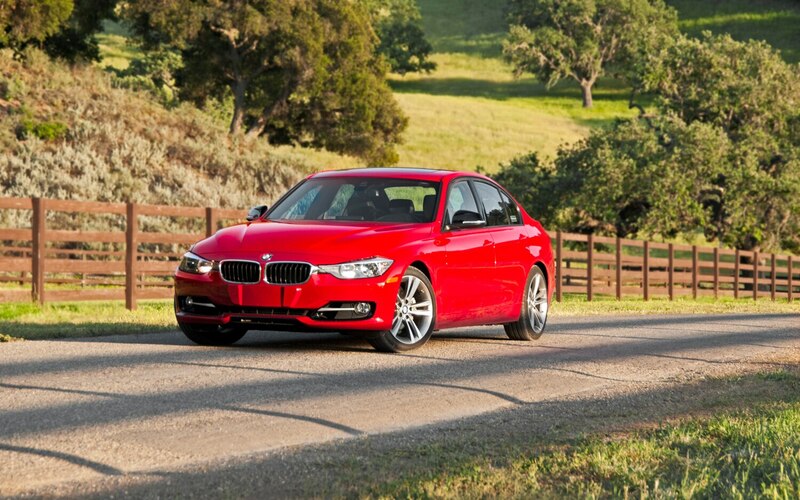 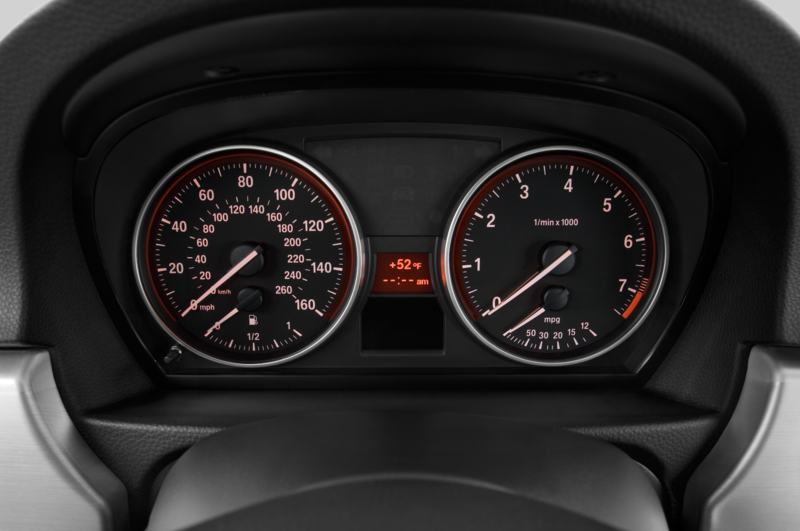 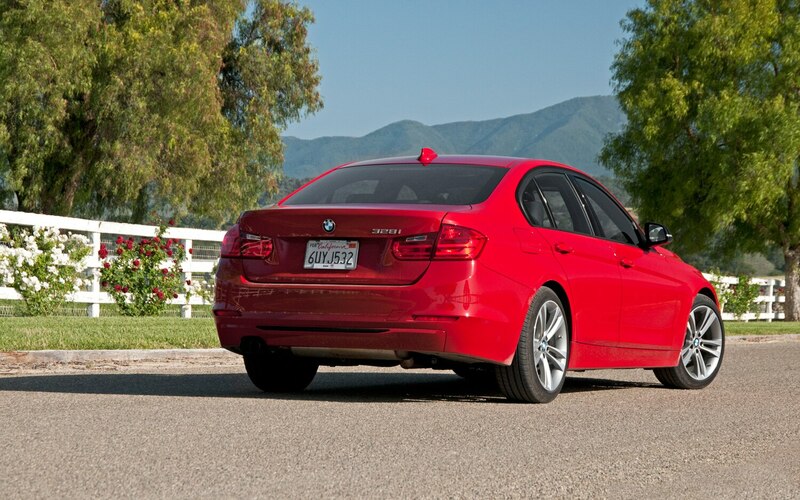 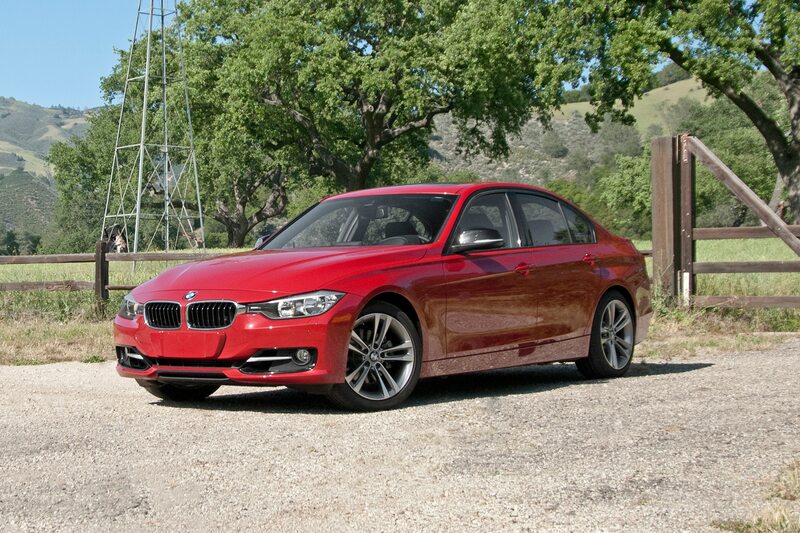 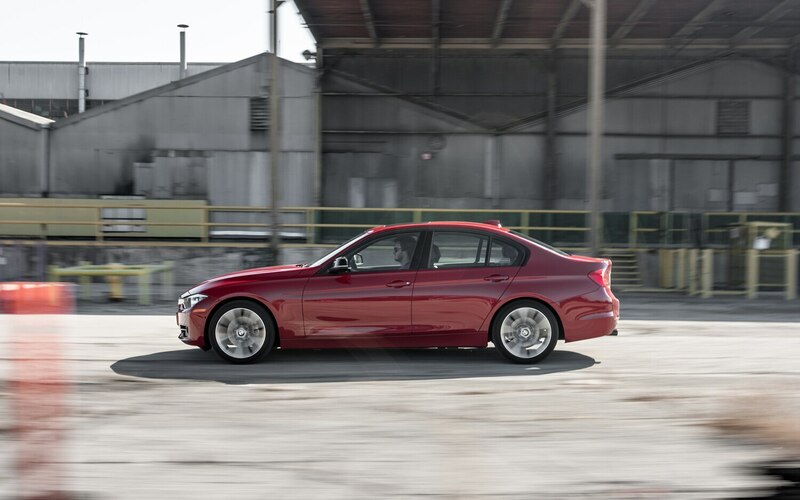 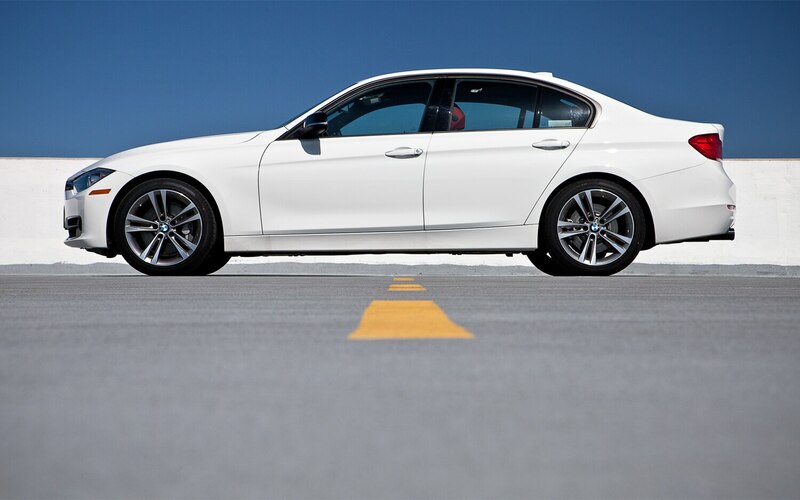 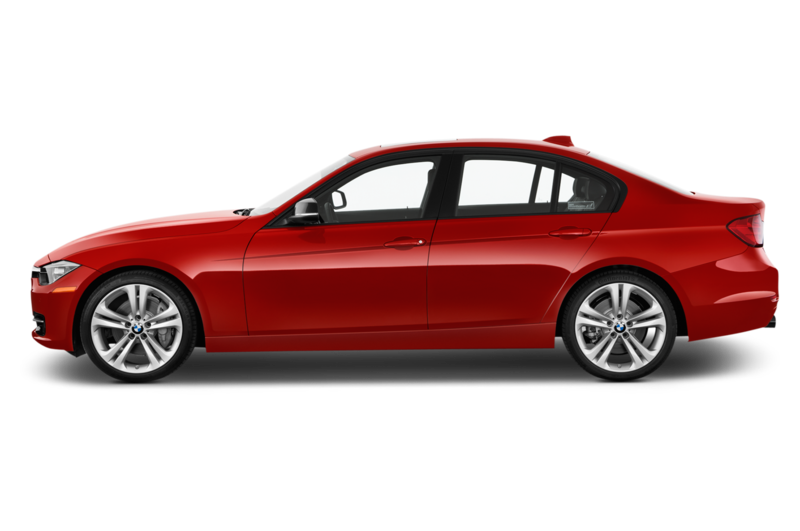 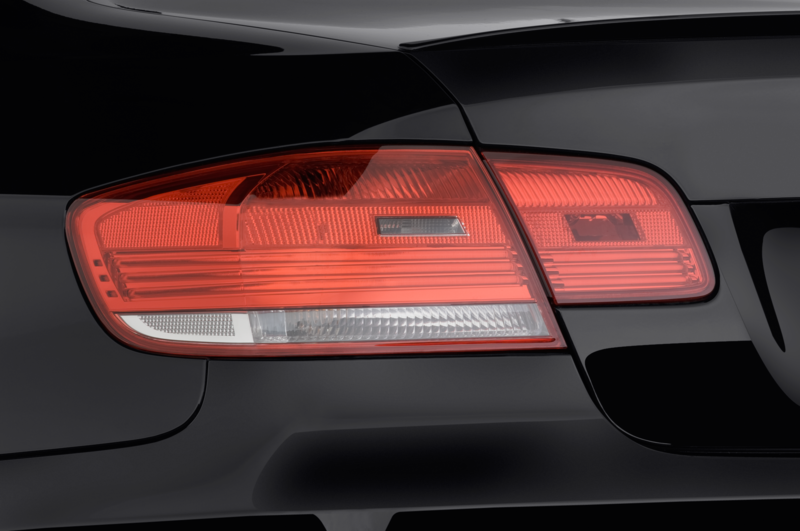 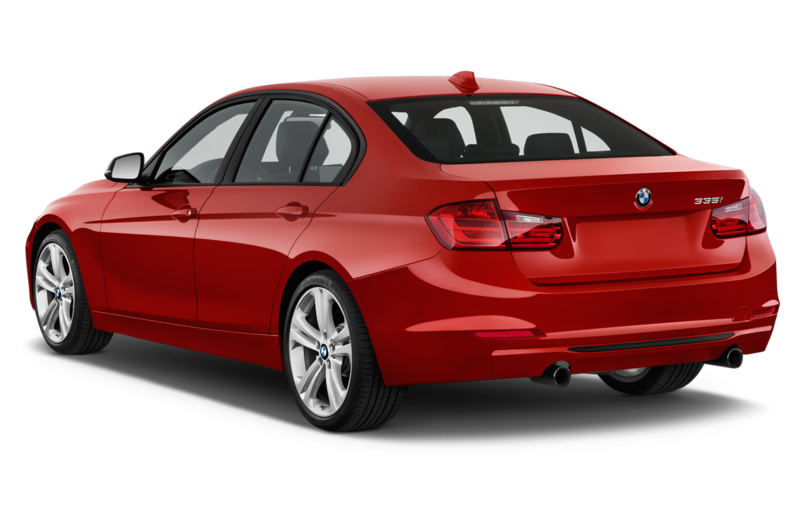 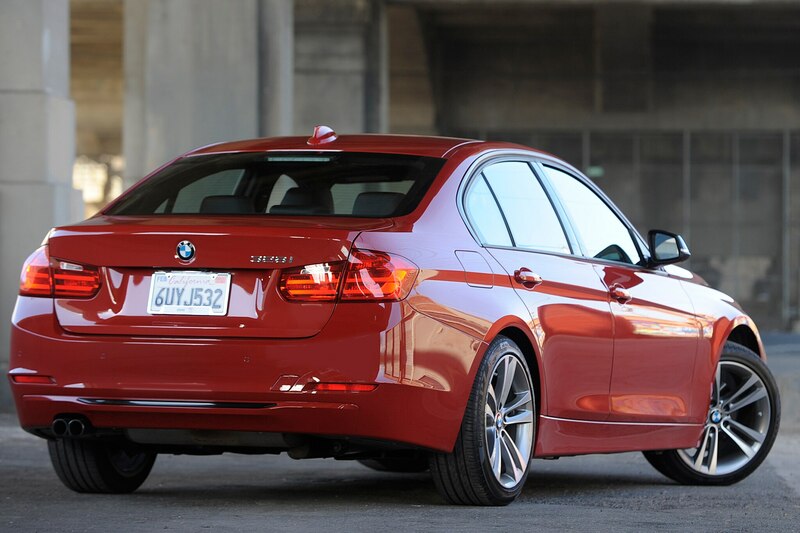 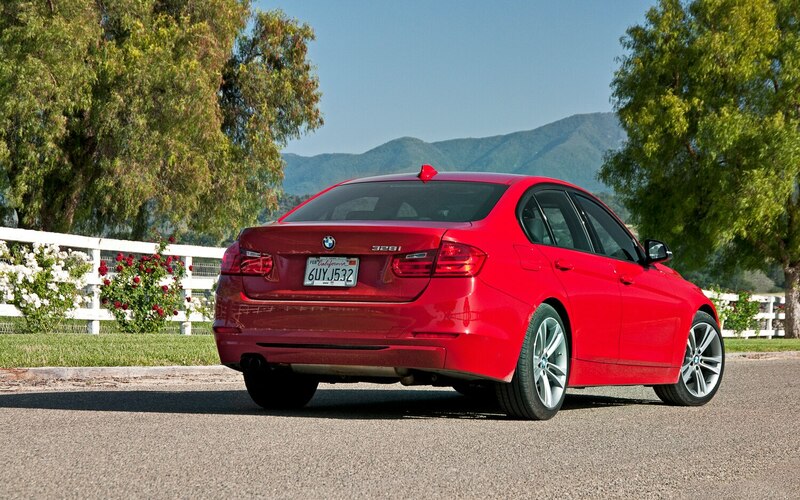 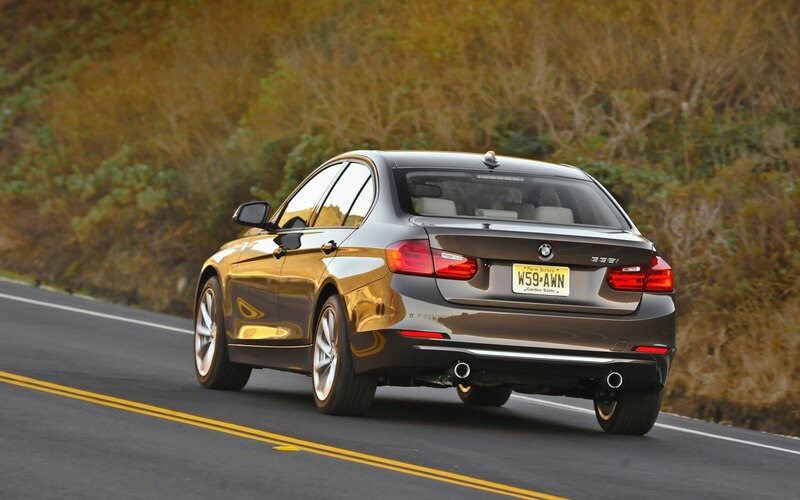 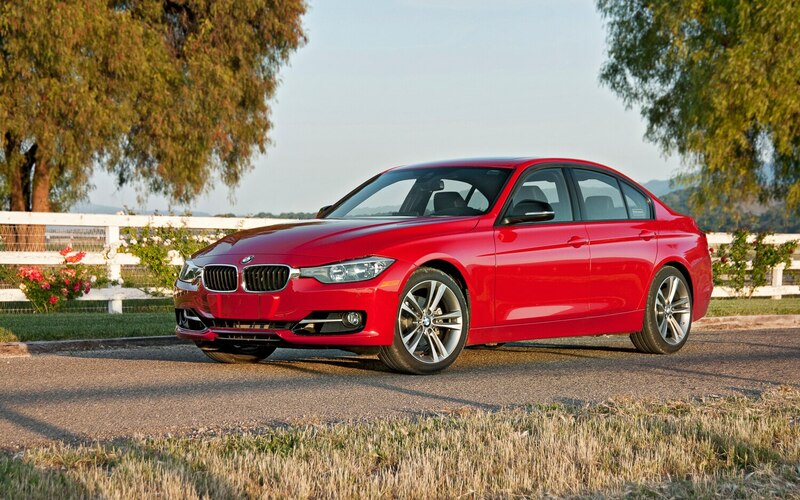 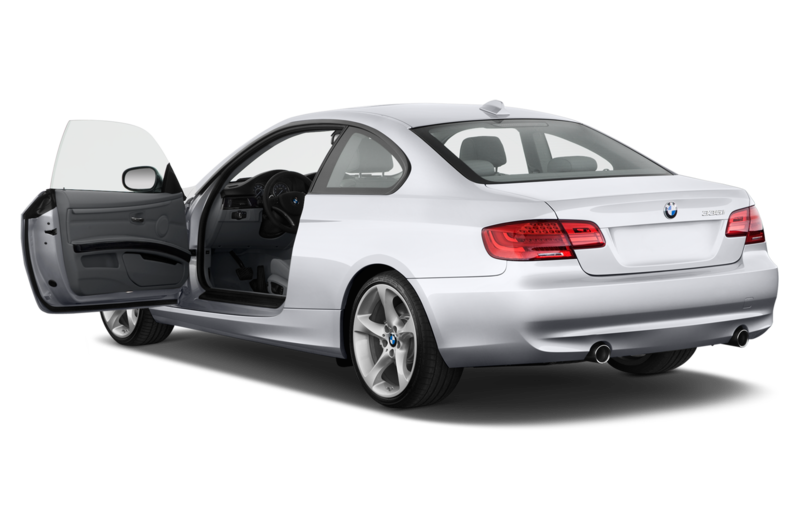 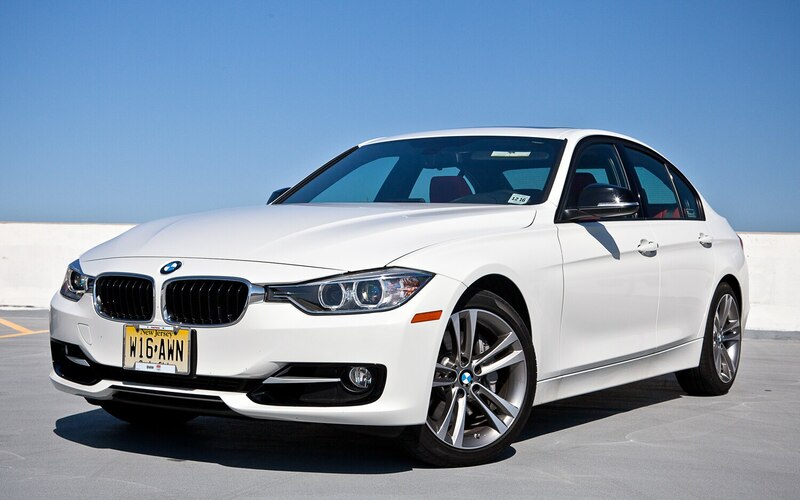 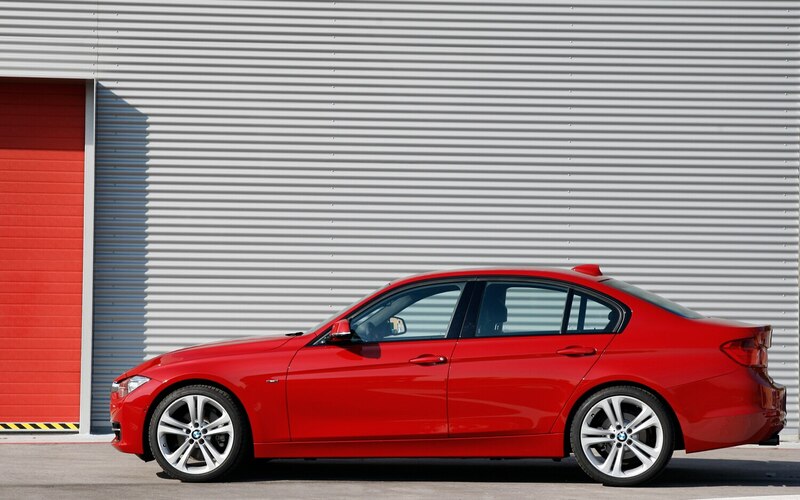 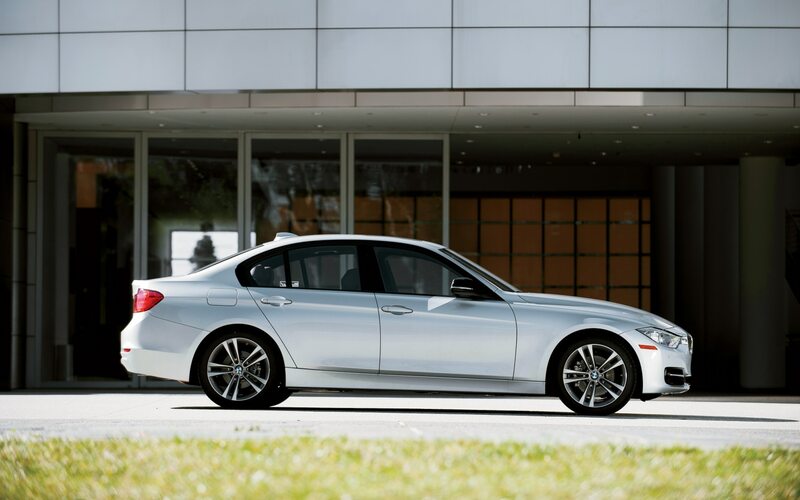 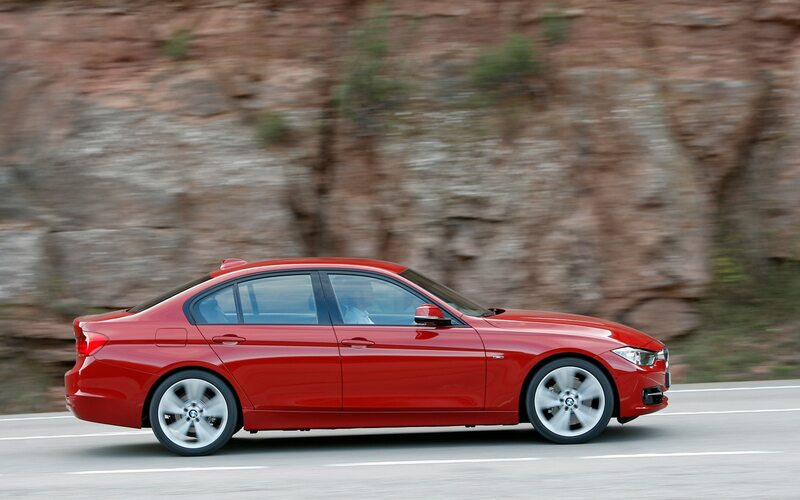 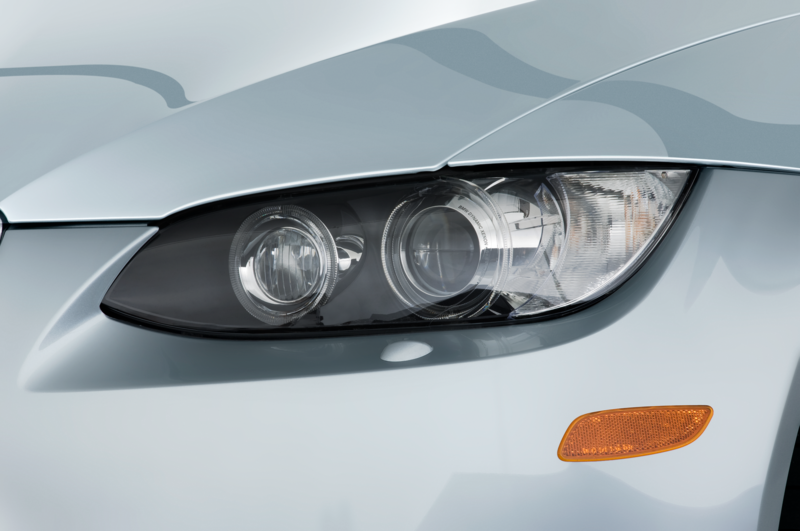 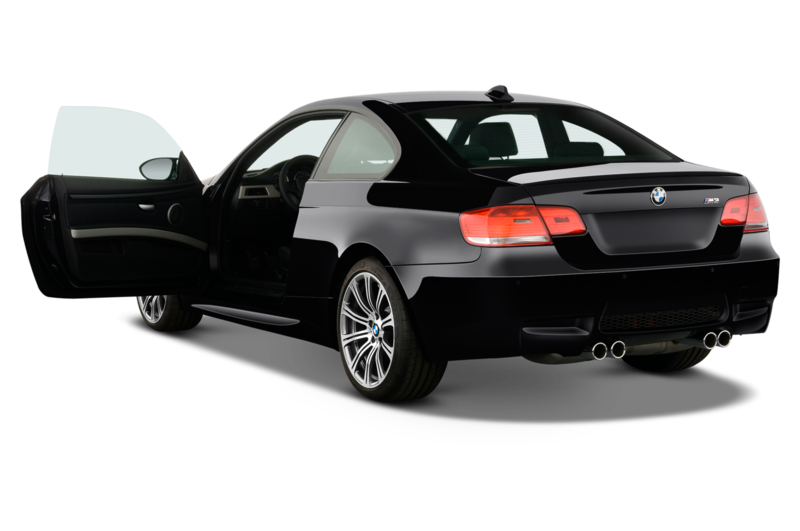 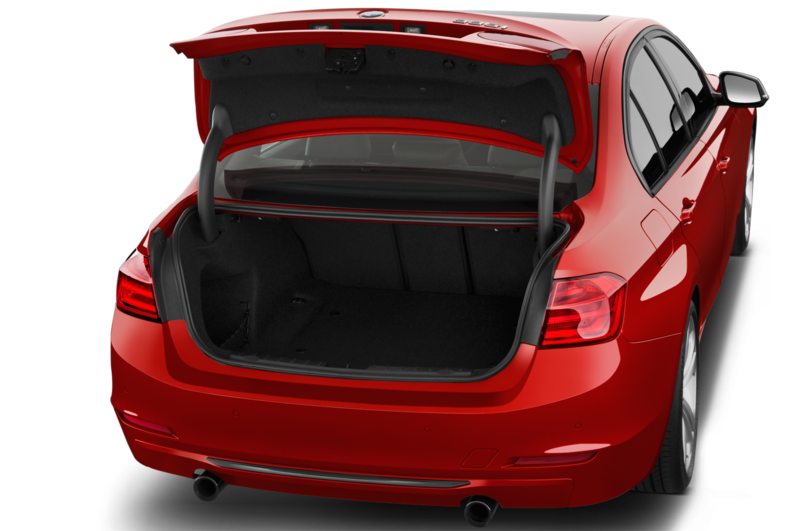 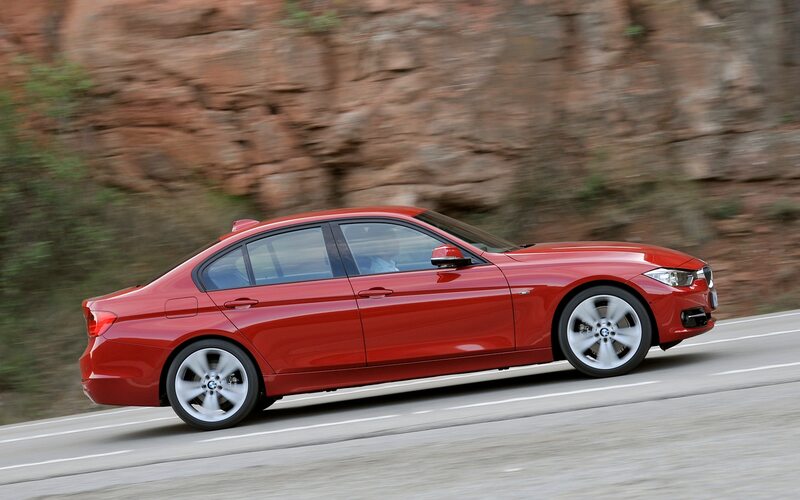 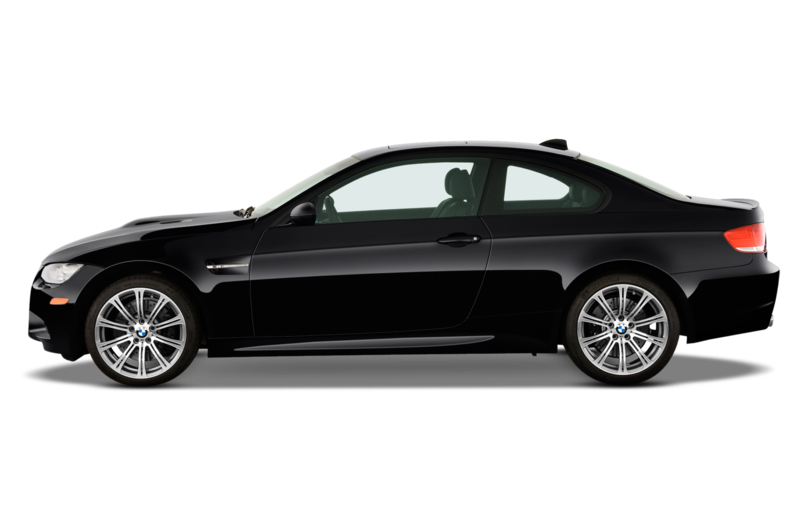 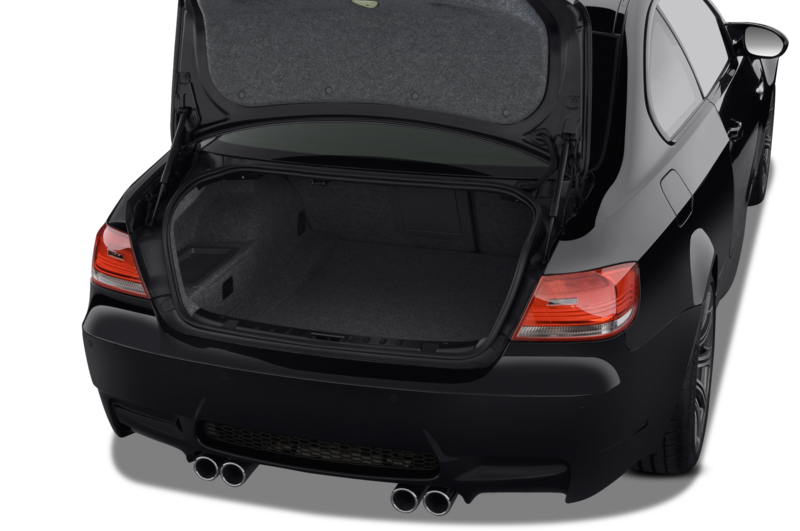 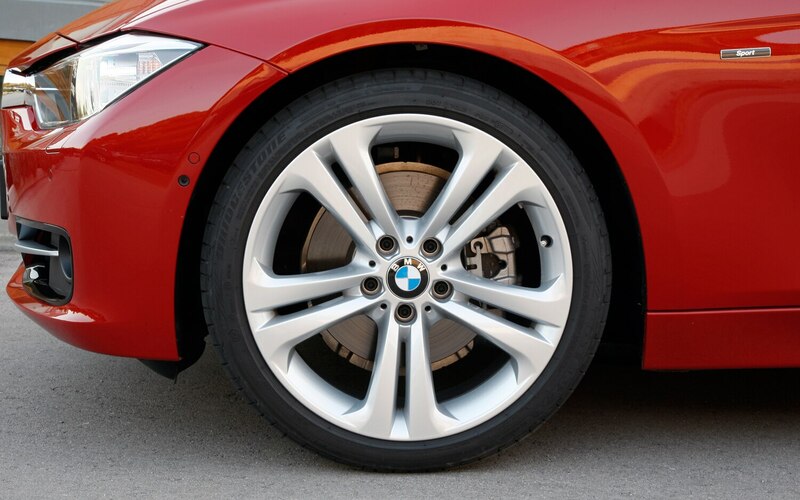 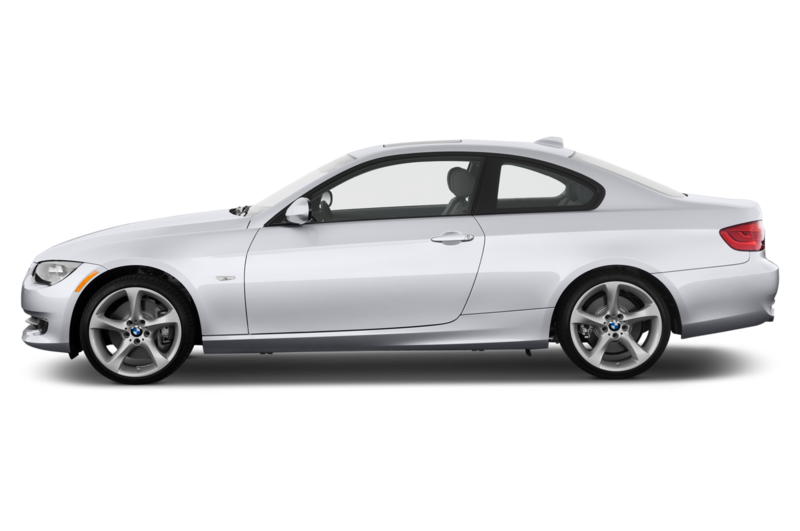 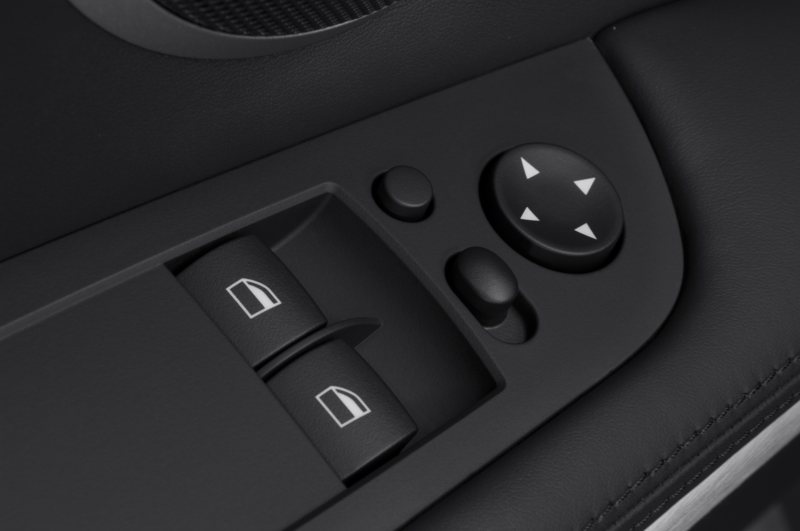 Although the exterior may break some new ground, the 335i’s mechanicals are best described as evolutionary. 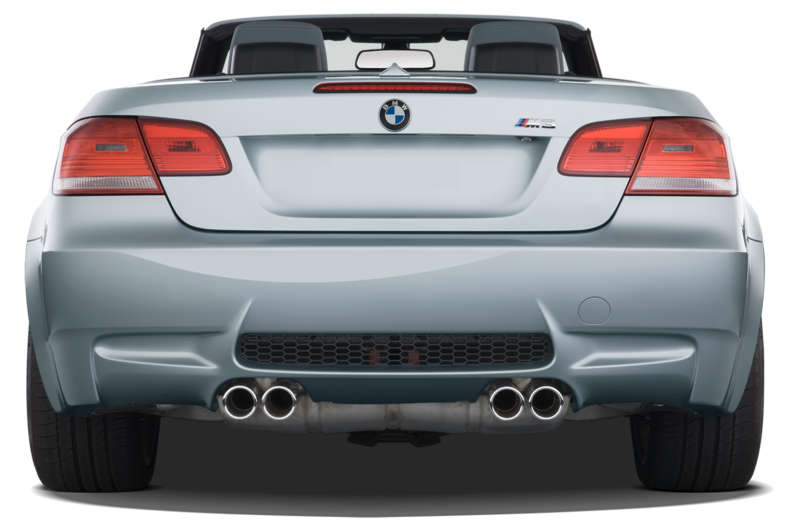 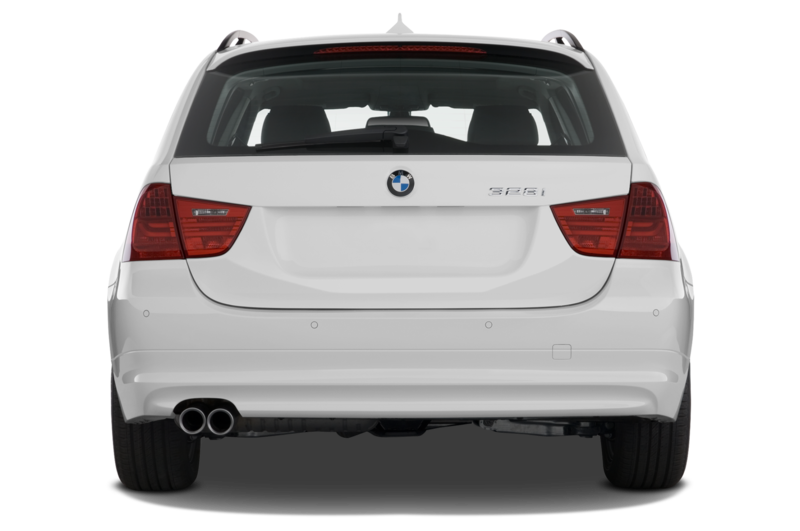 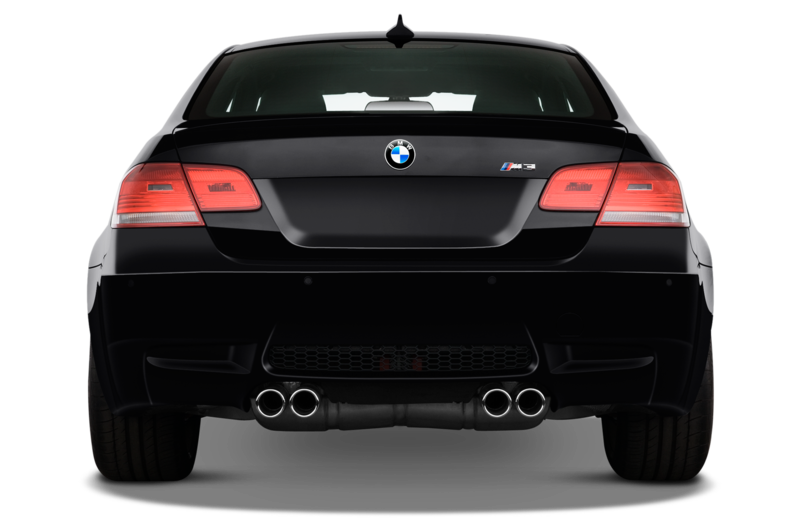 The turbocharged I-6 is one of the holdovers from the previous 3-series range, but remains as sweet sounding and powerful as ever. 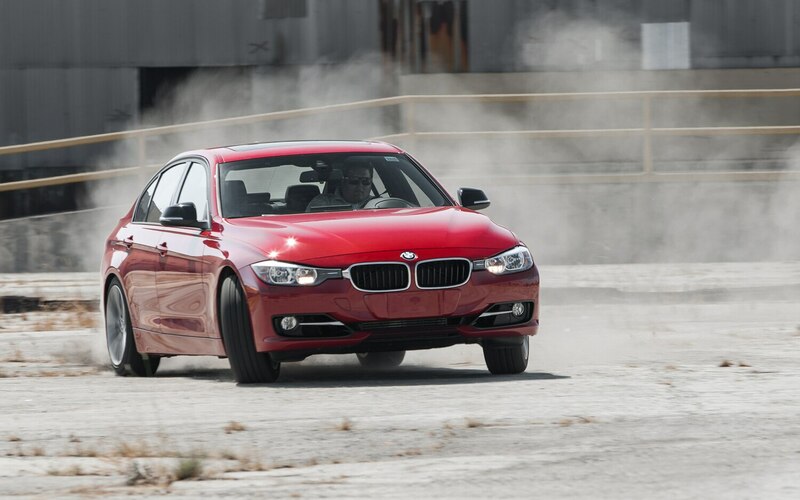 Arguably, the biggest break from the past may be how the car feels: the sport suspension isn’t as harsh as before, nor does the new power steering design provide as much feedback as previous models. 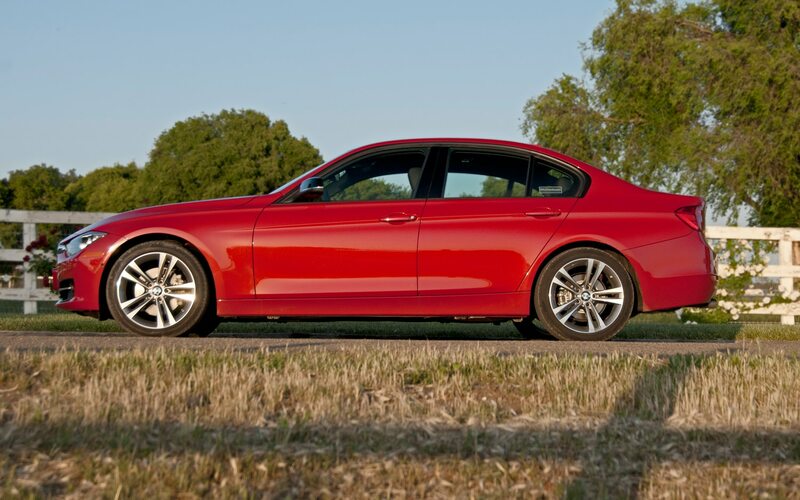 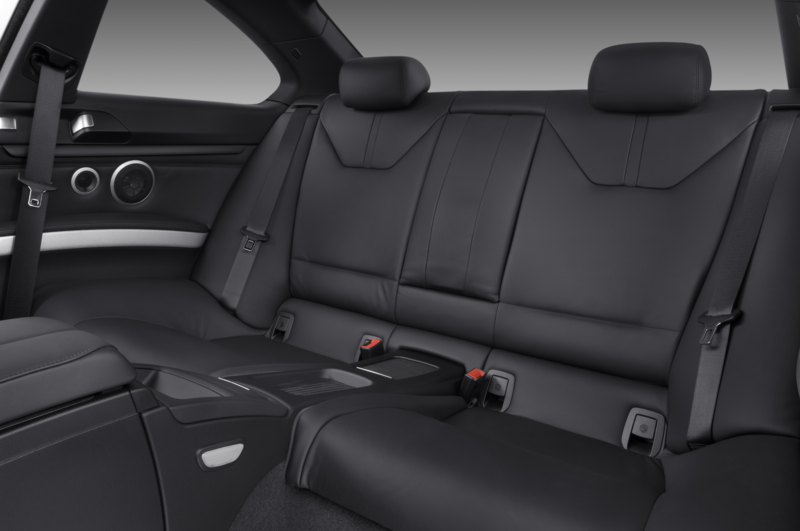 I have to agree with Jason – this does certainly feel more like a 5-series than a 335i. 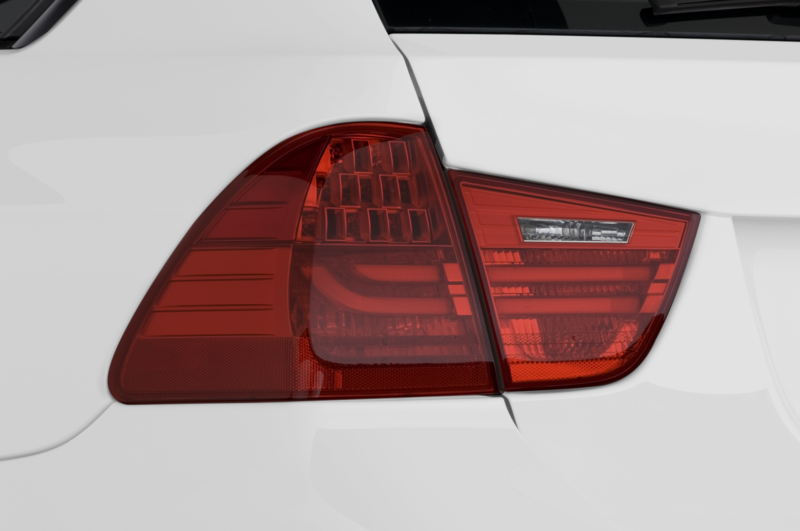 But does that ruin the car? 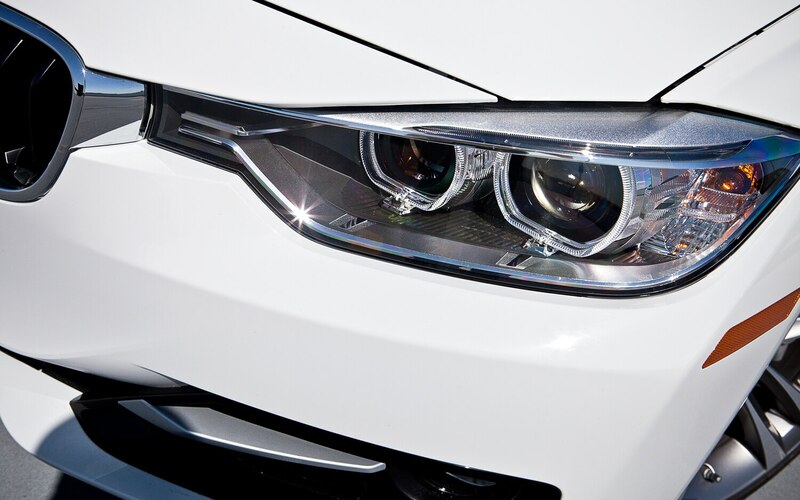 Not in my eyes. 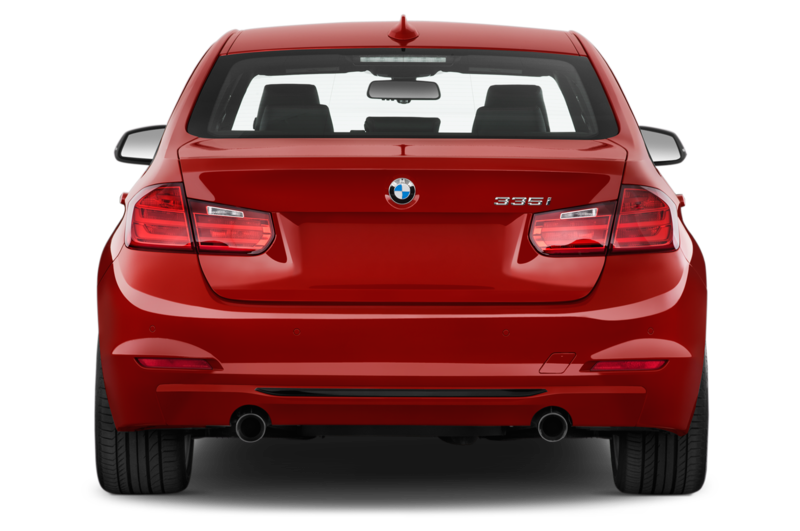 By and large, it’s still more agile and engaging than Audi’s S4, and it’s still an attractive, comfortable sports sedan.